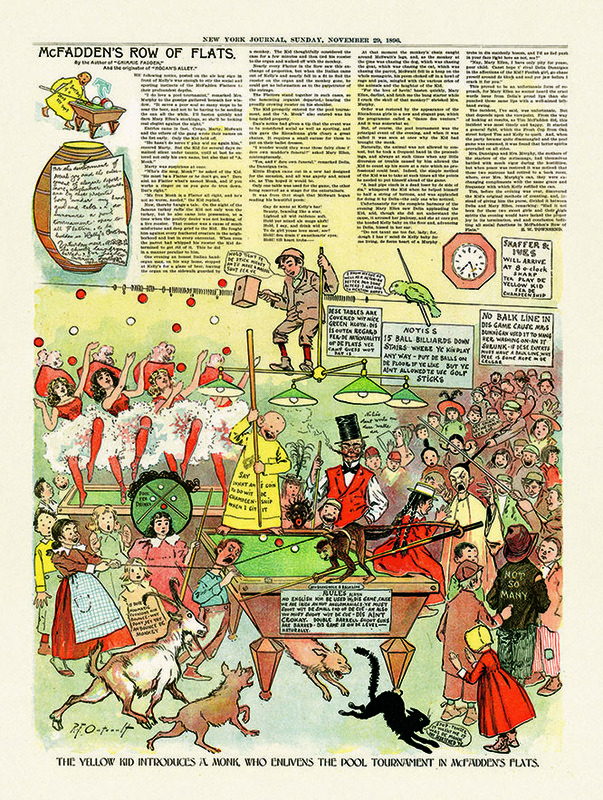 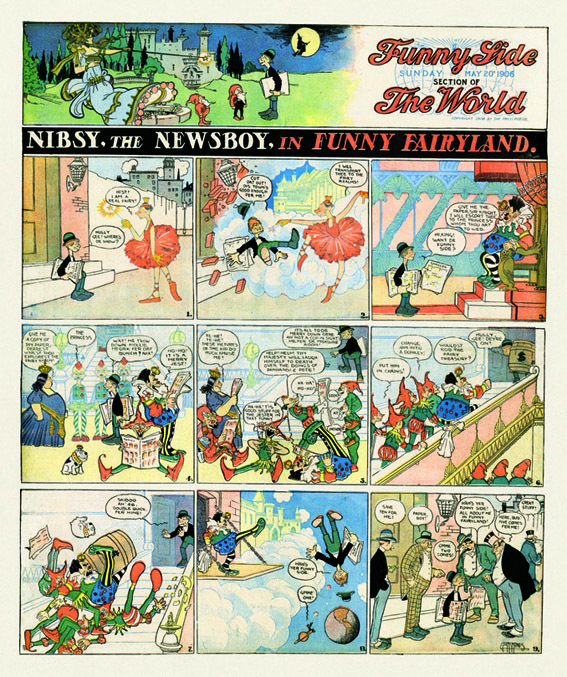 After the publication of the full-size Little Nemo in Slumberland, the big question for Sunday Press Books was, "What's next?" 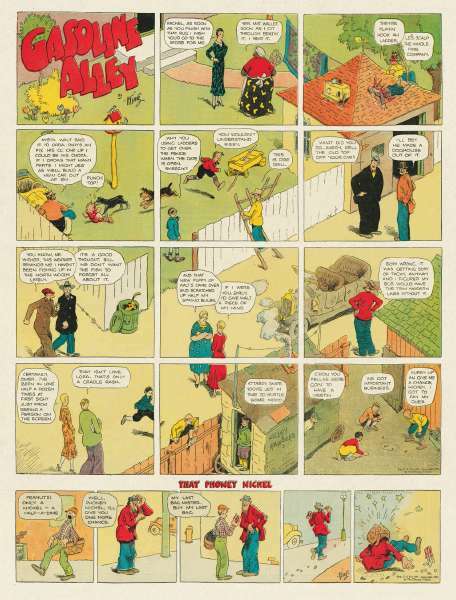 Many other comic strips deserve the full-size treatment, but the obvious first choice was the early years of Frank King's Gasoline Alley. 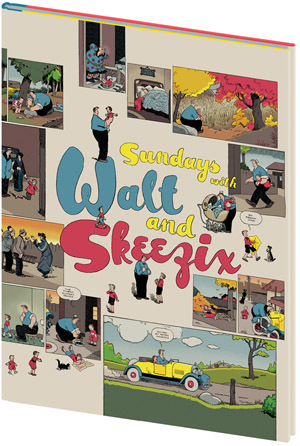 I had always enjoyed these Sundays with Walt and Skeezix, particularly those dream and fantasy strips that owed obvious thanks to Nemo. 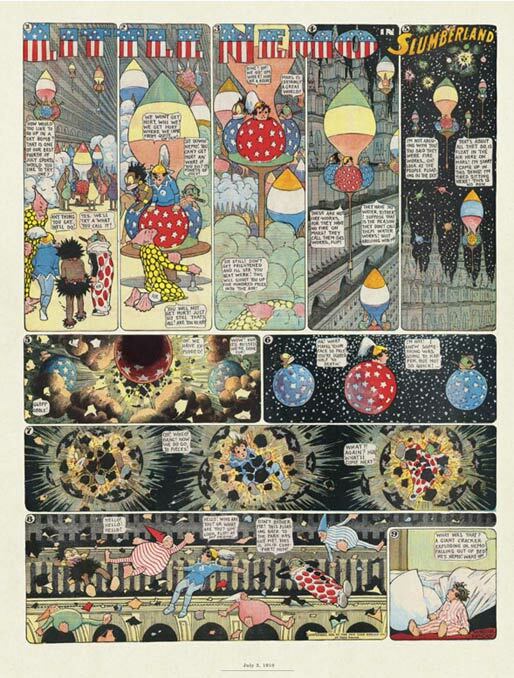 But after taking on this project I realized that the true beauty in these comics went beyond those remarkable fantasy and surrealistic pages. 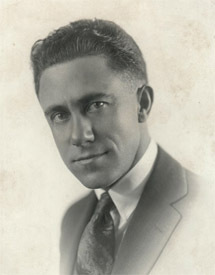 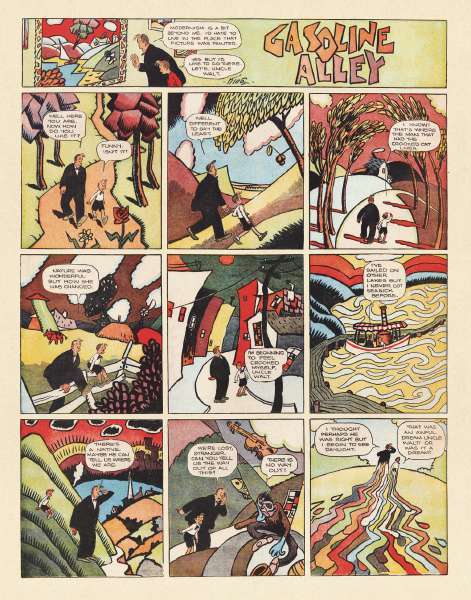 Like McCay, Feininger, Herriman, and others of that era, King was a graphic innovator. 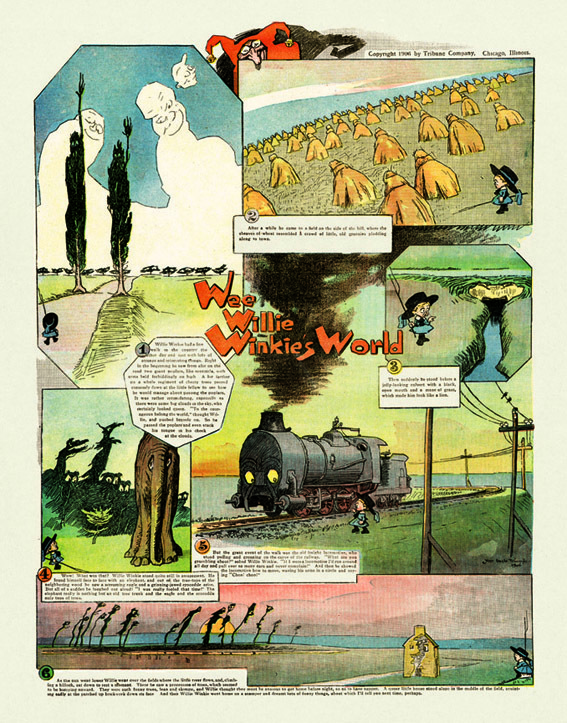 His panoramic layouts, themed styling, and whimsical cartoon conceits explored new artistic methods. 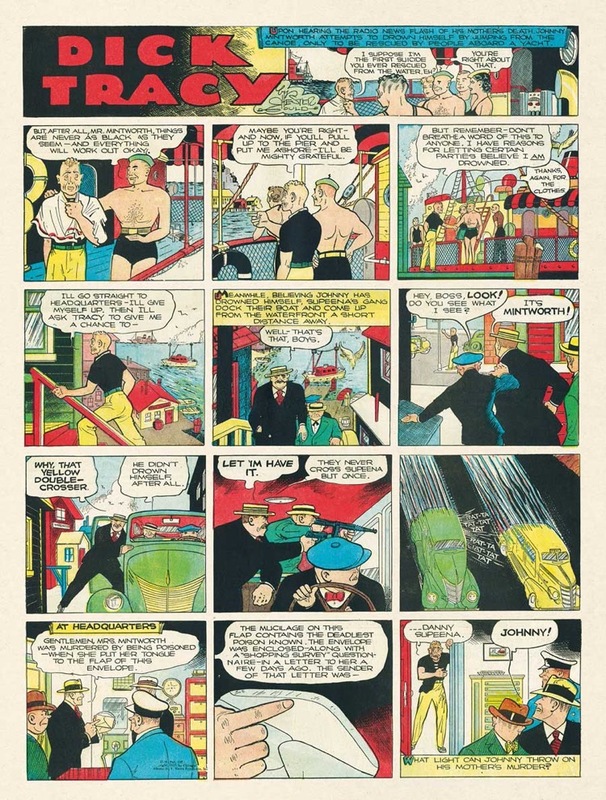 But he also had a great knowledge of story and character, presented with a warmth and humanity never seen before in comics, and rarely done as well since. 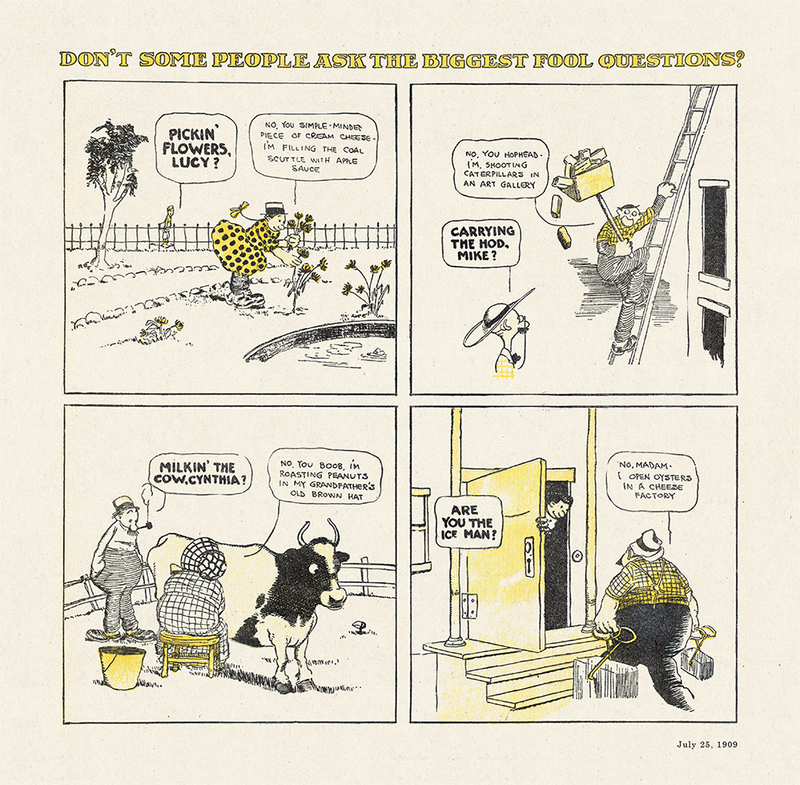 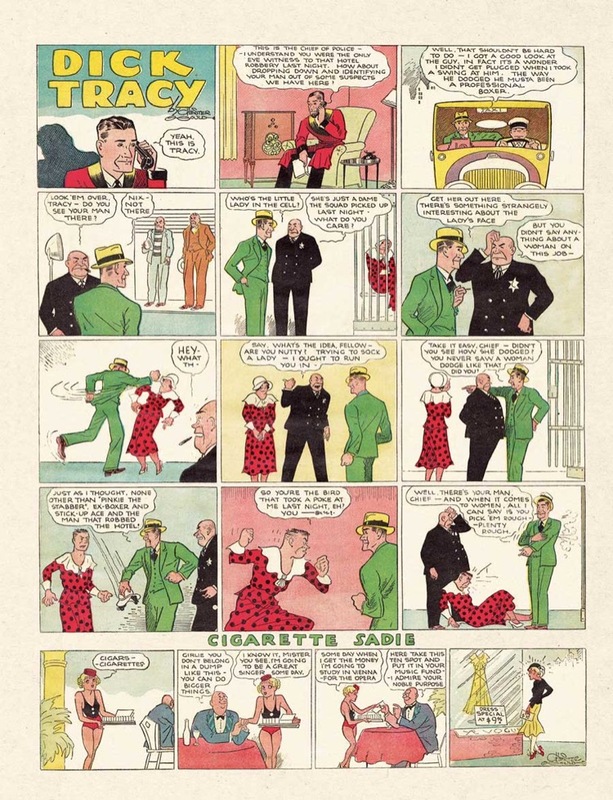 He went beyond the gags and slapstick of his contemporaries to create vignettes of genuinely human characters; showing them relating to each other and, particularly in his Sunday comics, to the world around them. 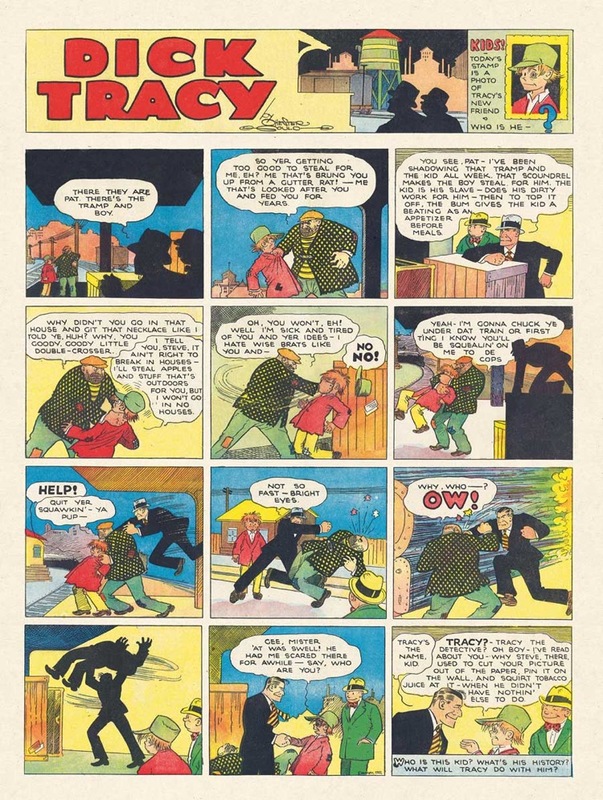 A true poet of the form, Frank King offers us the ideal comic: the simple lines and concise vernacular that reach deep into the heart and mind of the reader. 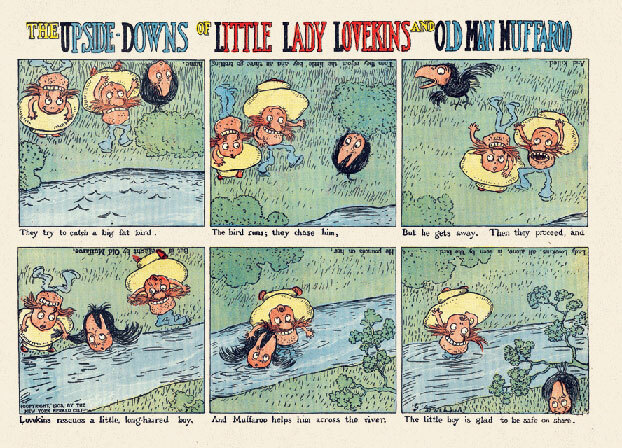 And such wonderful small town tales! 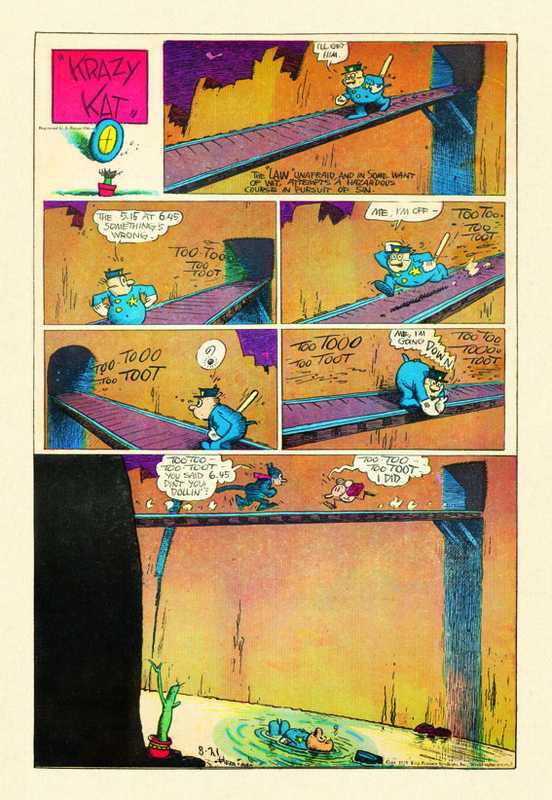 More than any comic strip of the period, Gasoline Alley is a time machine. 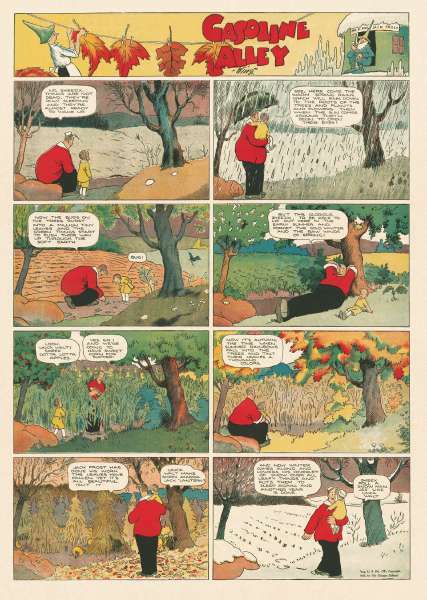 It transports us to another era, yet one filled with timeless messages: simple pleasures of childhood, dreams and fears of parenting, appreciation of the natural beauty of the world. 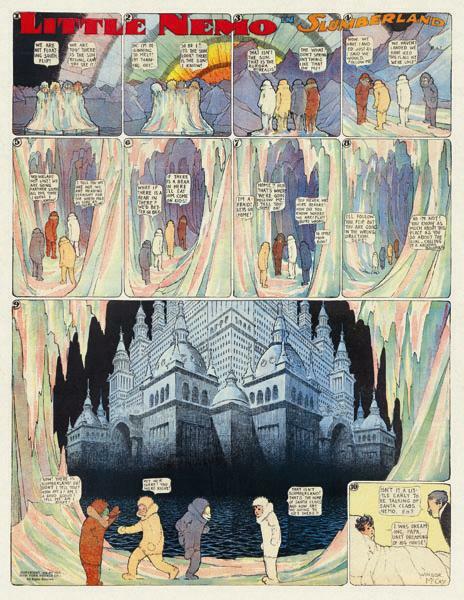 And King not only takes us there, but invites us, often directs us, to pause and ponder. 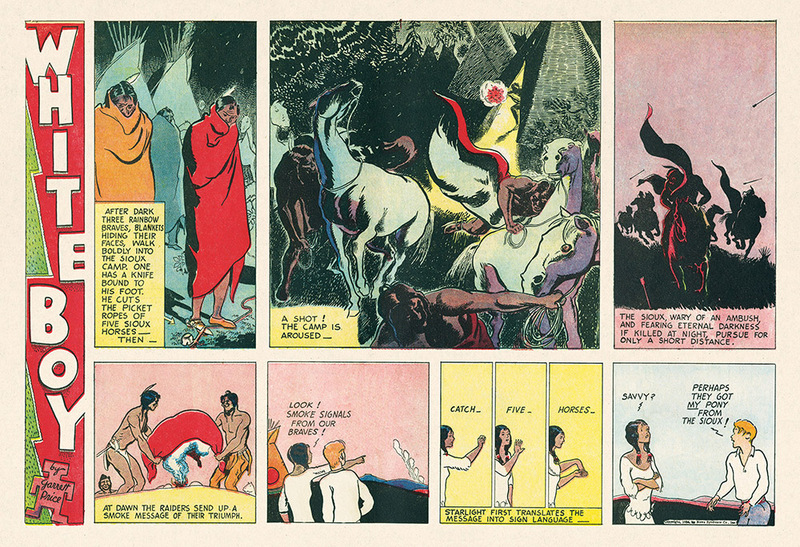 And there is no better way to receive his stories and characters than in their original size and colors. 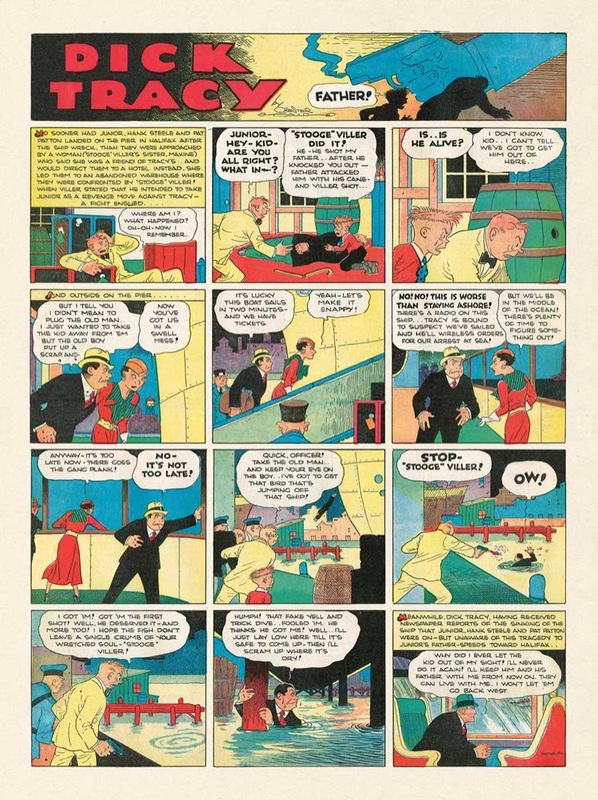 This volume strives to re-create the Sunday morning comic strip experience of 75 years ago. 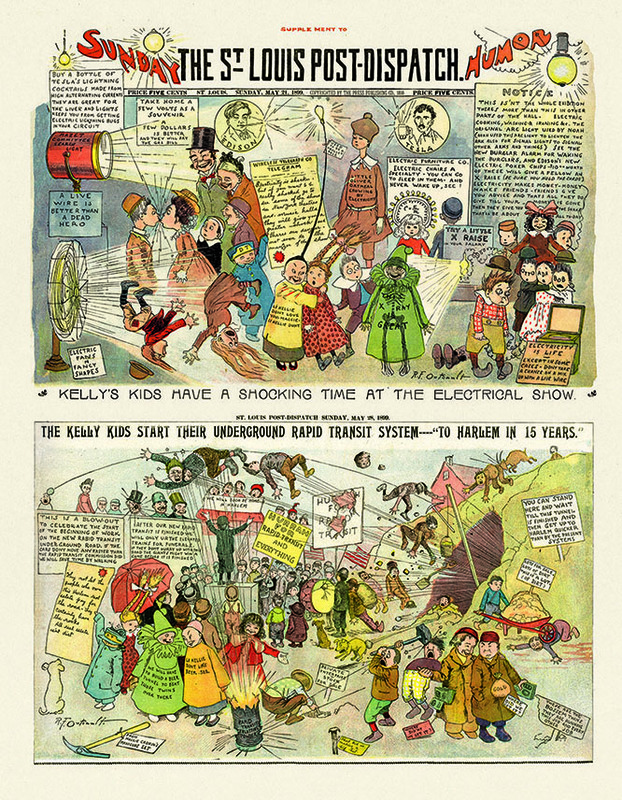 A book taking you back to when readers would lose themselves in a single page, sensing a reflection of their lives in this most colorful and ubiquitous form of that era's popular culture. 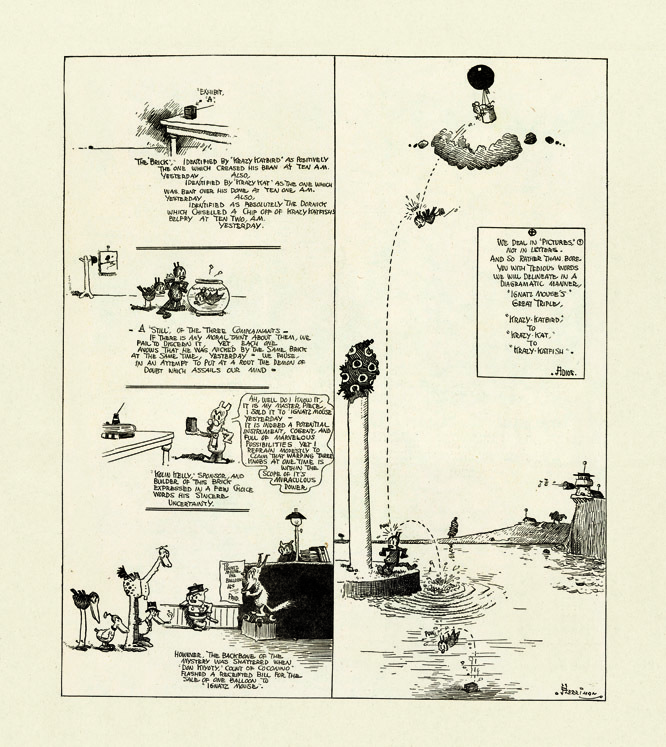 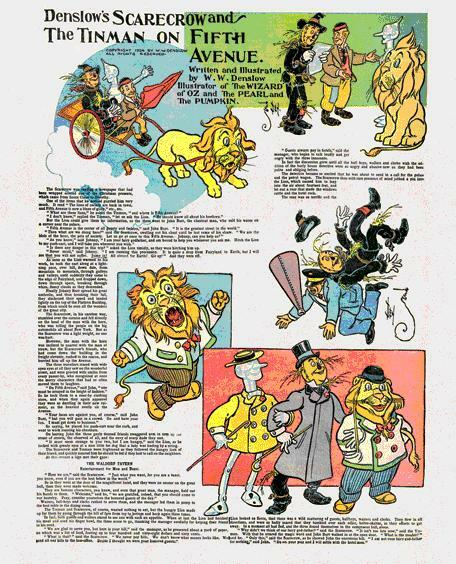 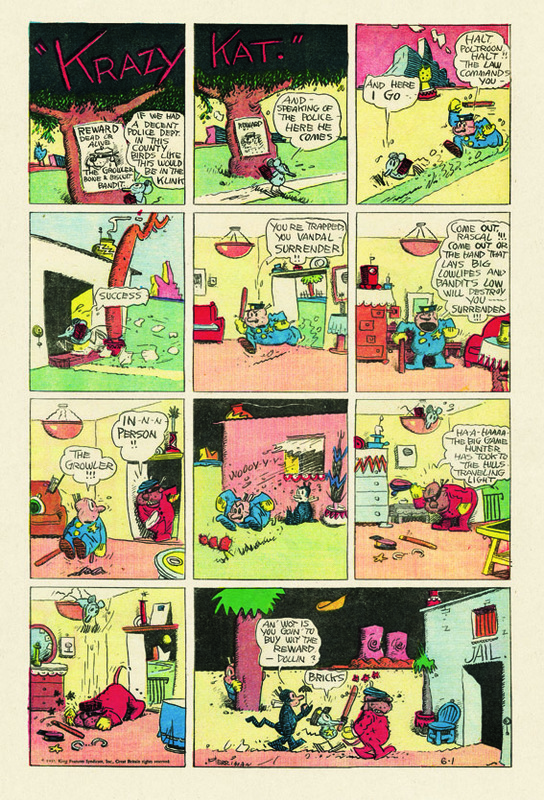 Here is a collection of the best examples of Walt and Skeezix in the first 15 years of Gasoline Alley. 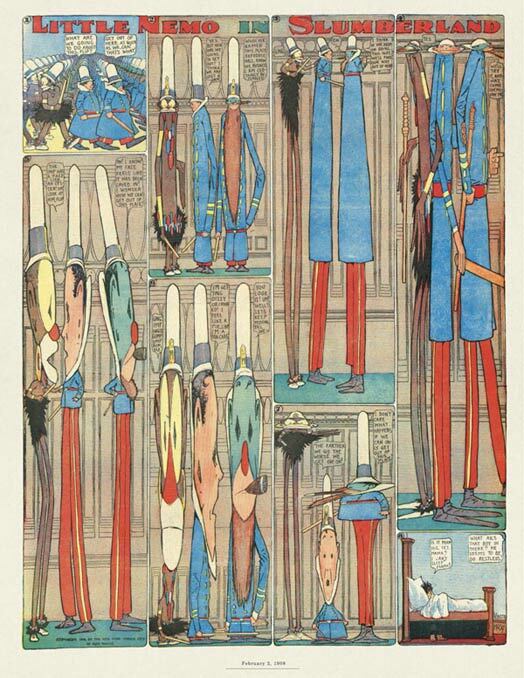 These are the favorites of the contributing editors and, we hope, those of King's many fans. 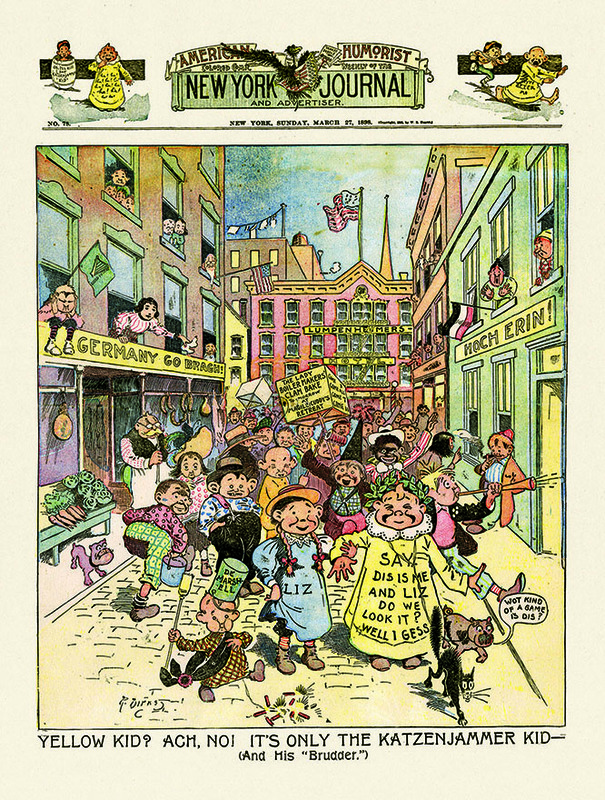 The pages in this book were taken from different Sunday newspapers around the country, often with varying colors and printing formats. 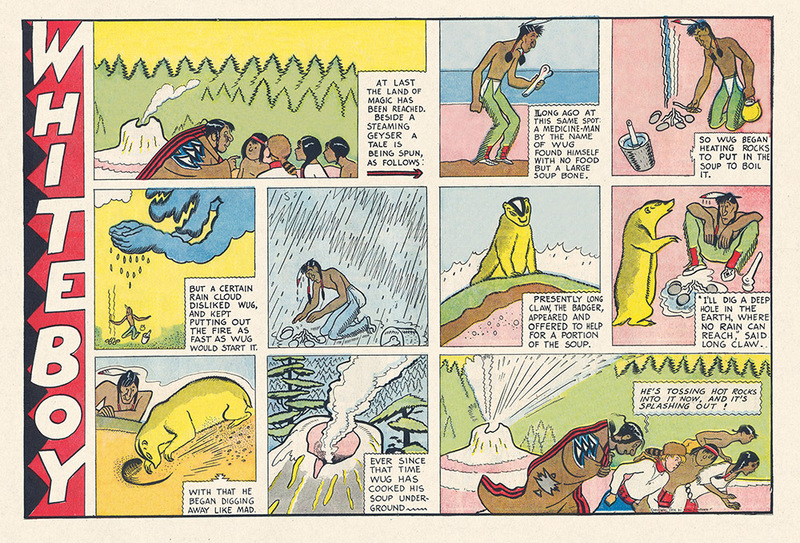 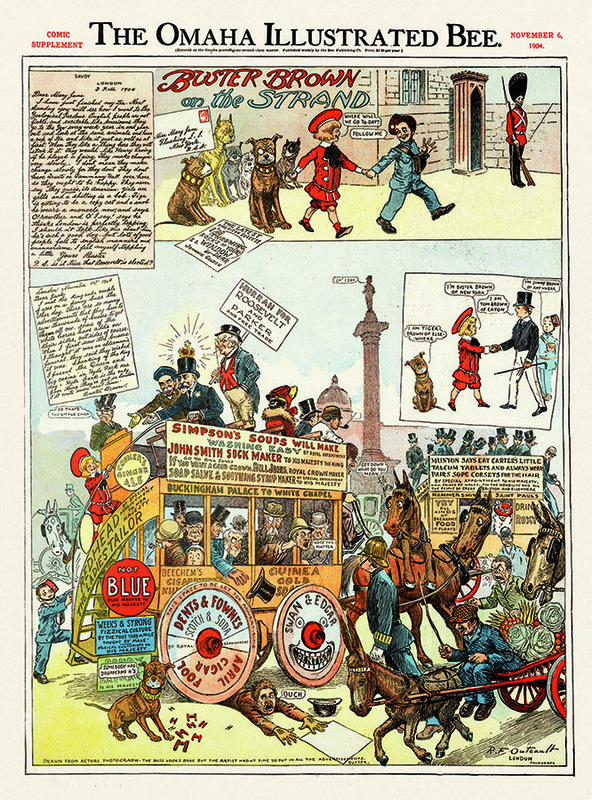 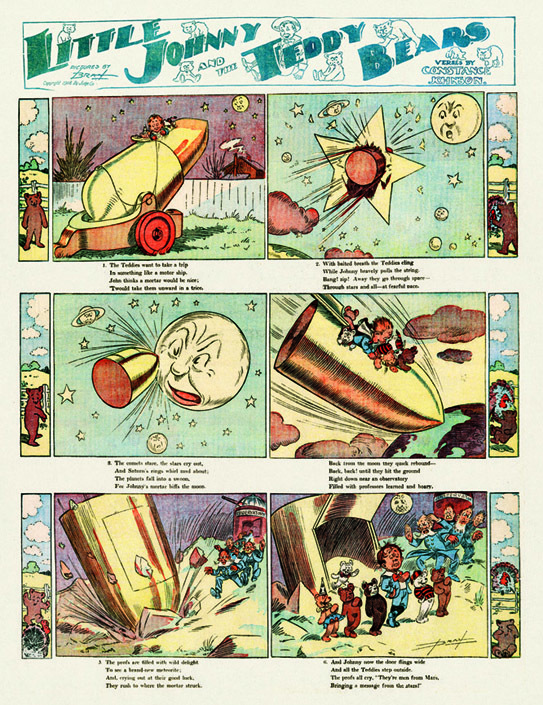 The restoration task was to reproduce the comics for a consistent and accurate presentation. 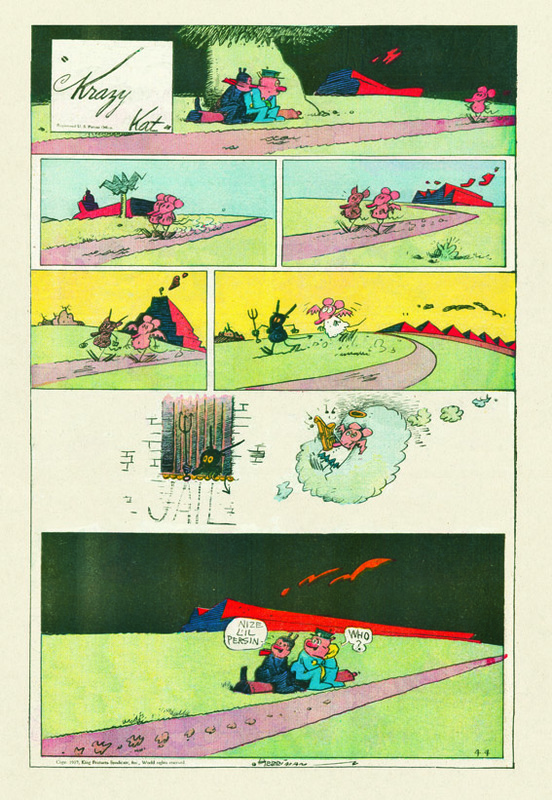 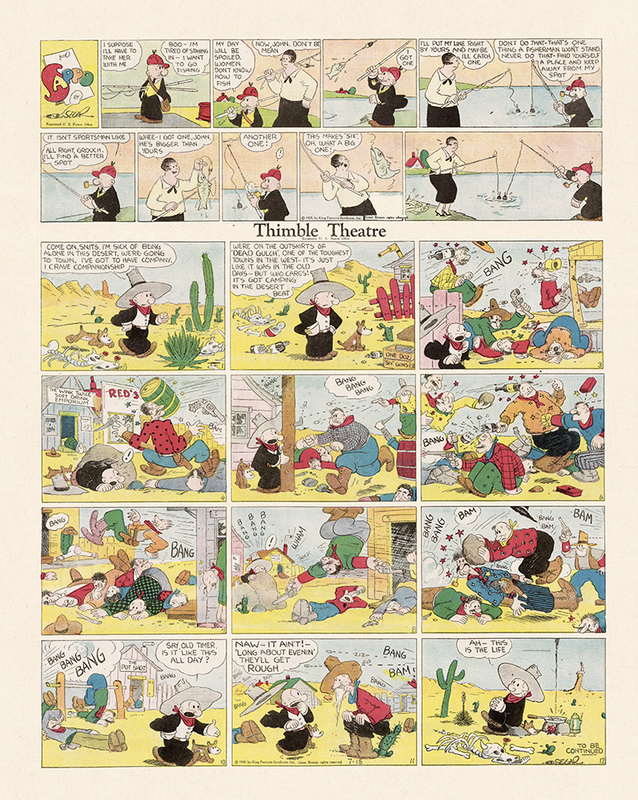 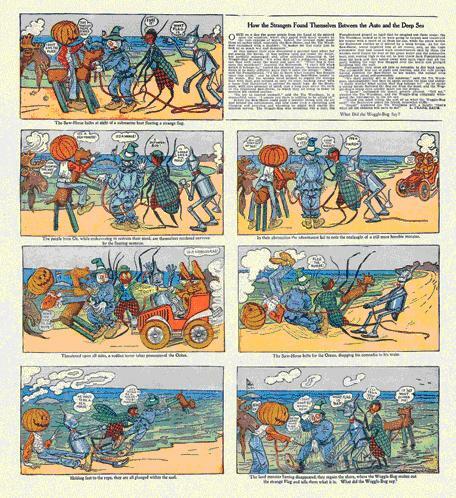 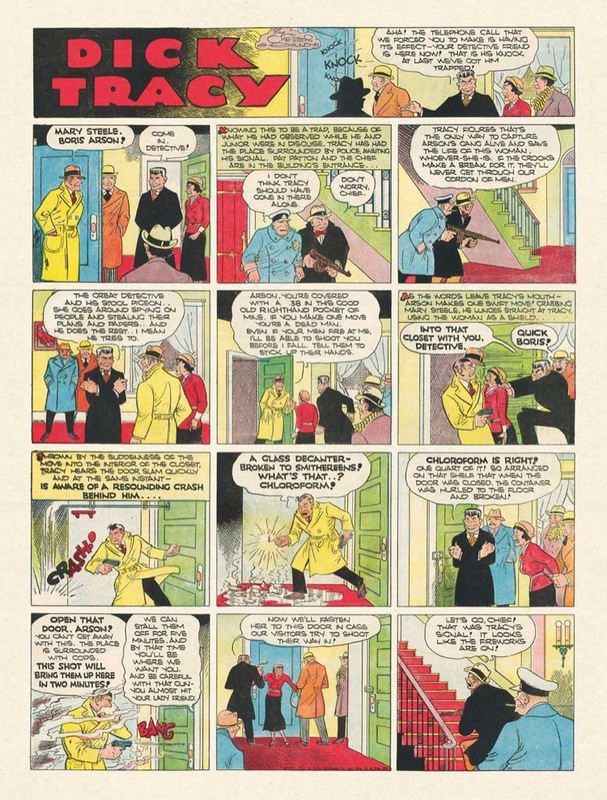 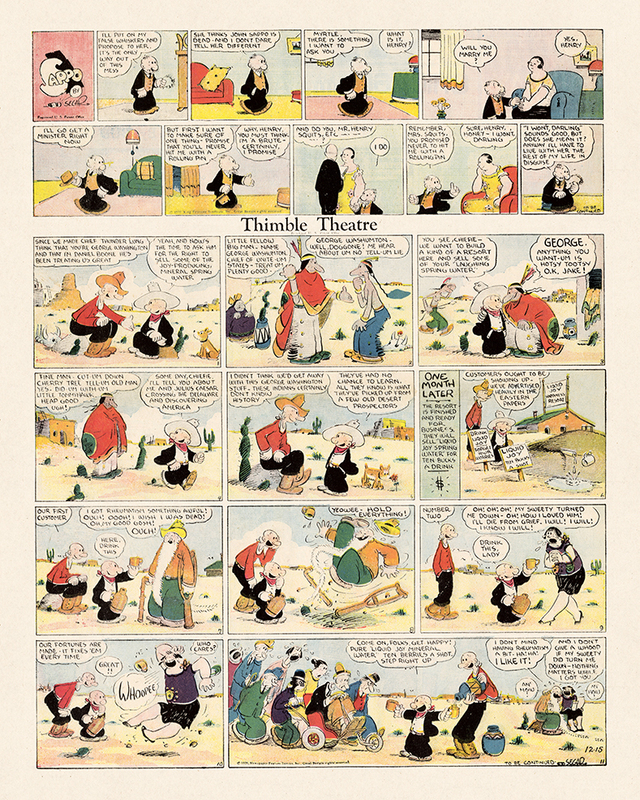 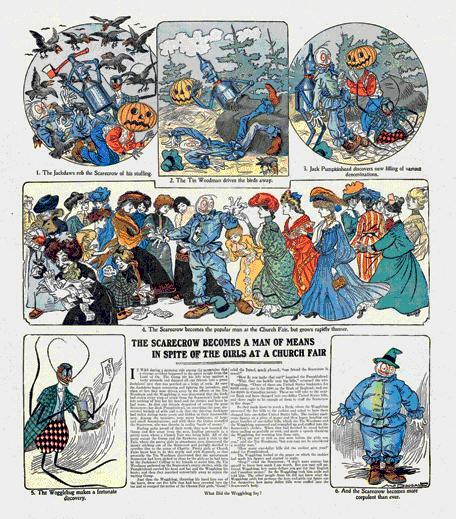 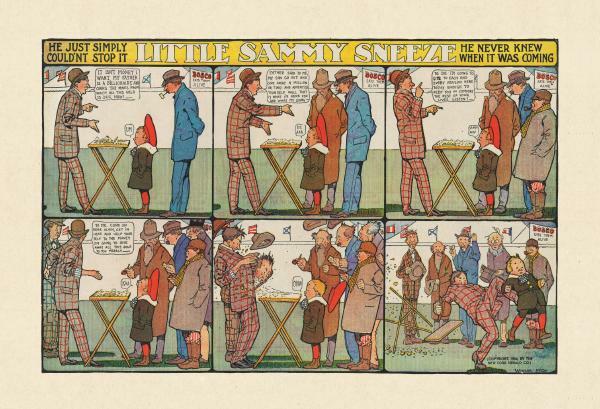 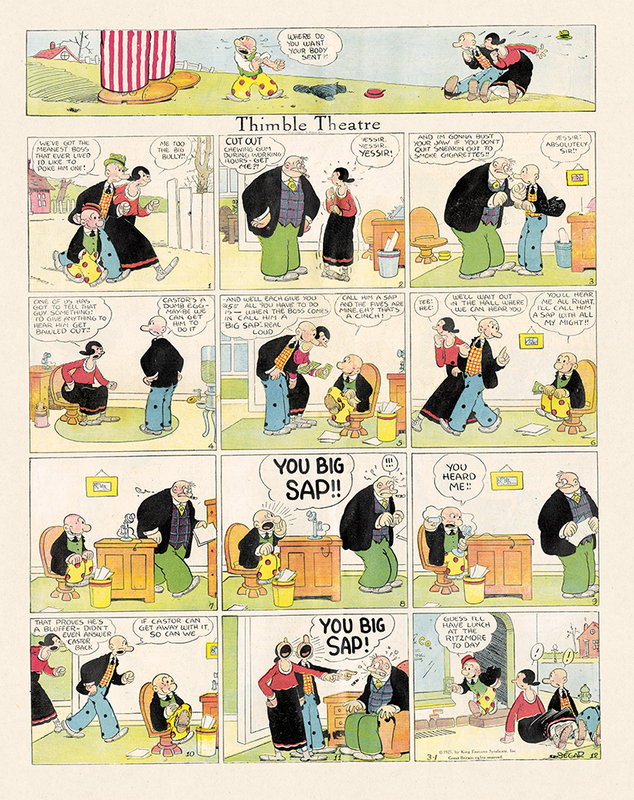 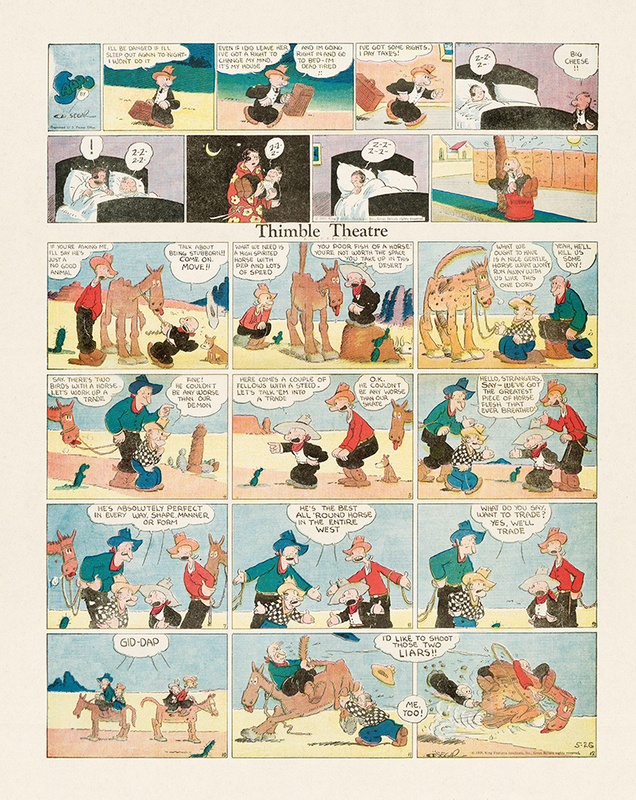 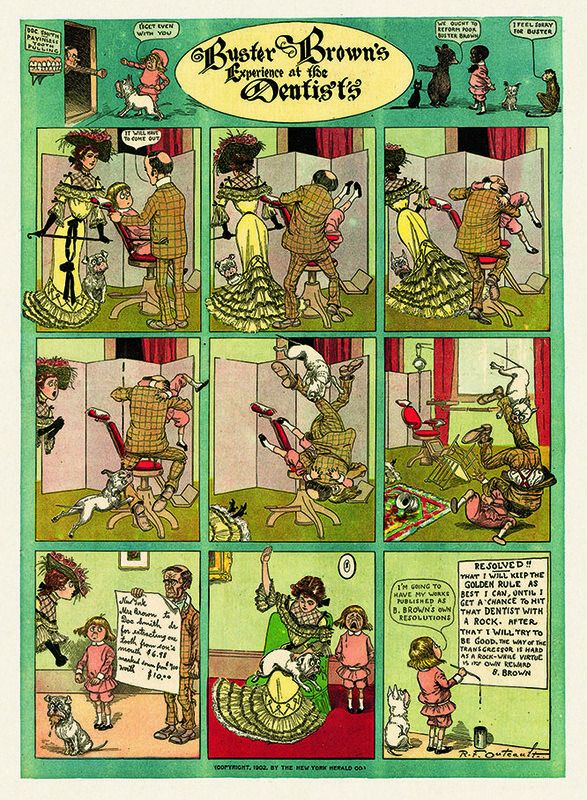 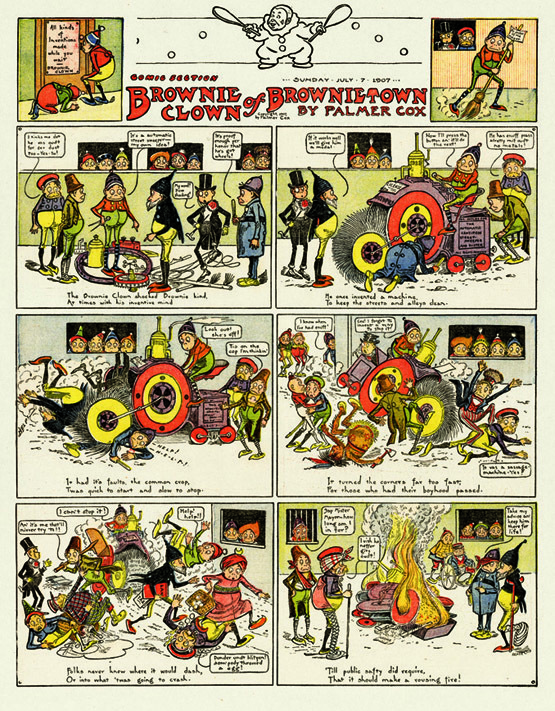 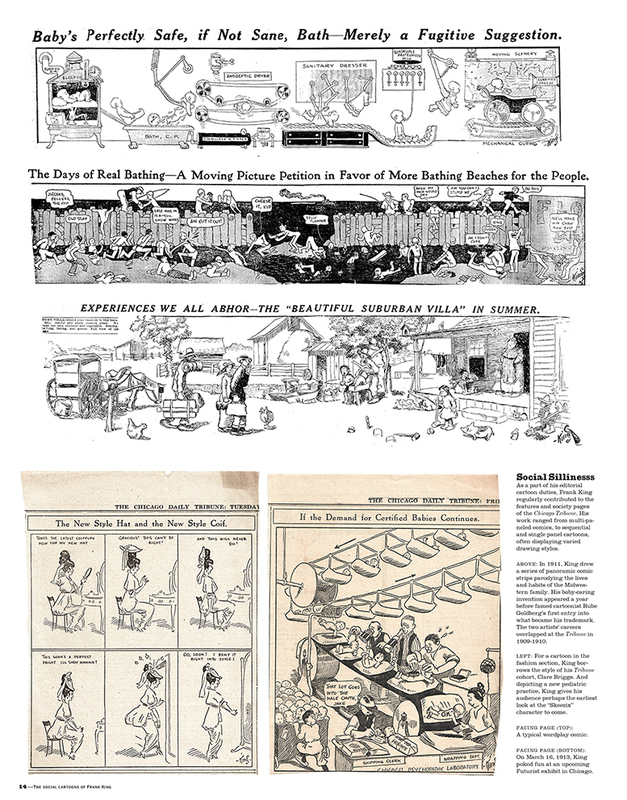 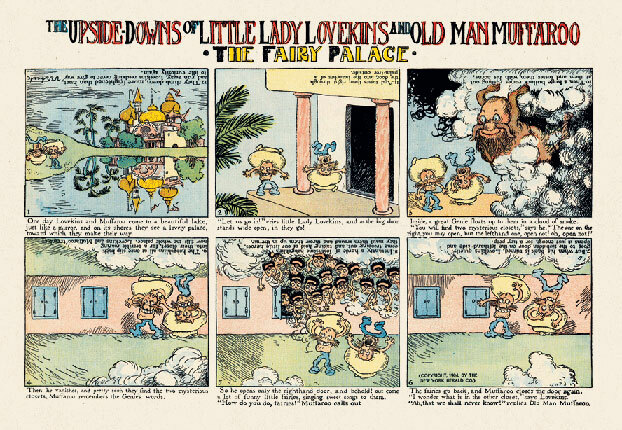 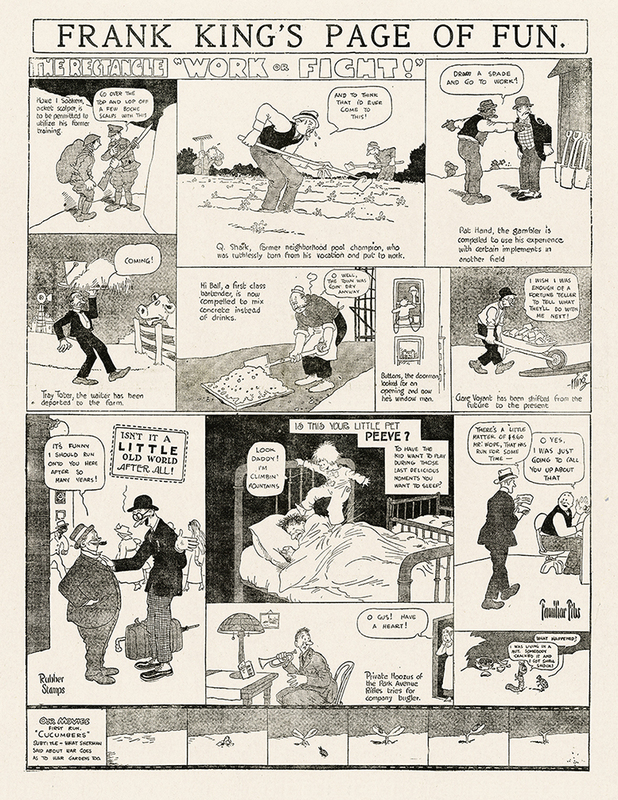 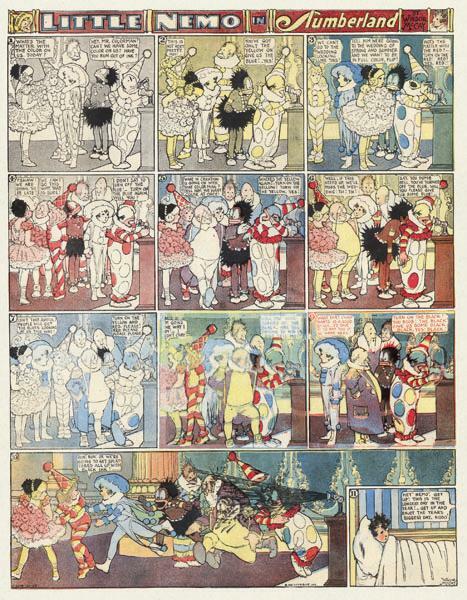 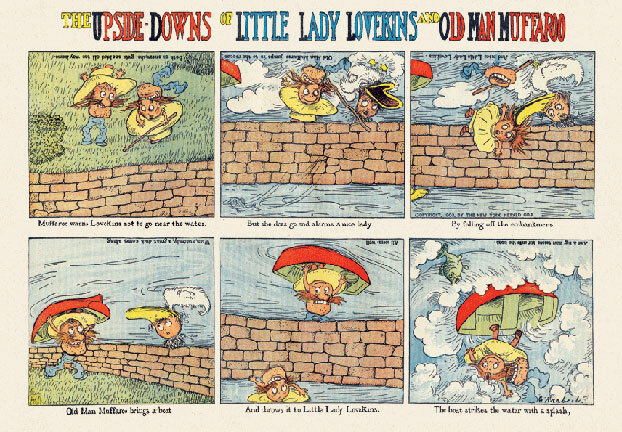 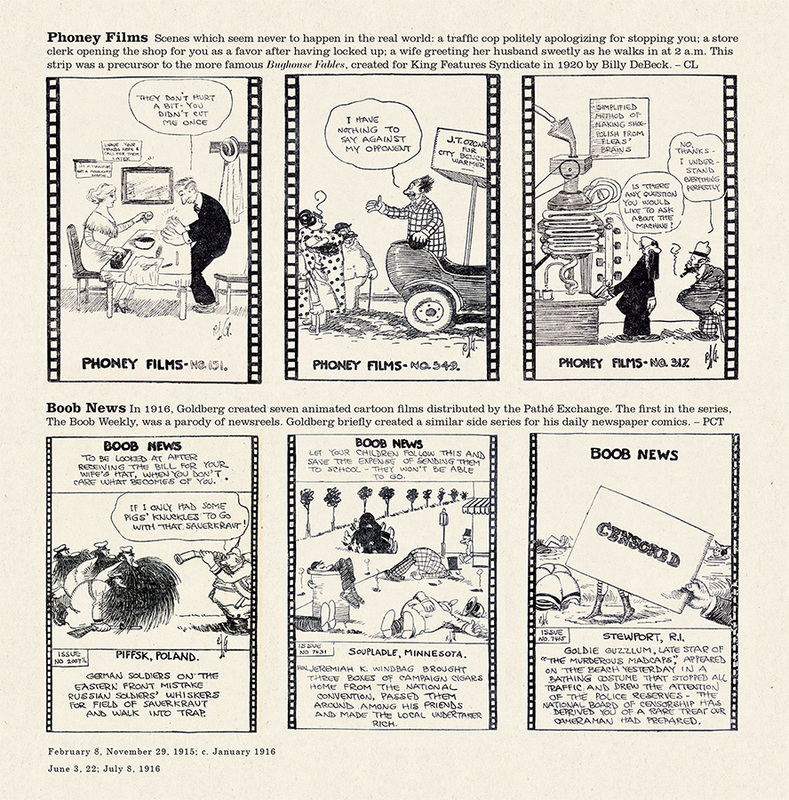 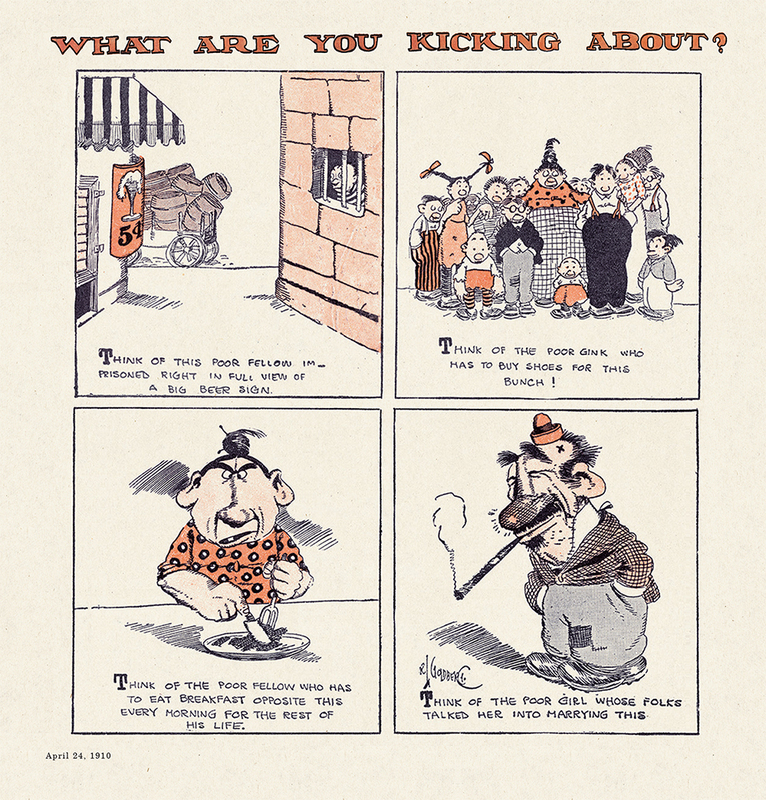 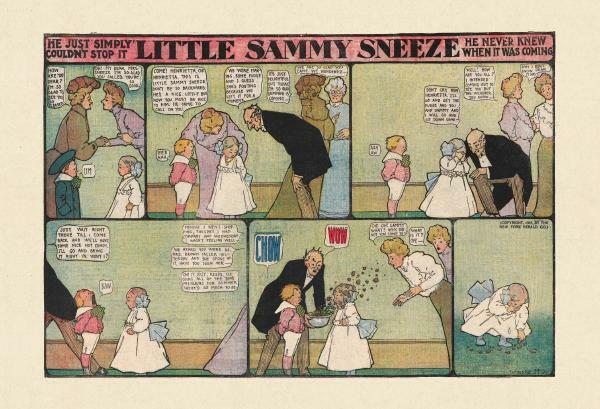 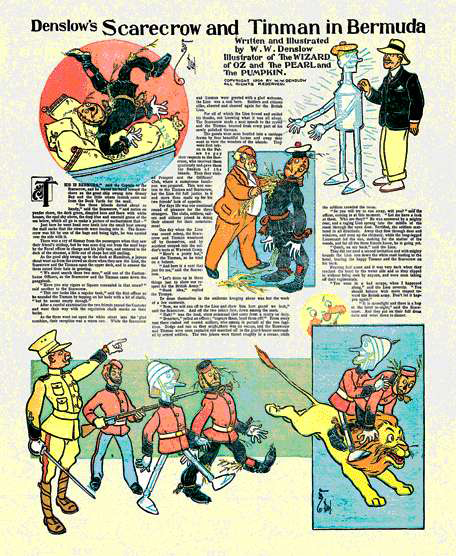 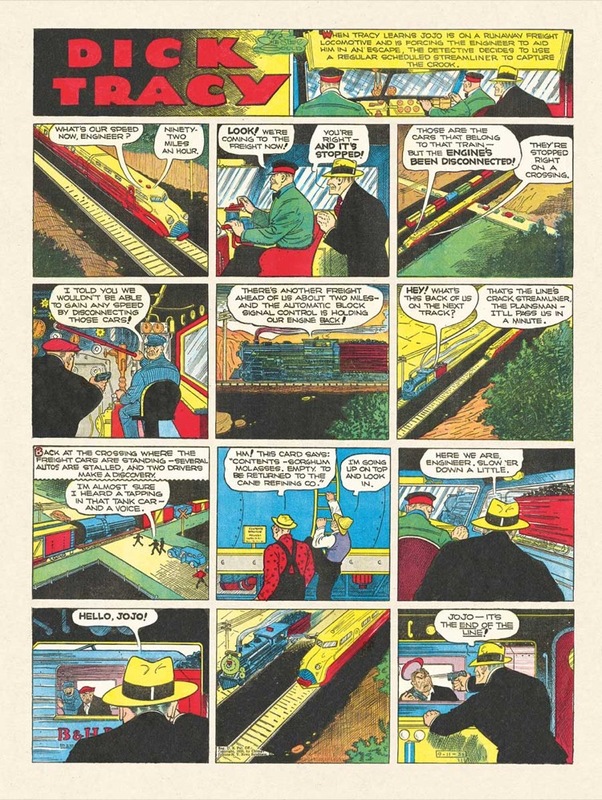 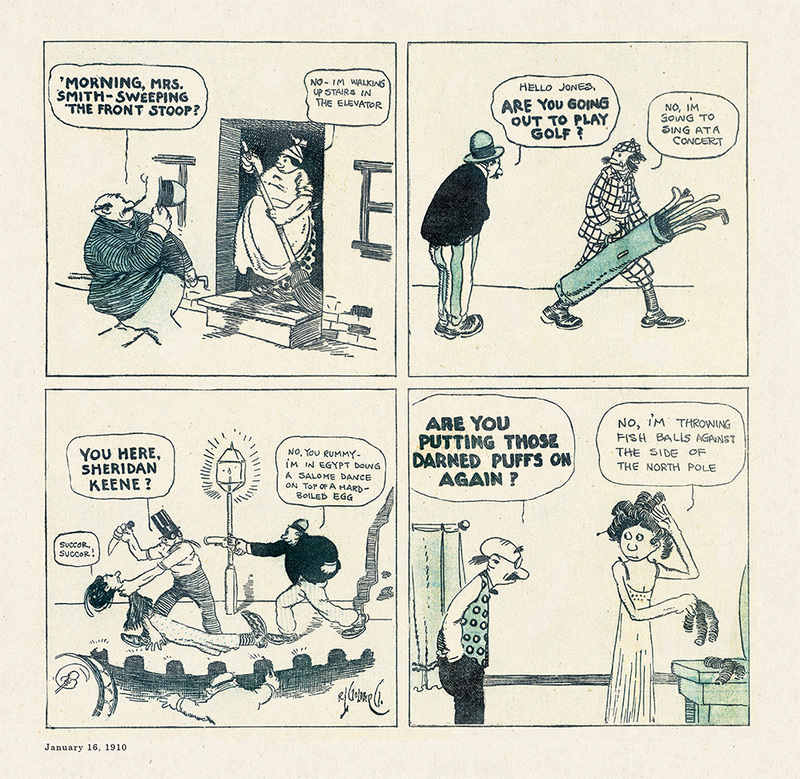 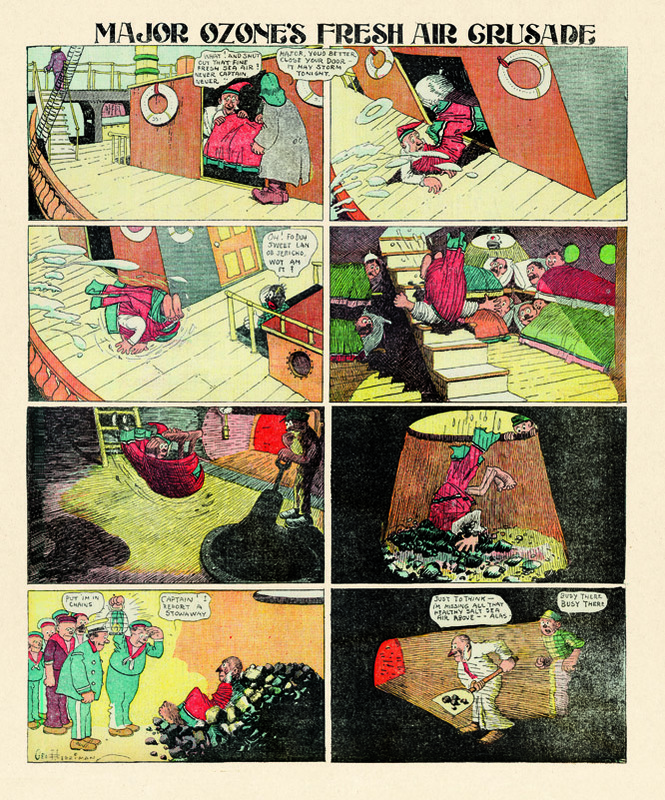 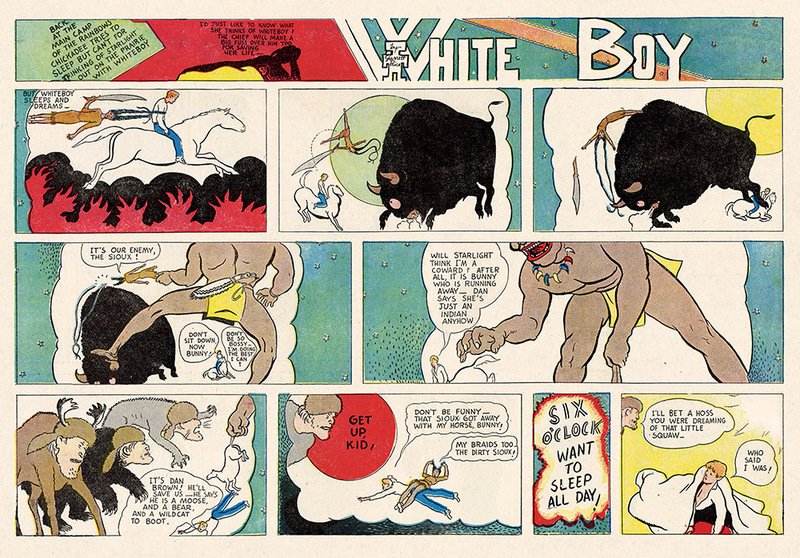 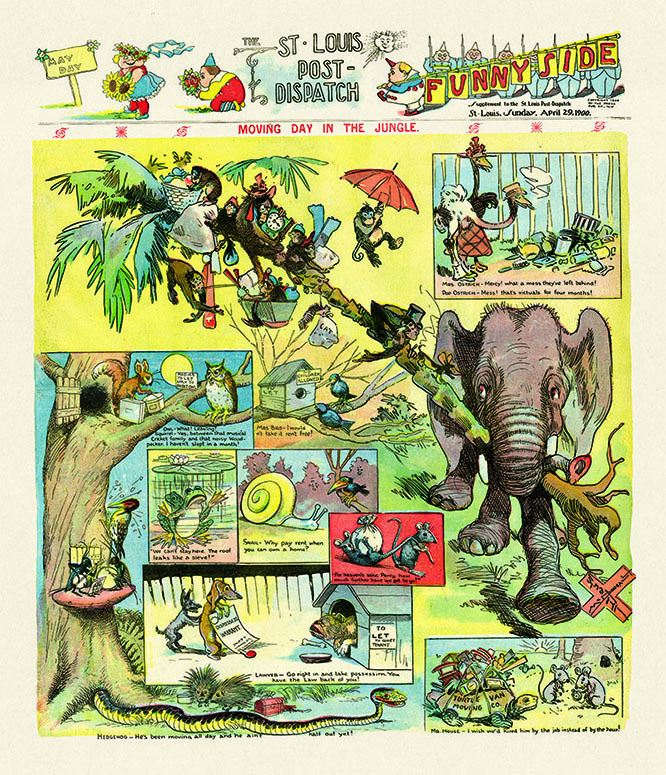 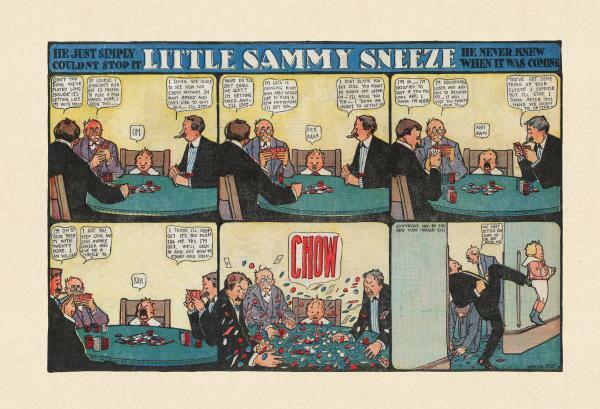 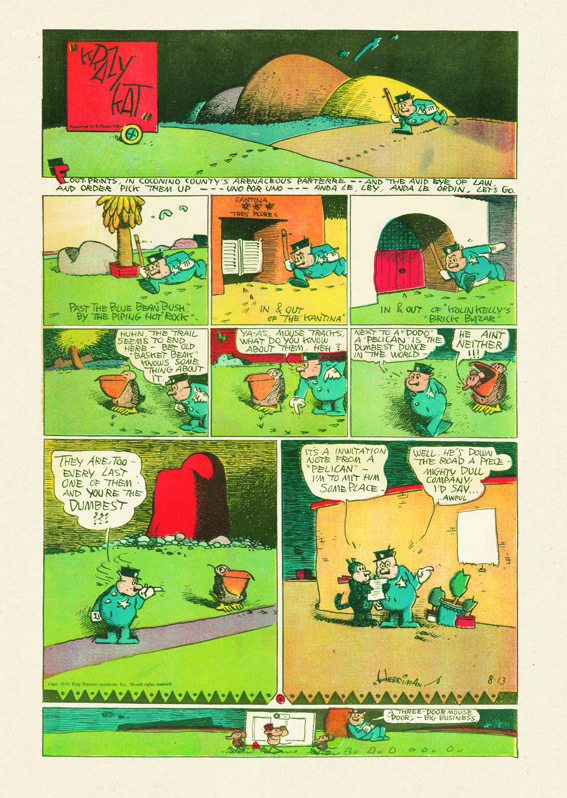 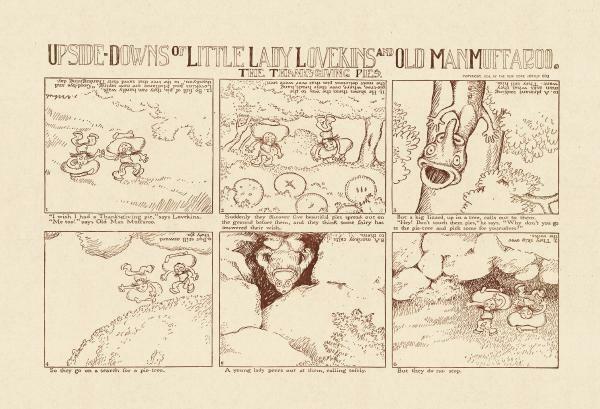 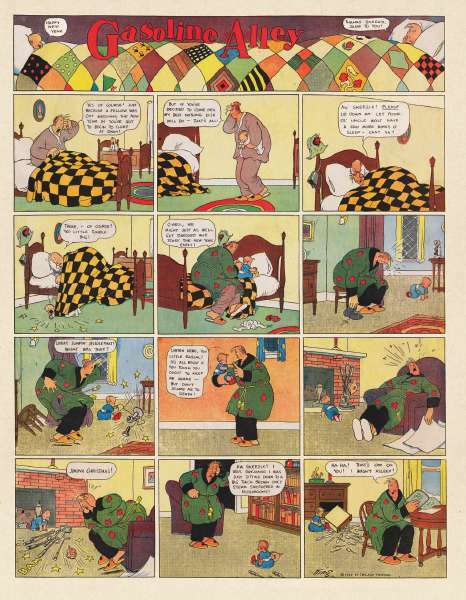 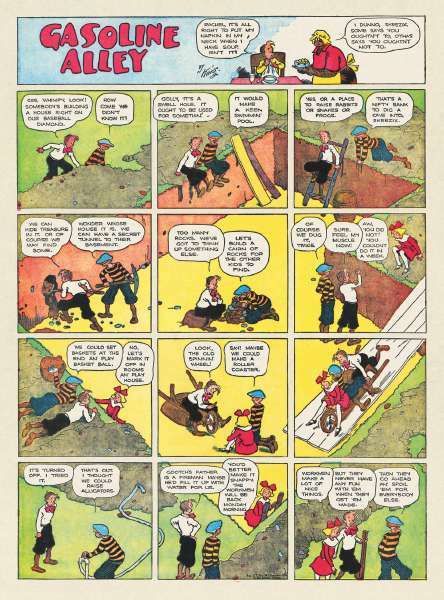 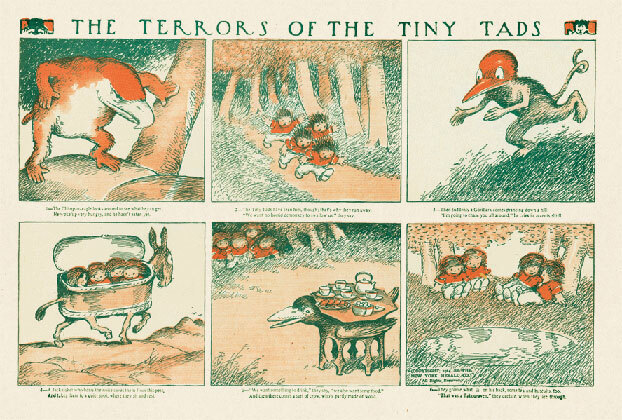 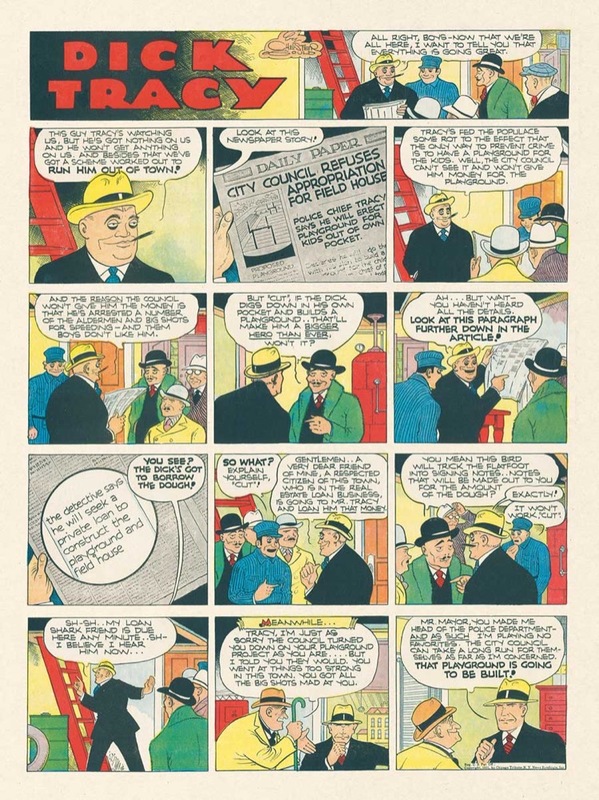 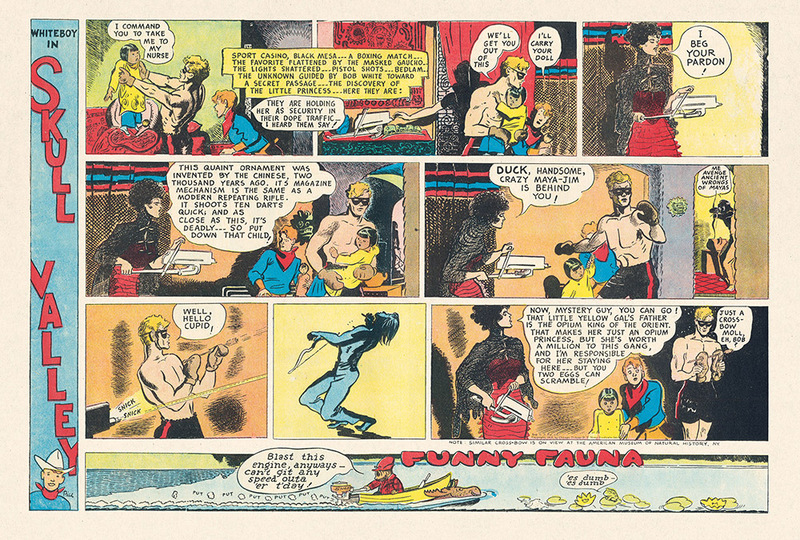 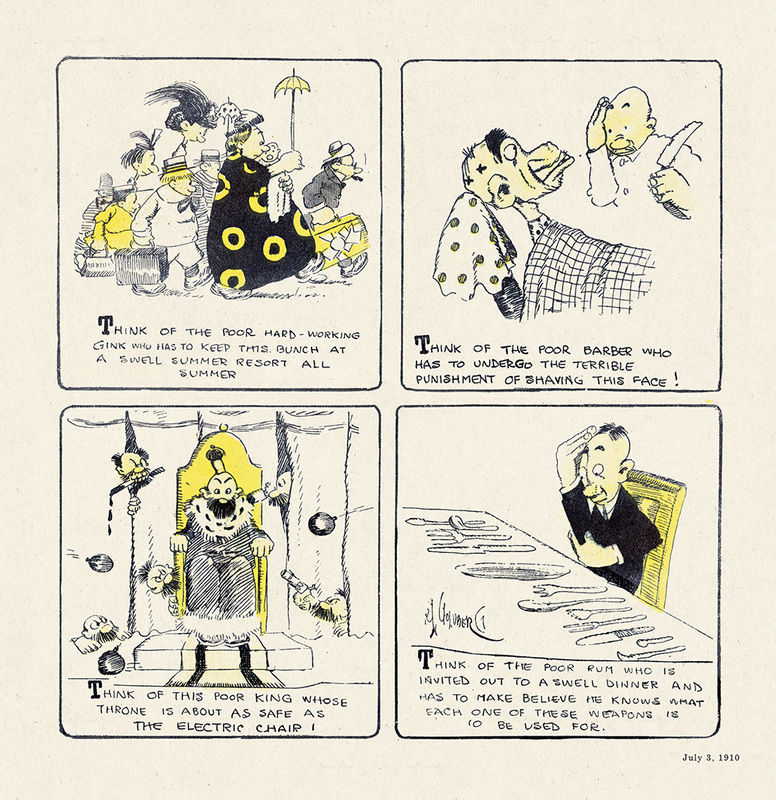 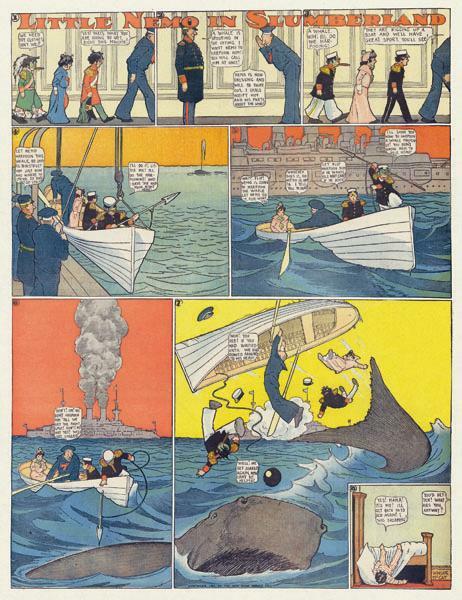 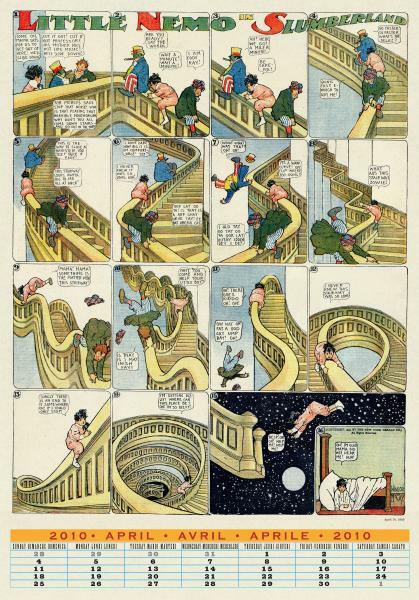 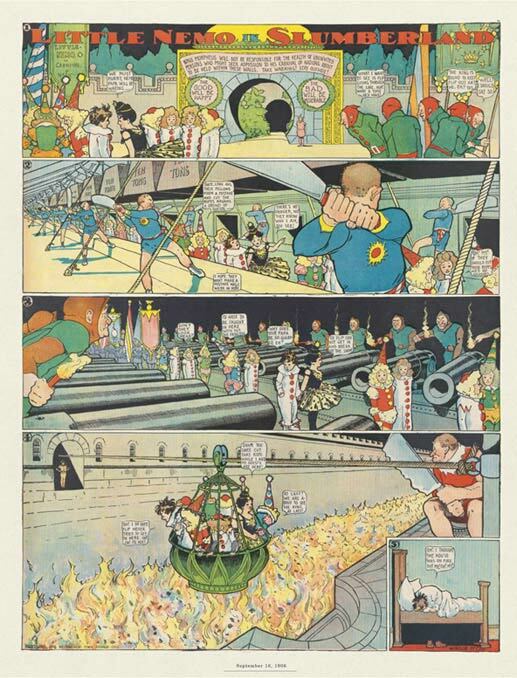 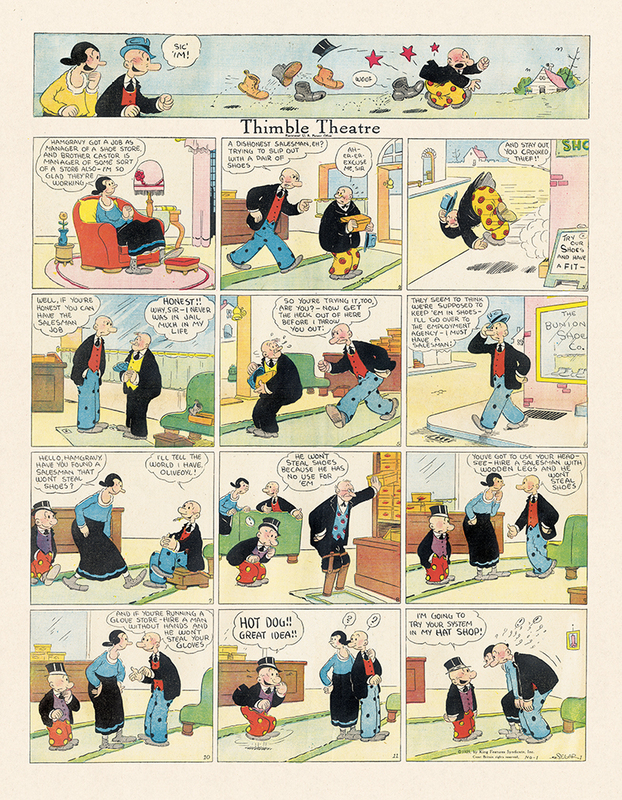 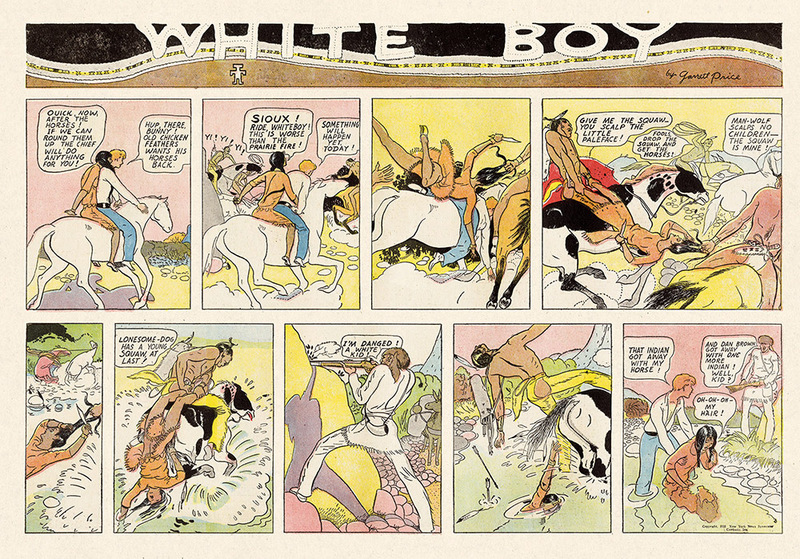 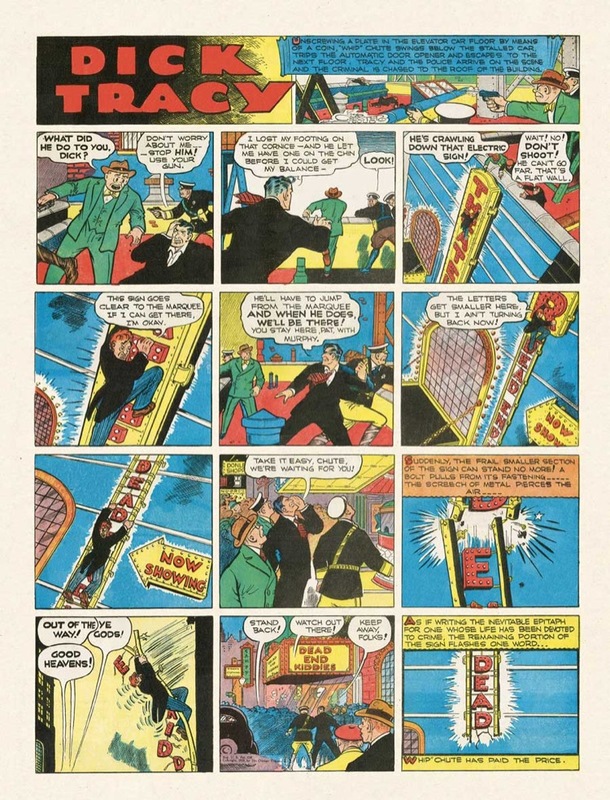 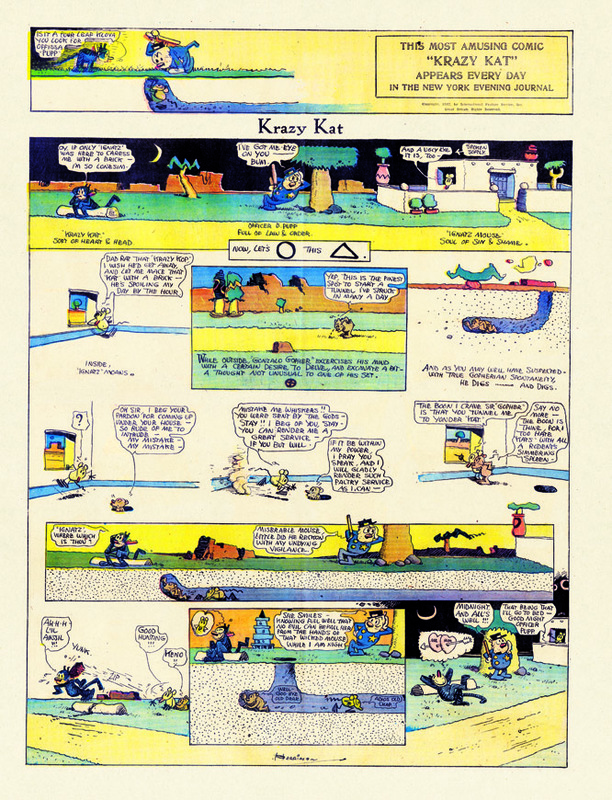 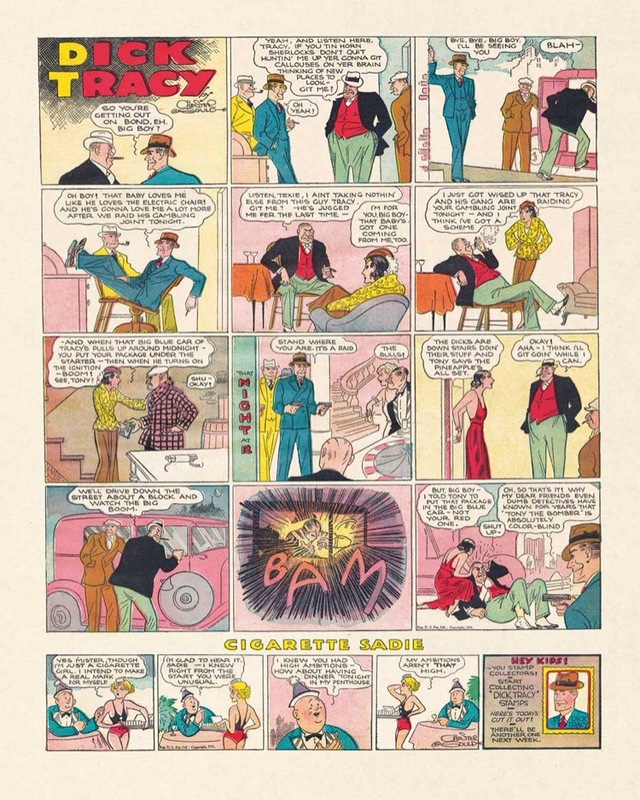 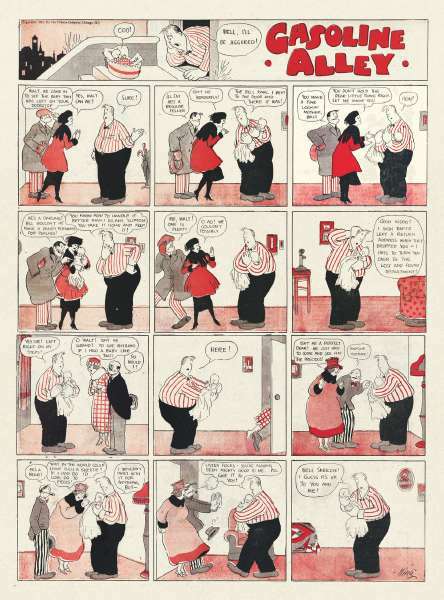 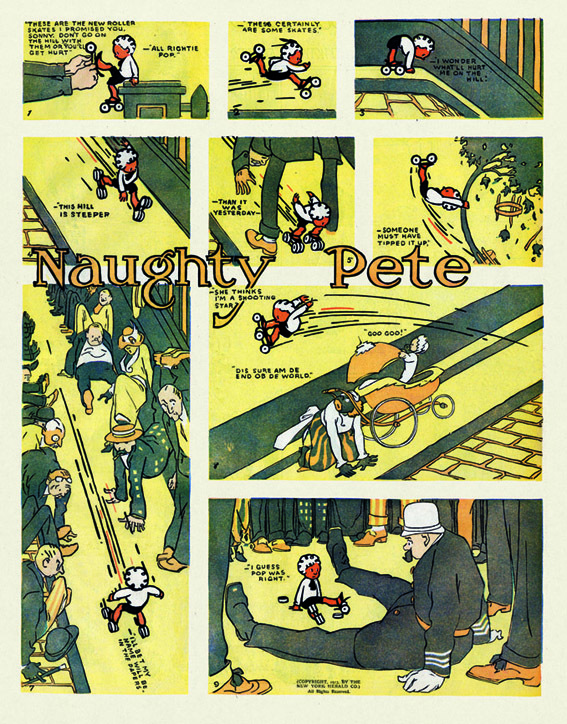 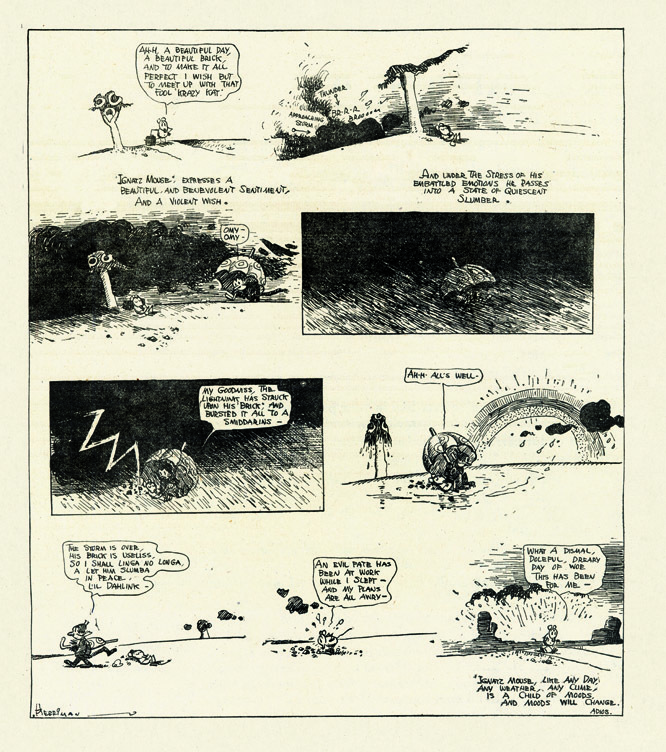 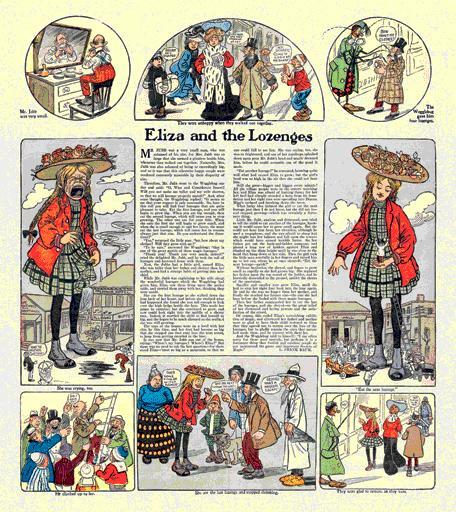 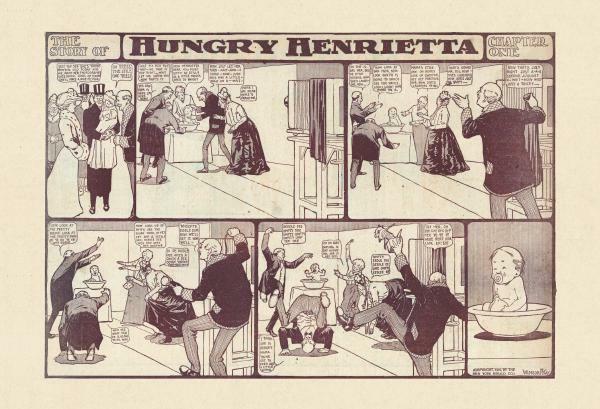 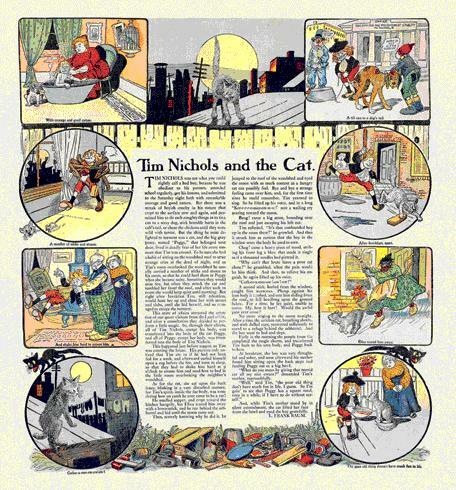 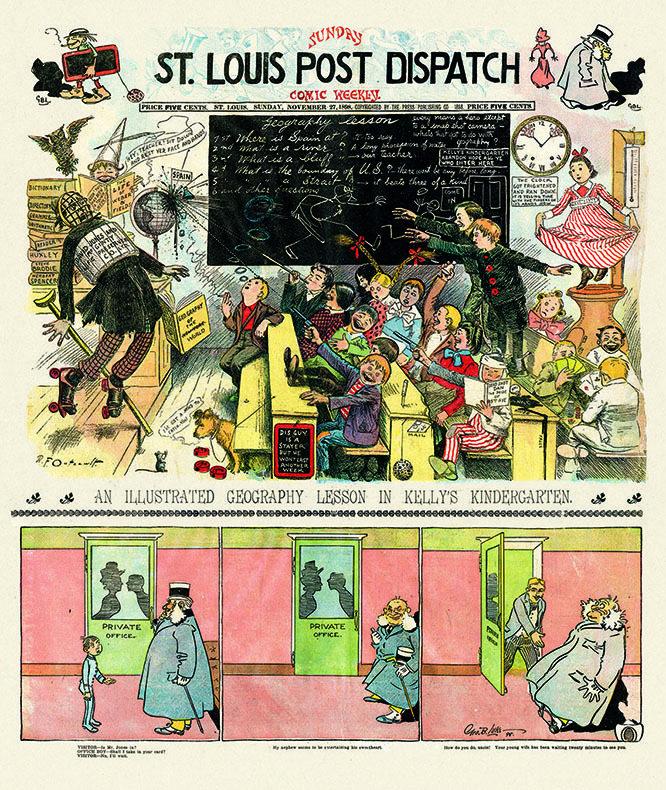 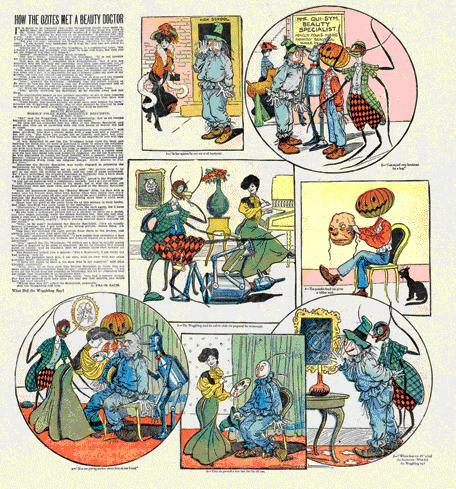 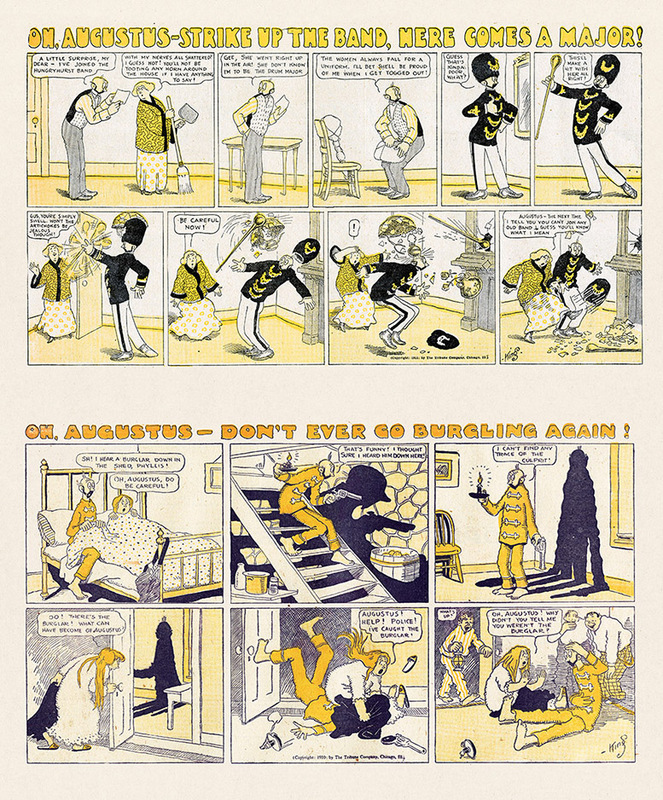 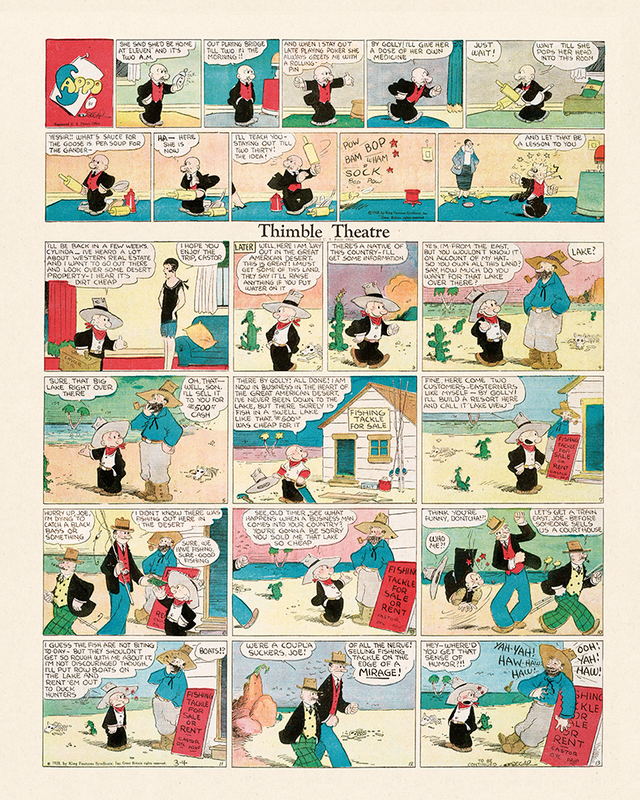 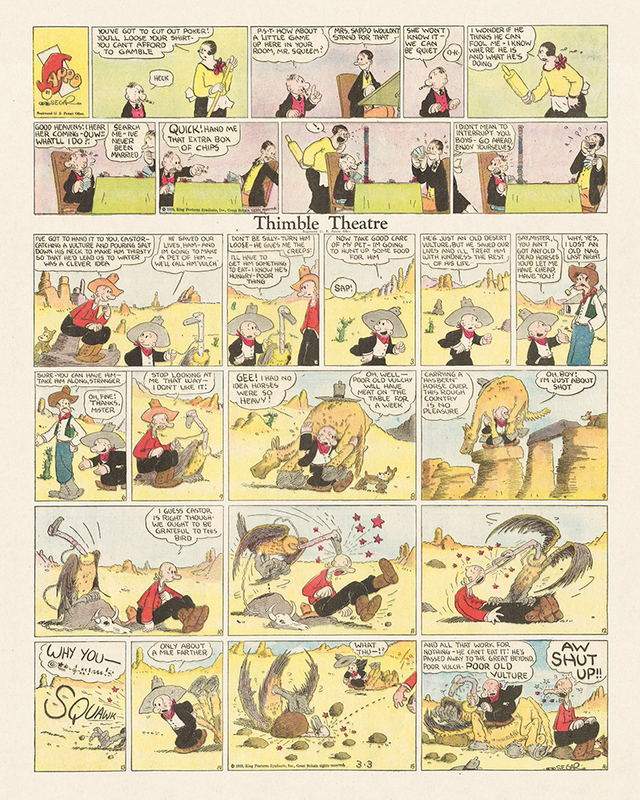 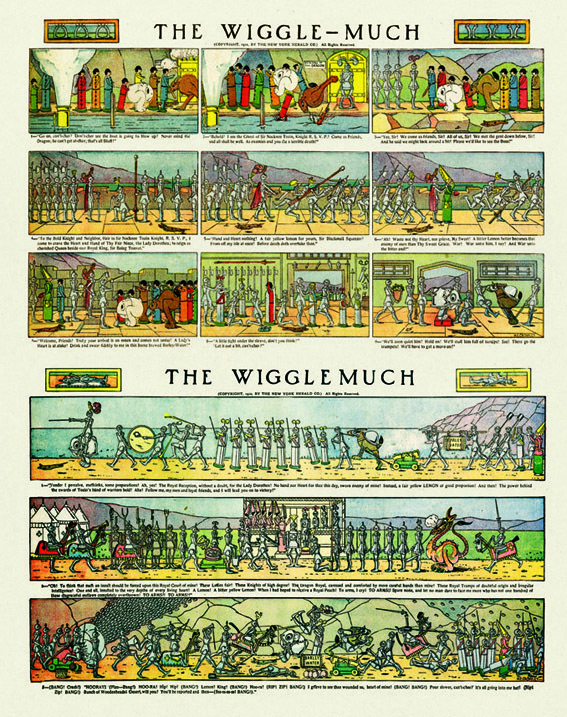 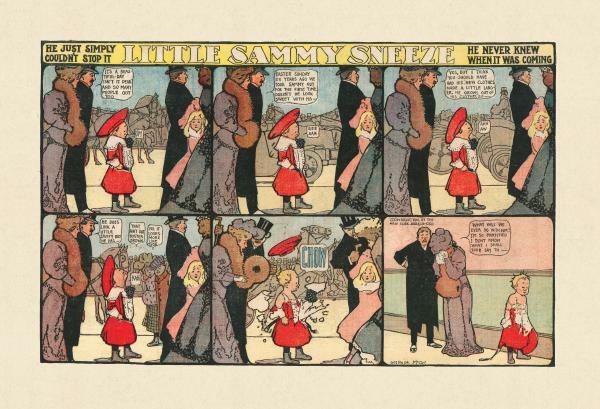 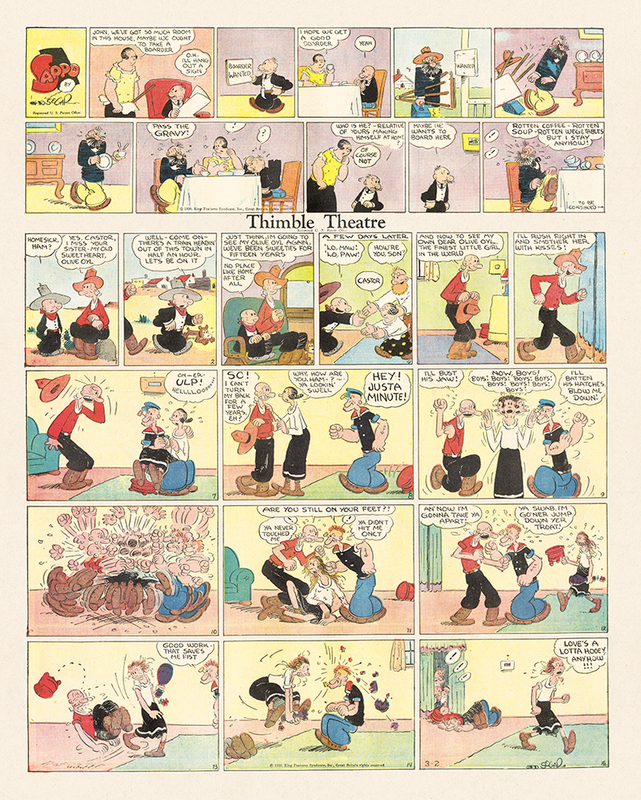 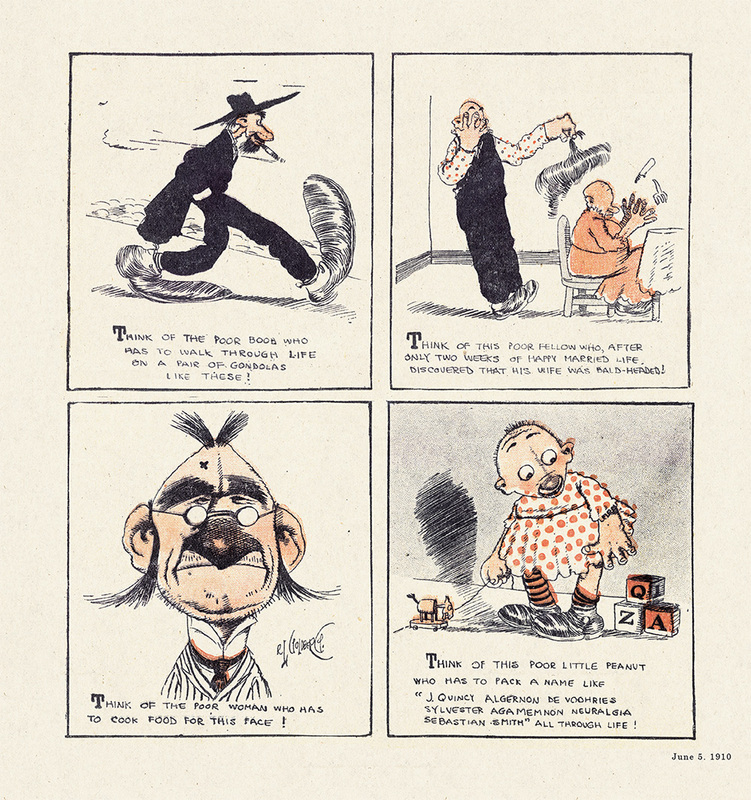 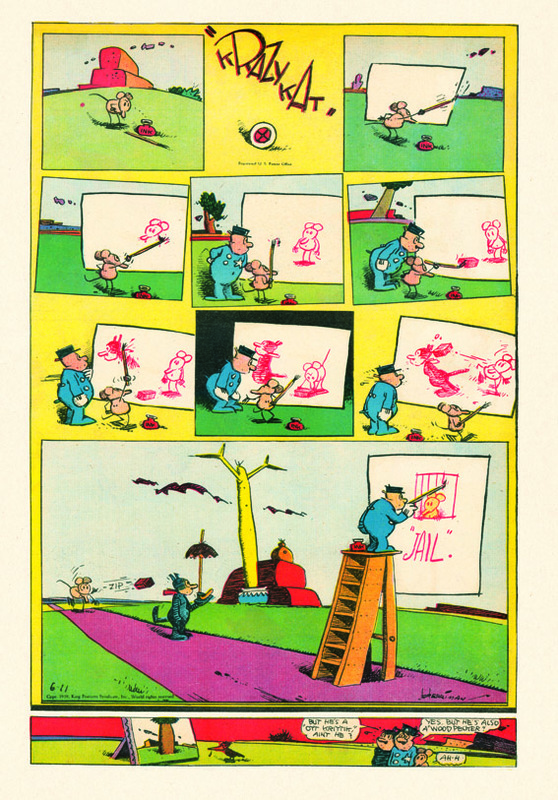 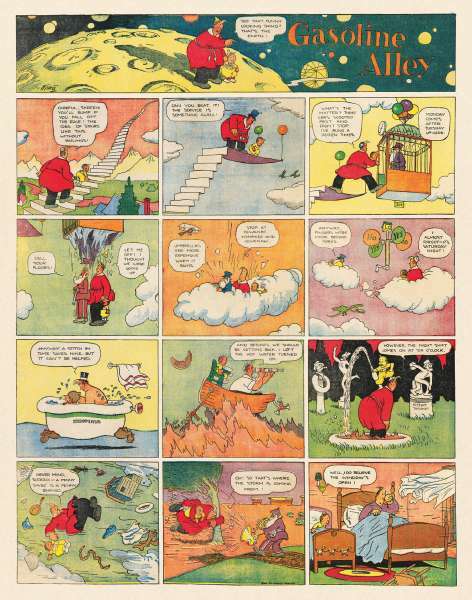 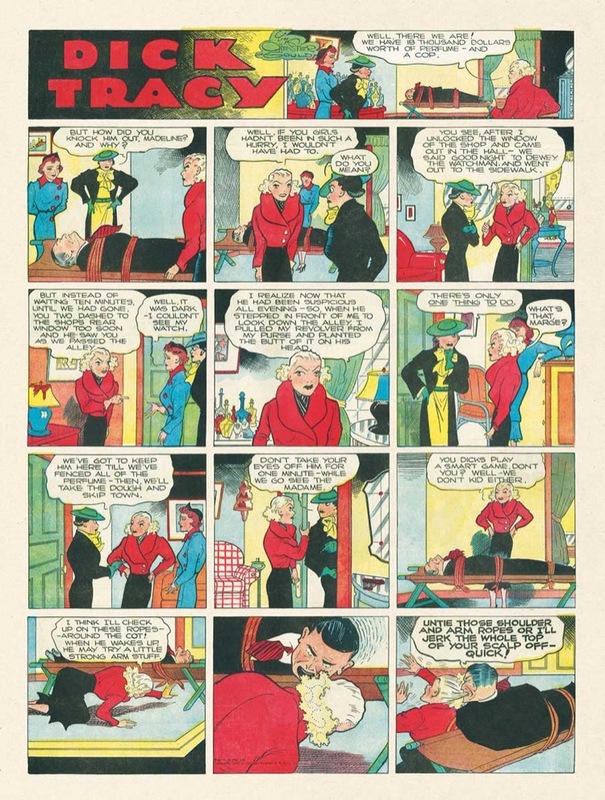 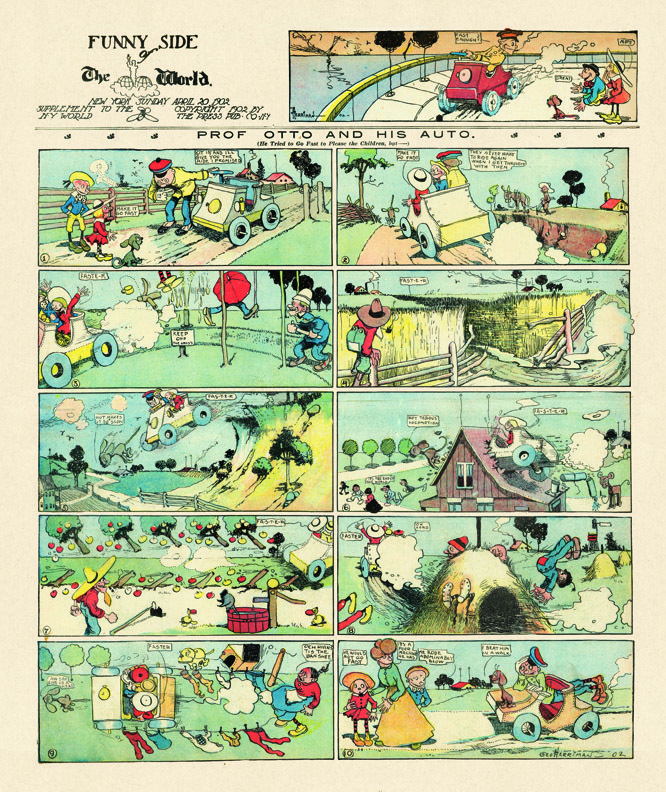 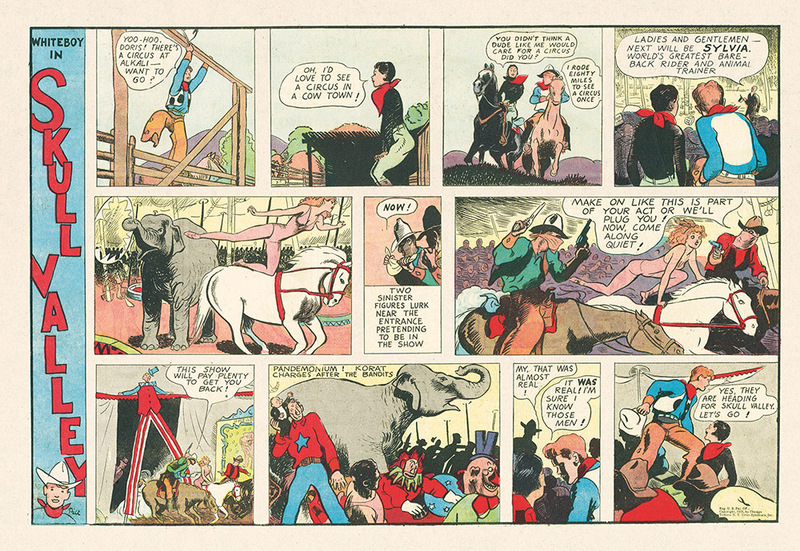 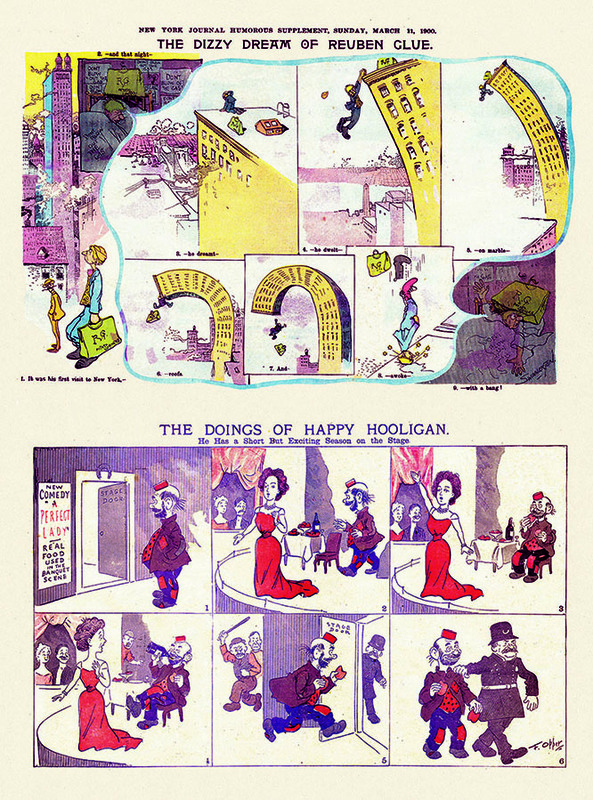 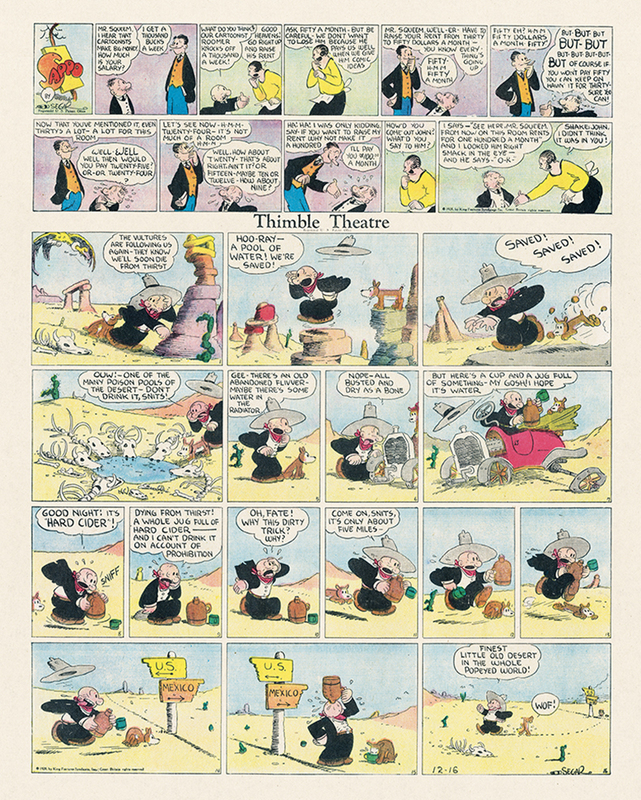 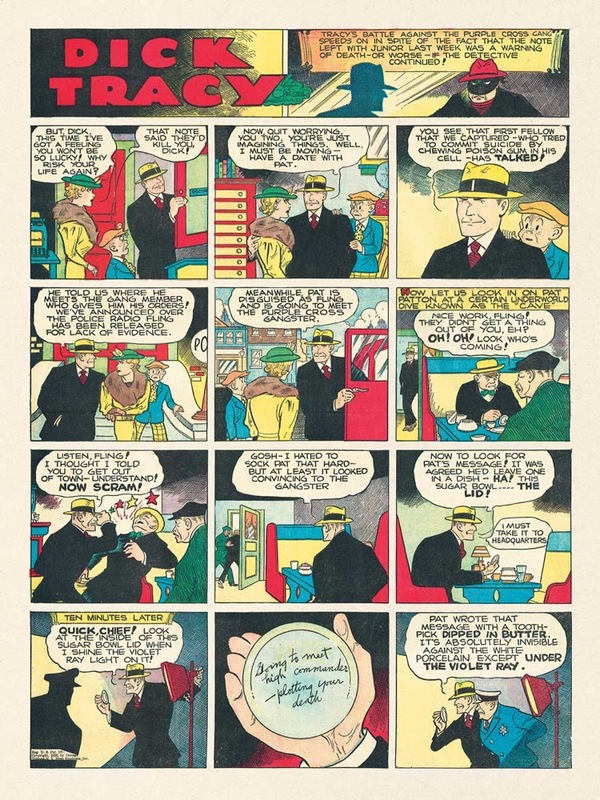 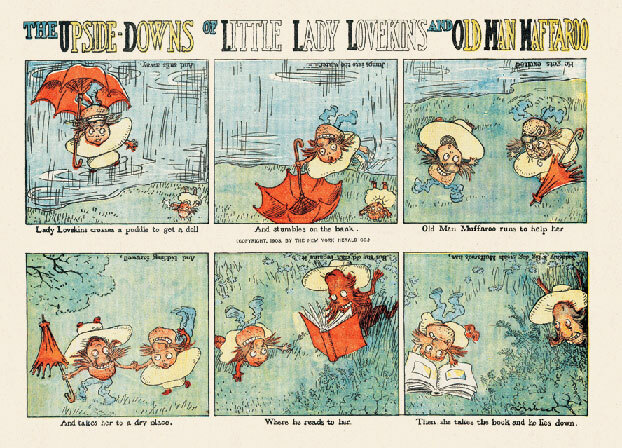 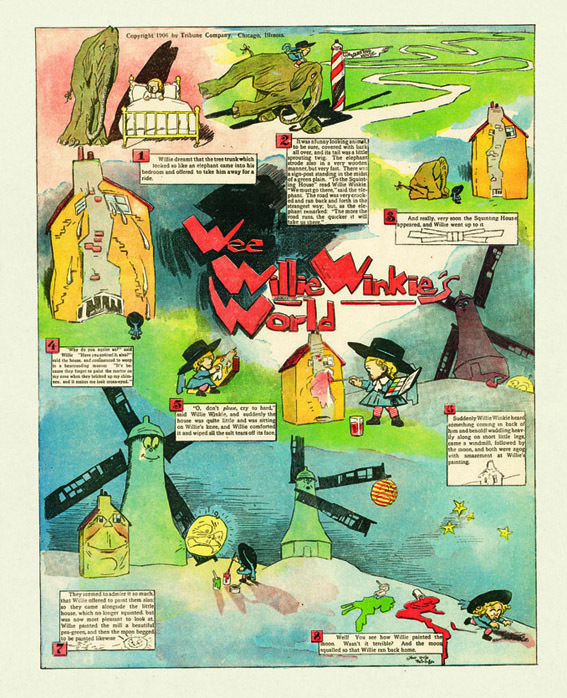 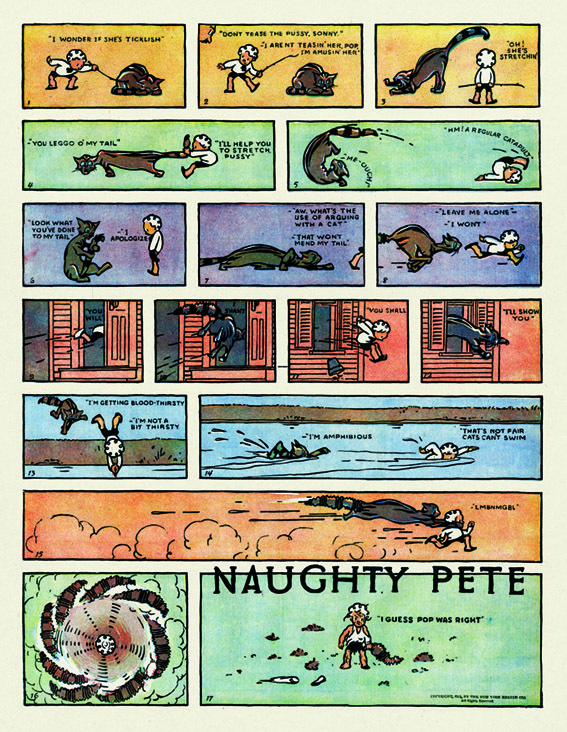 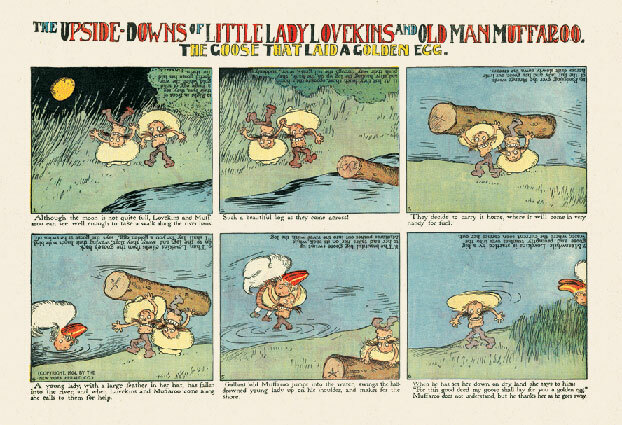 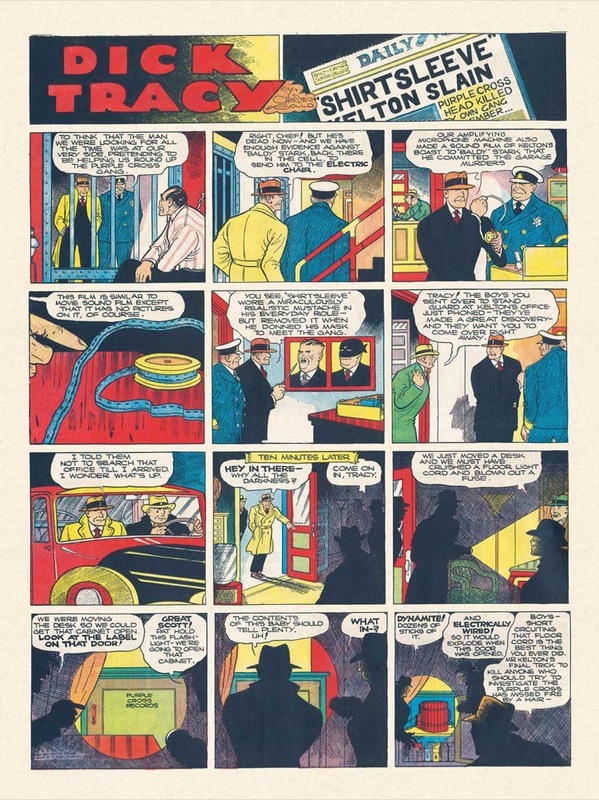 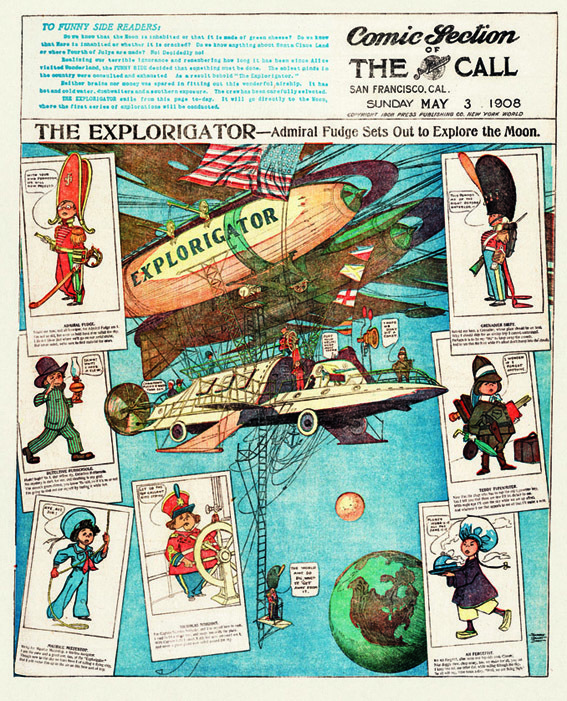 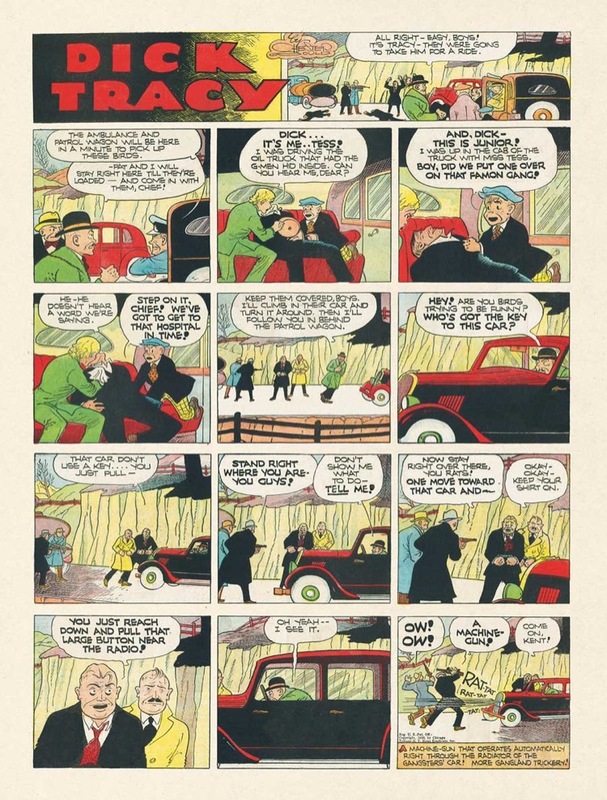 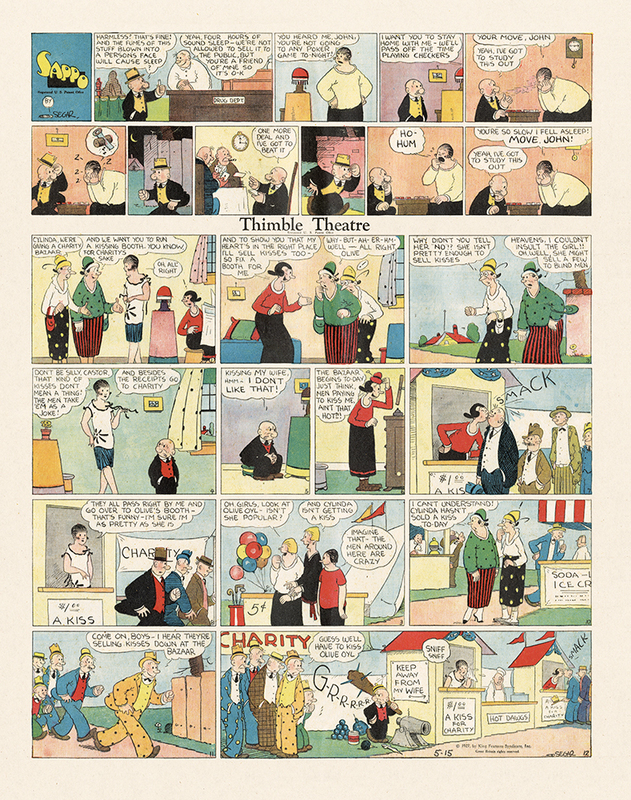 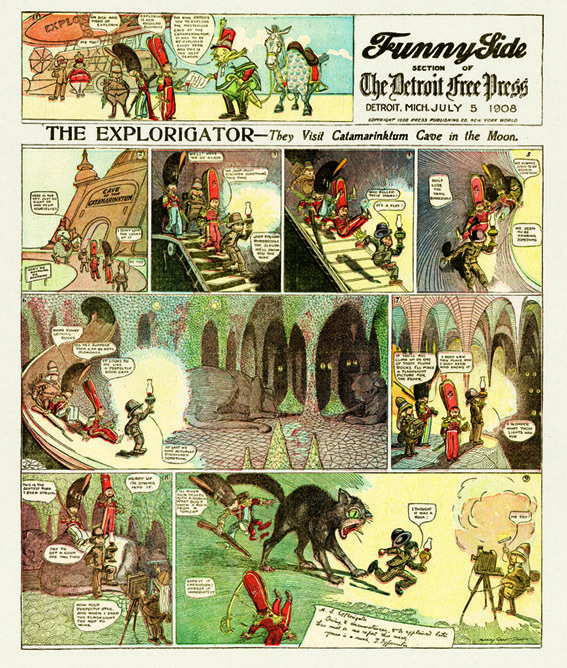 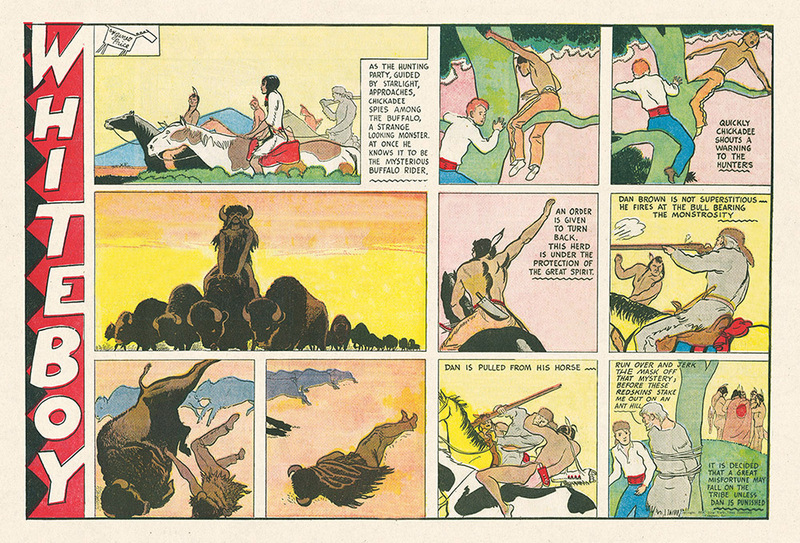 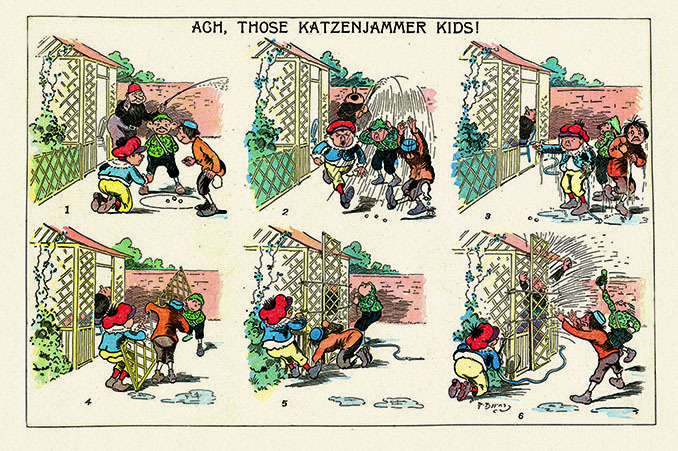 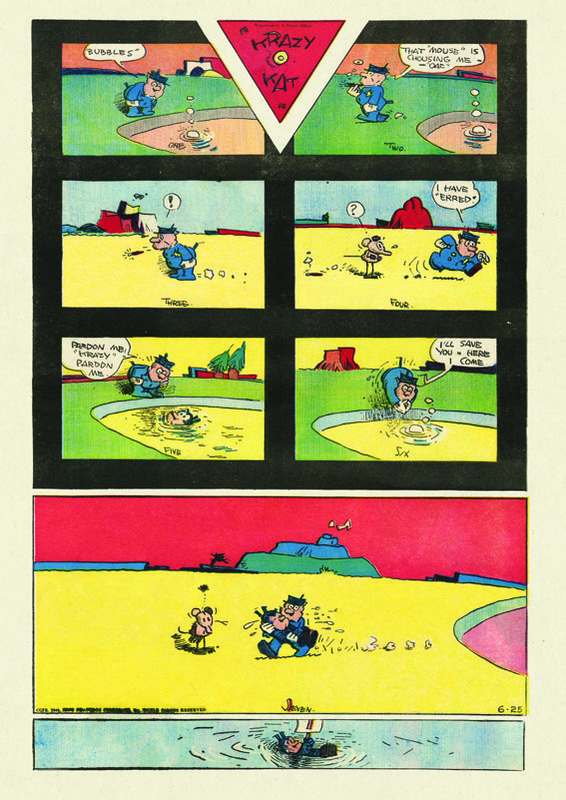 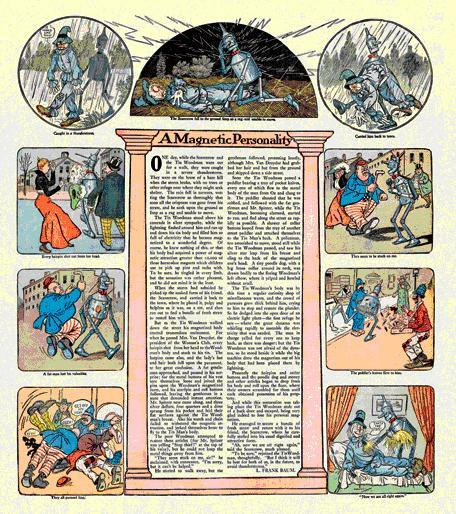 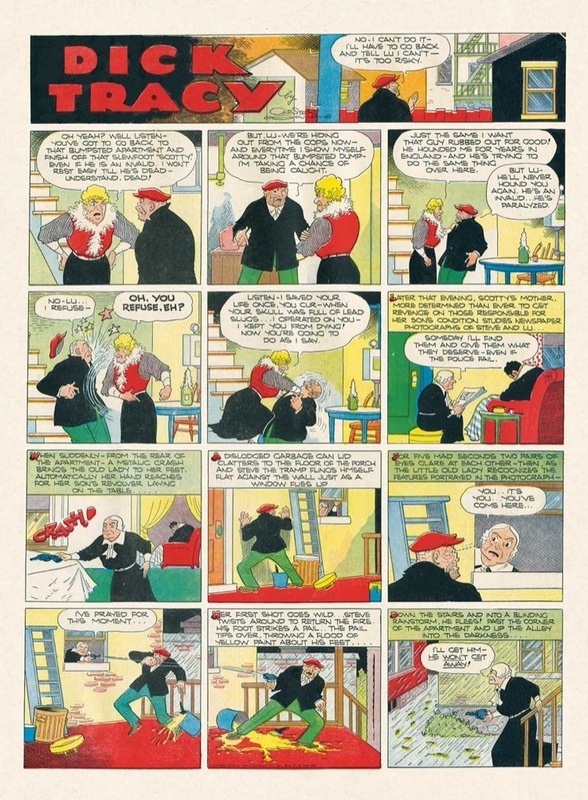 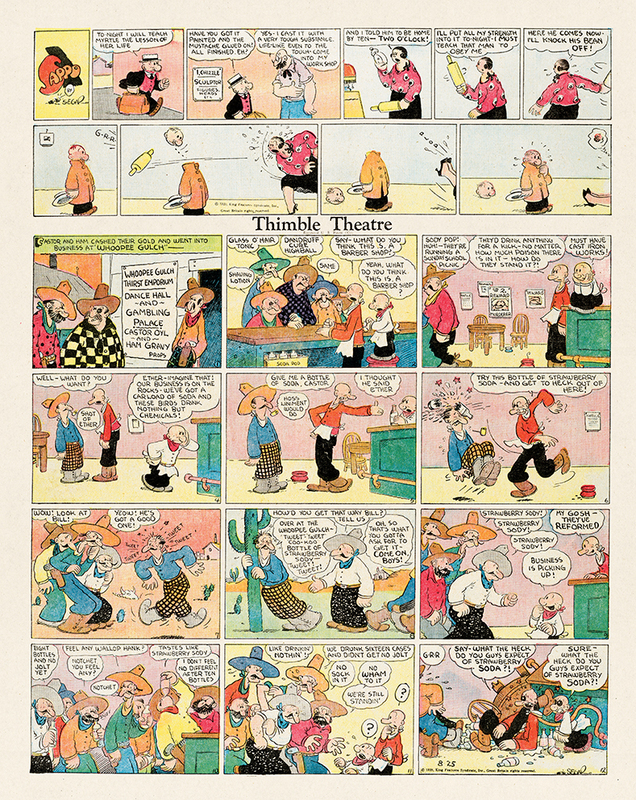 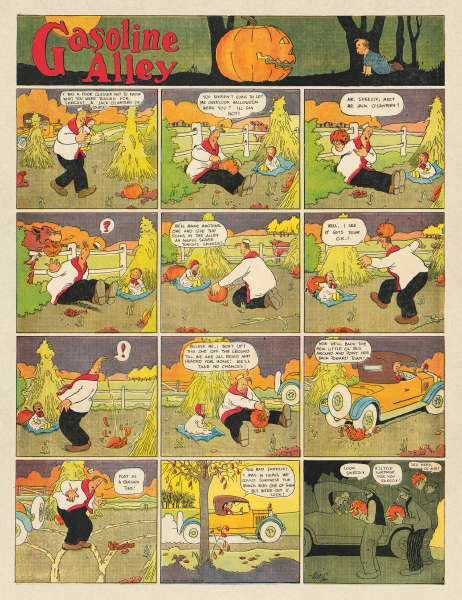 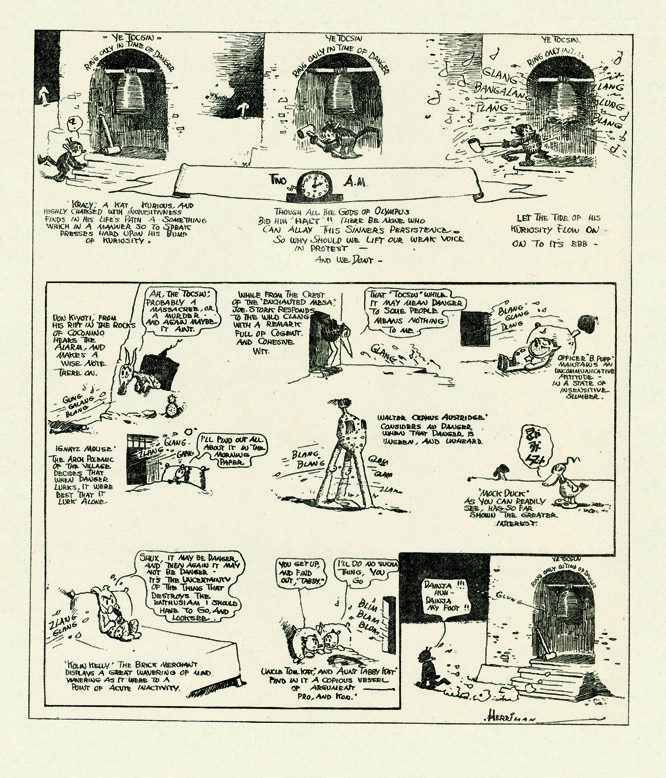 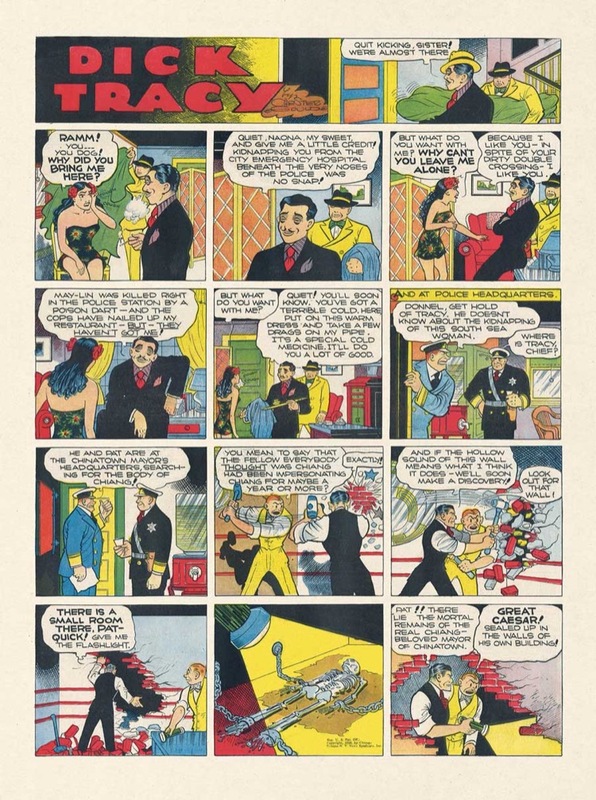 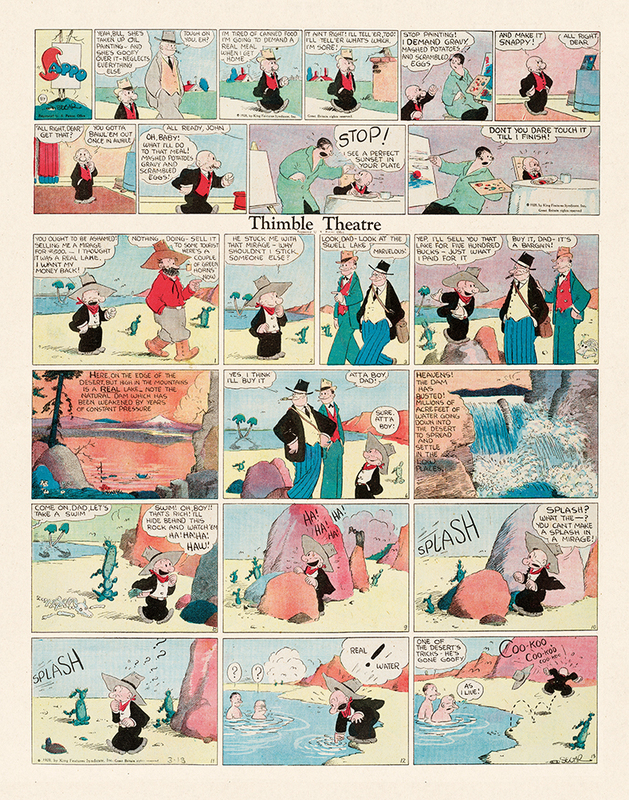 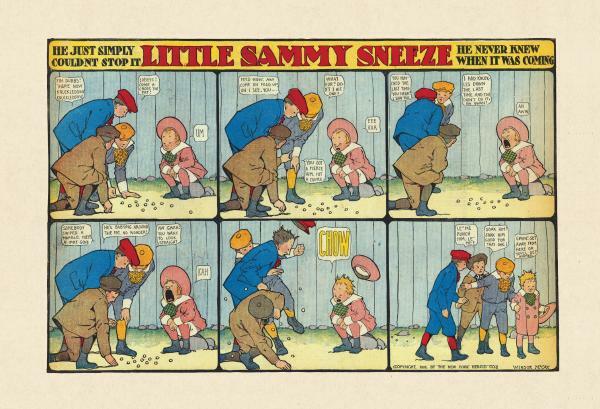 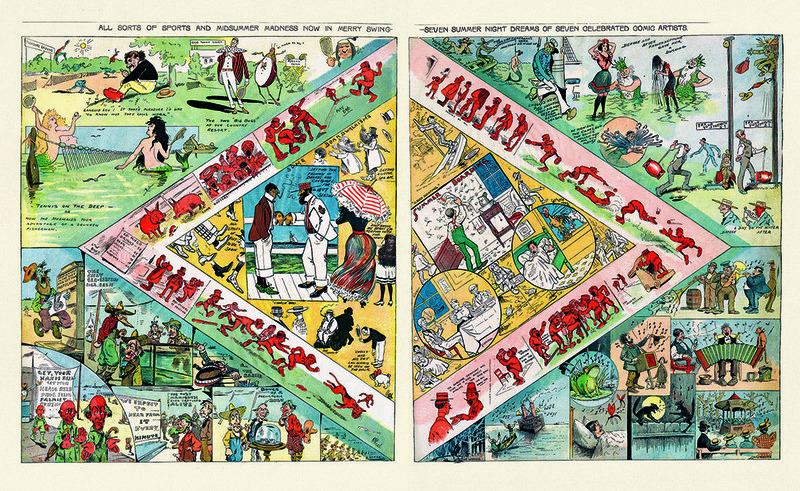 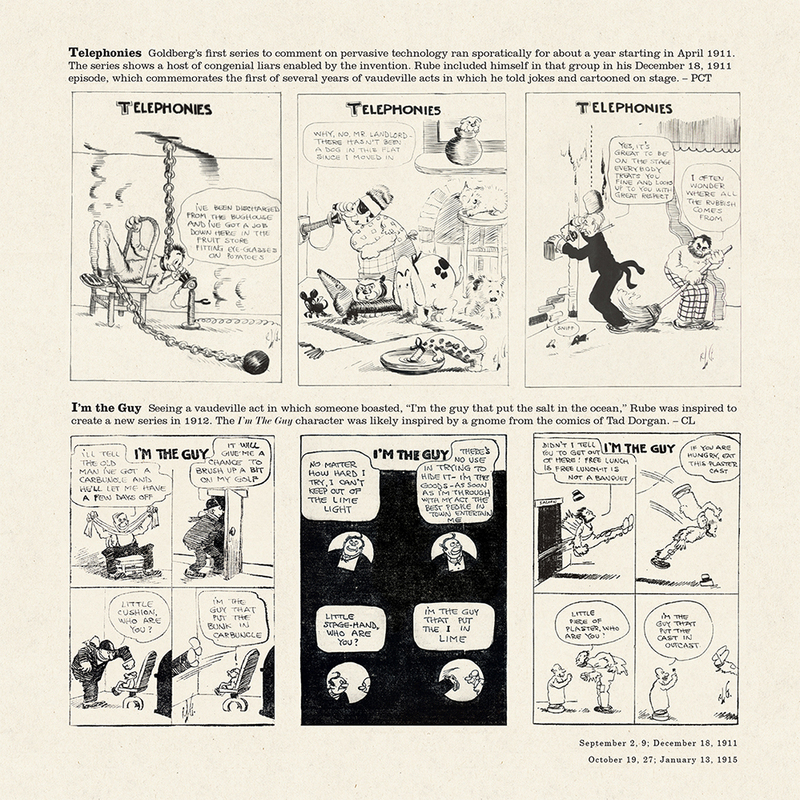 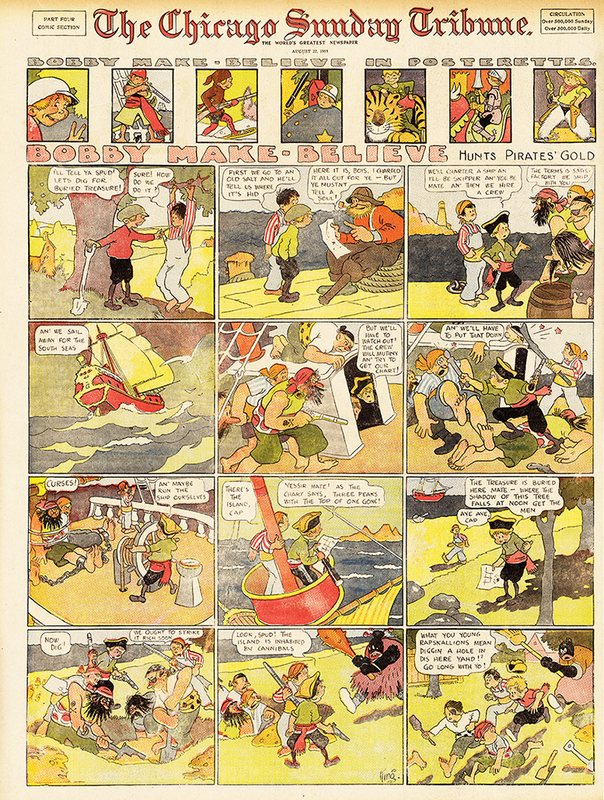 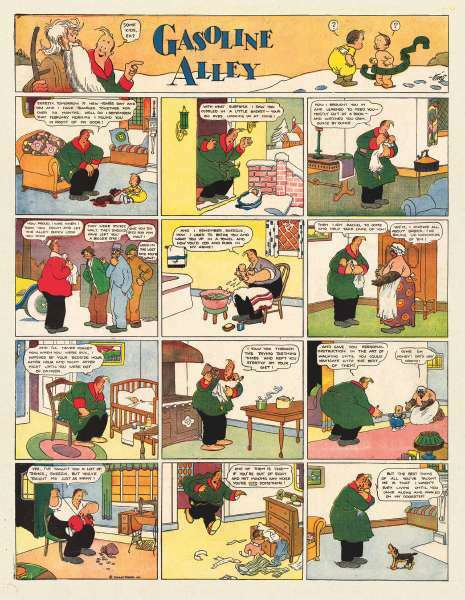 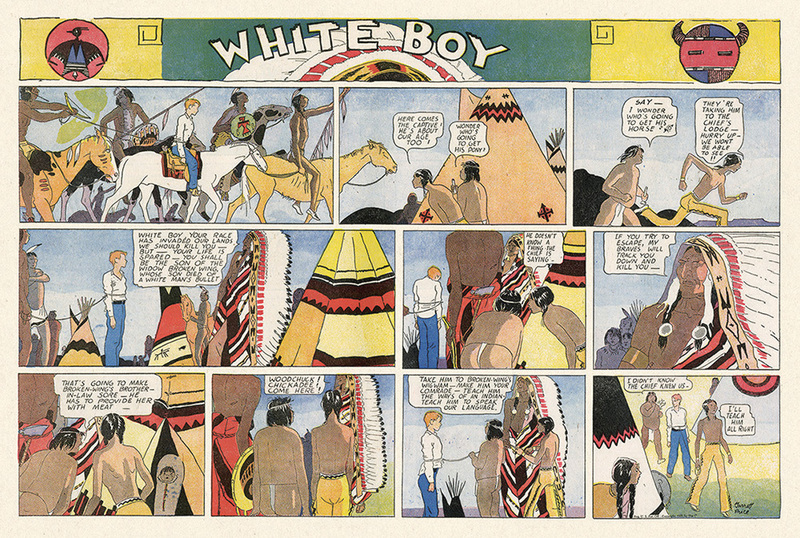 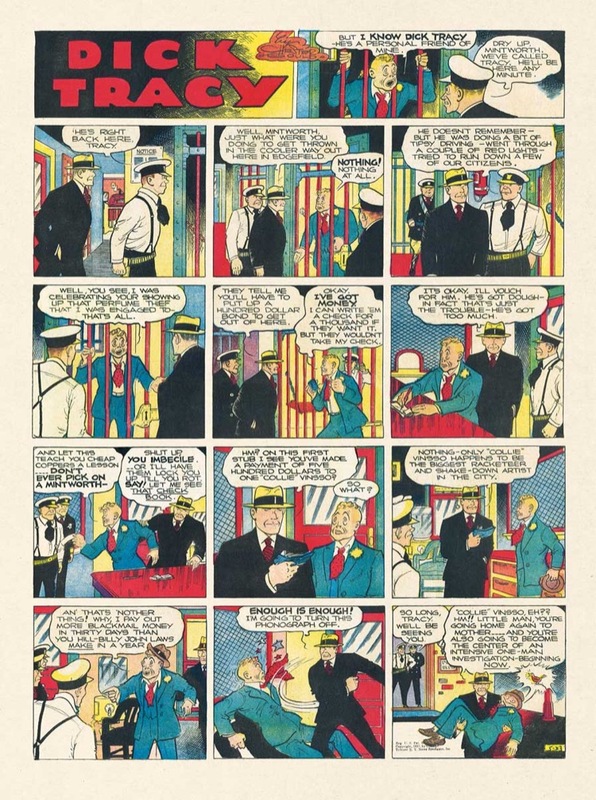 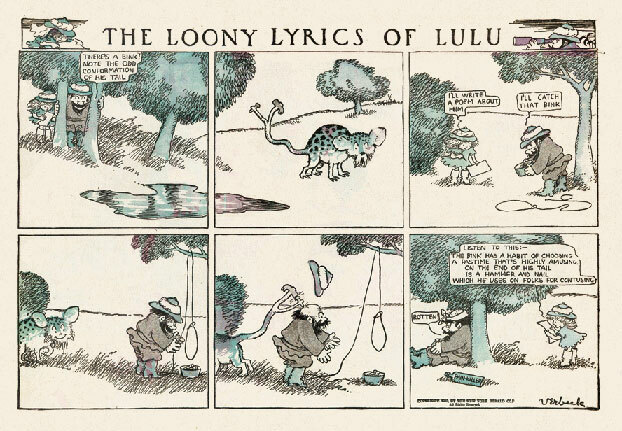 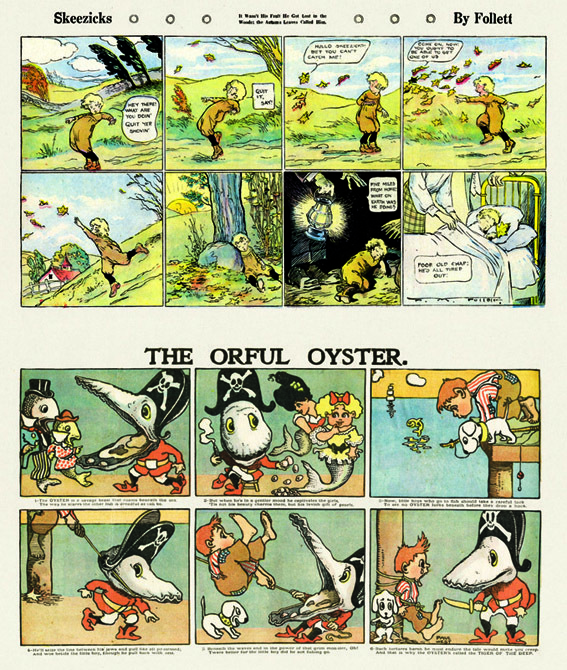 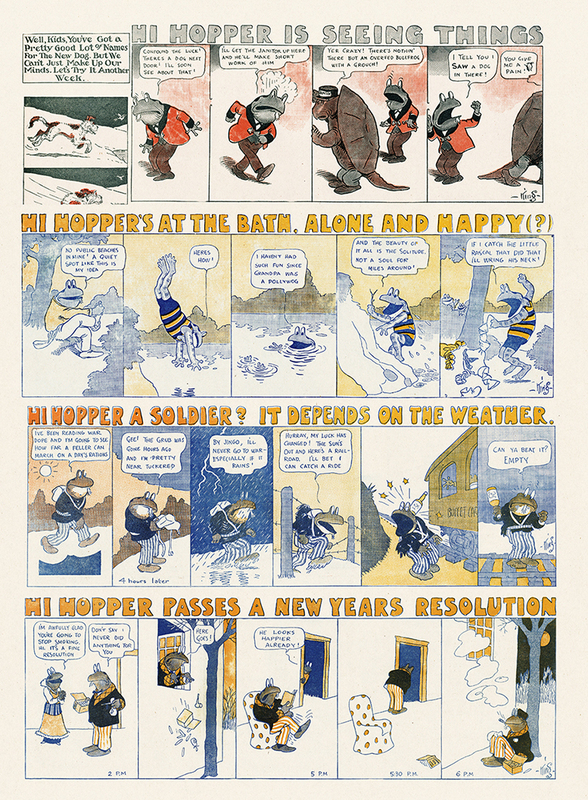 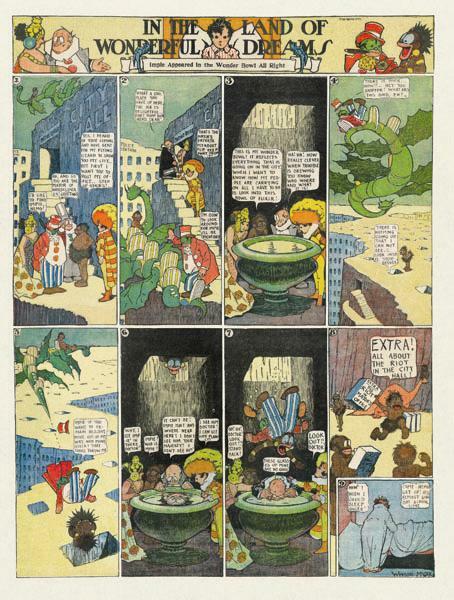 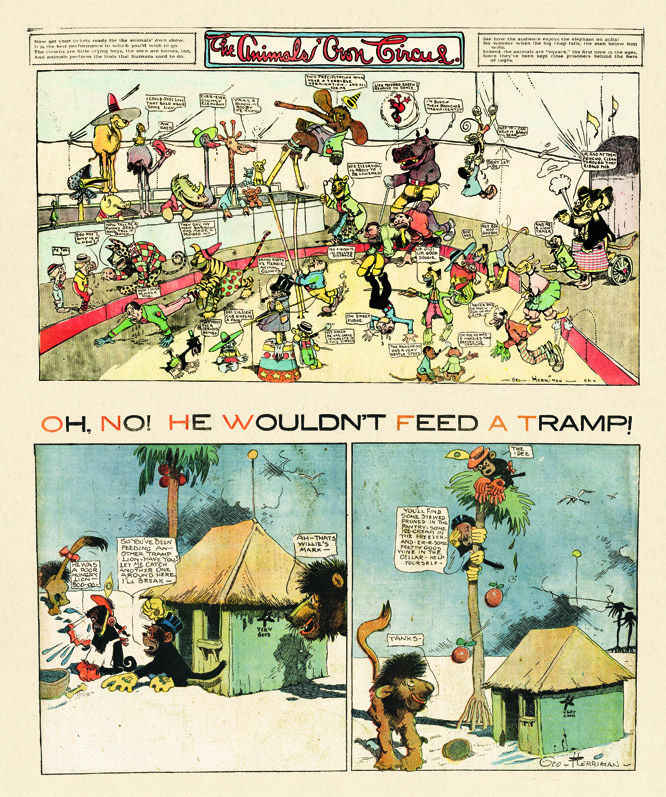 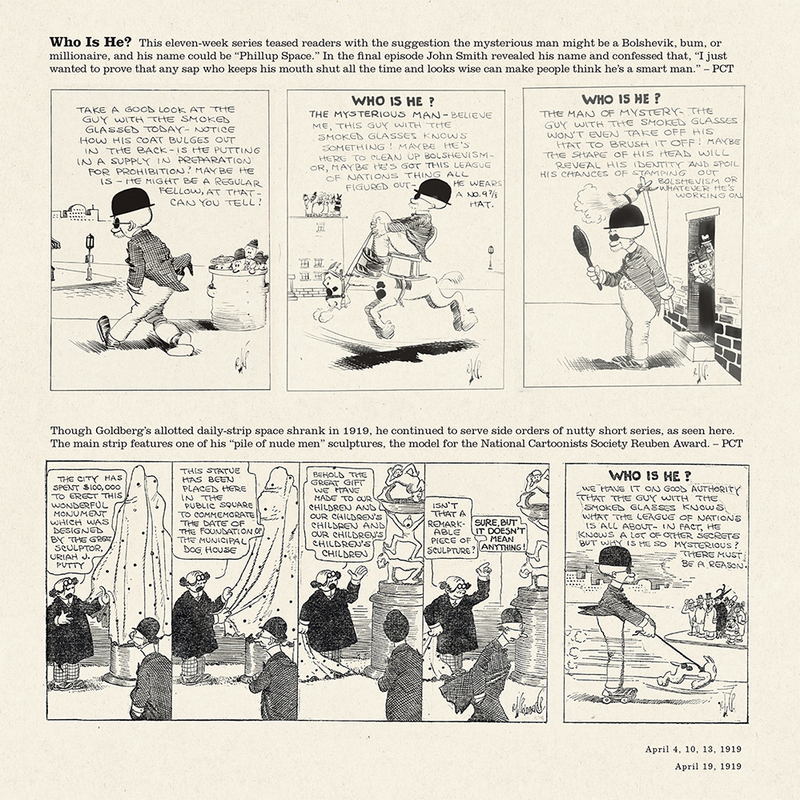 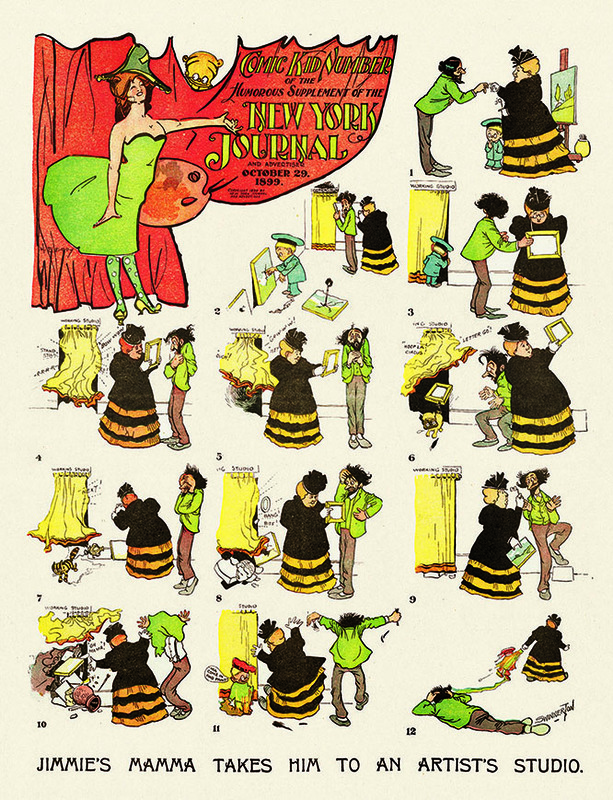 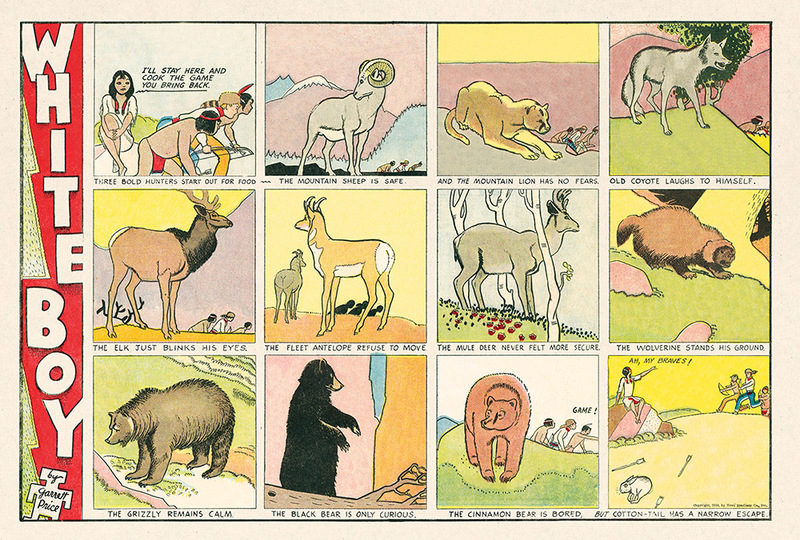 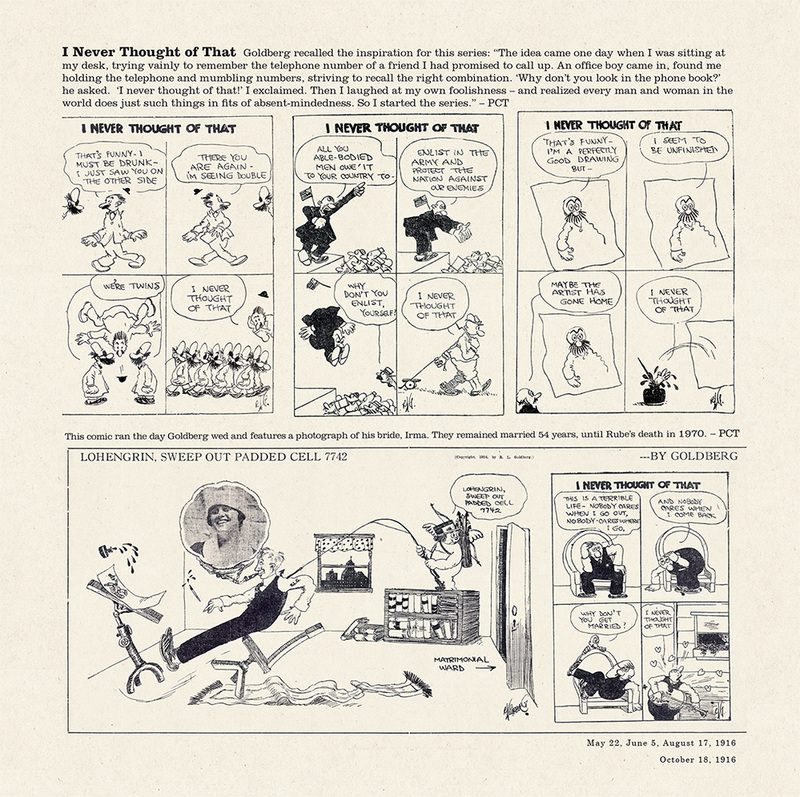 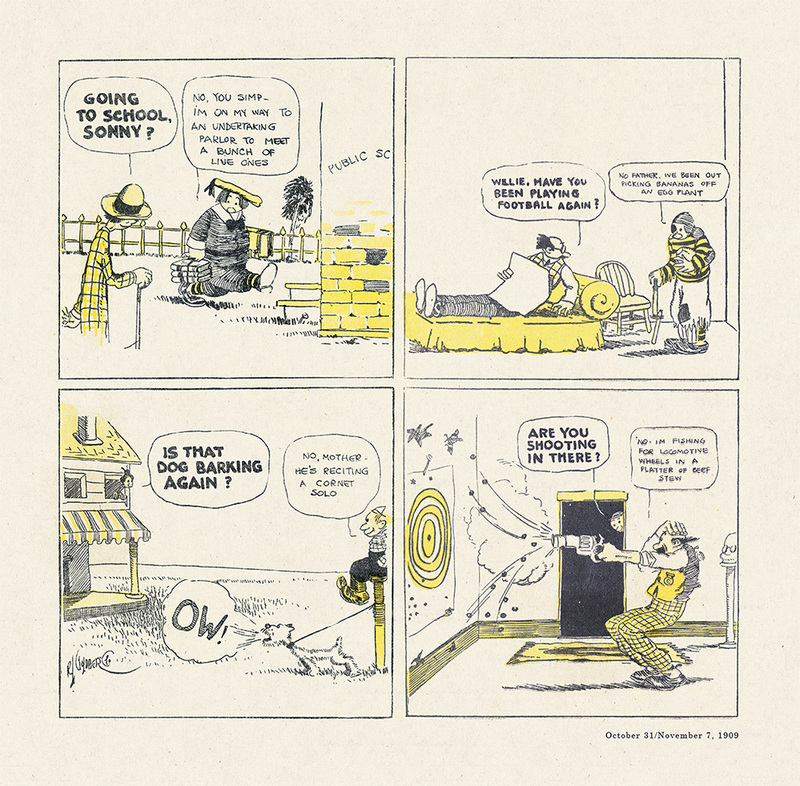 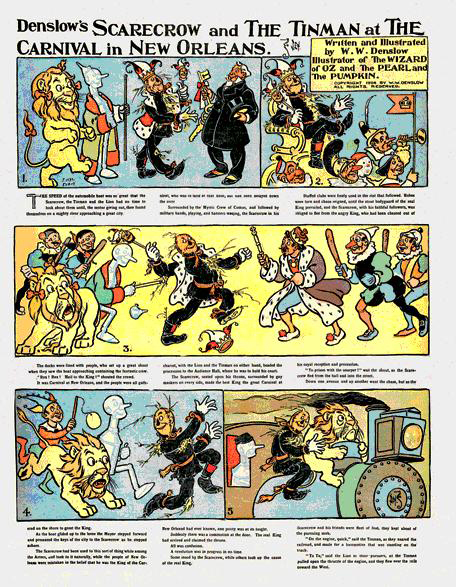 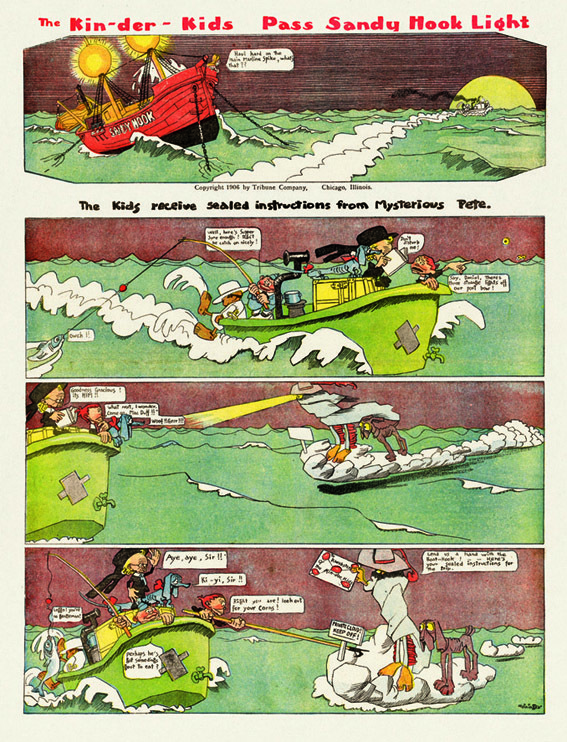 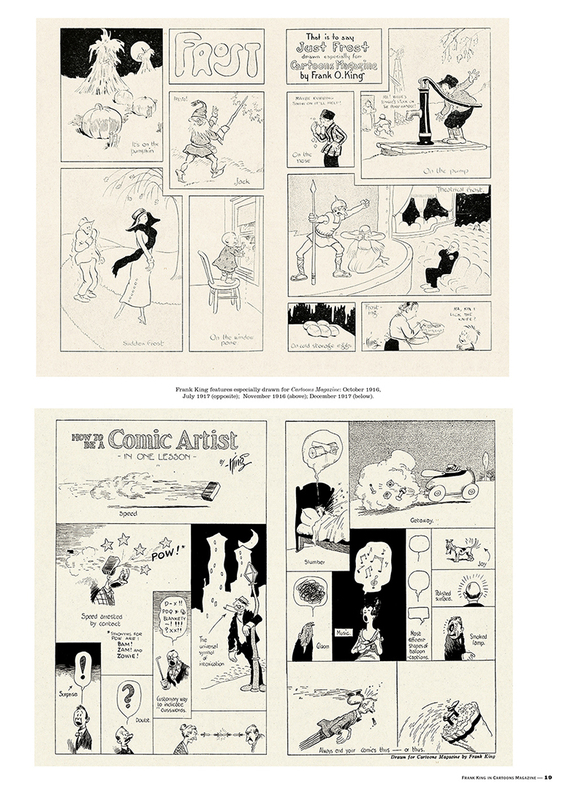 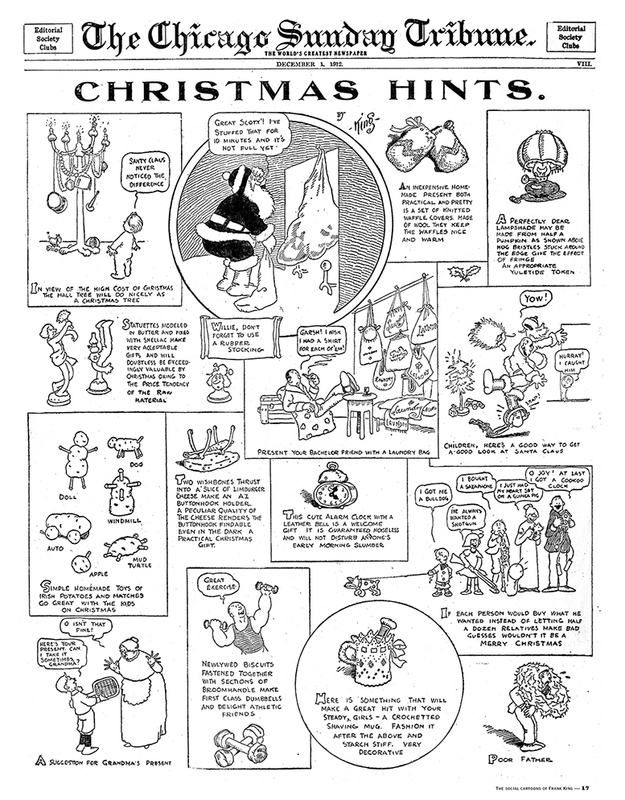 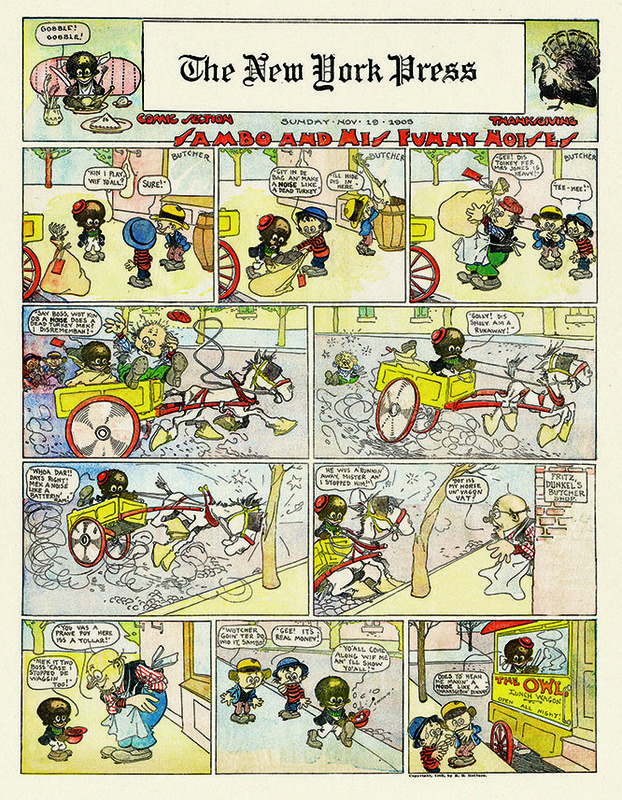 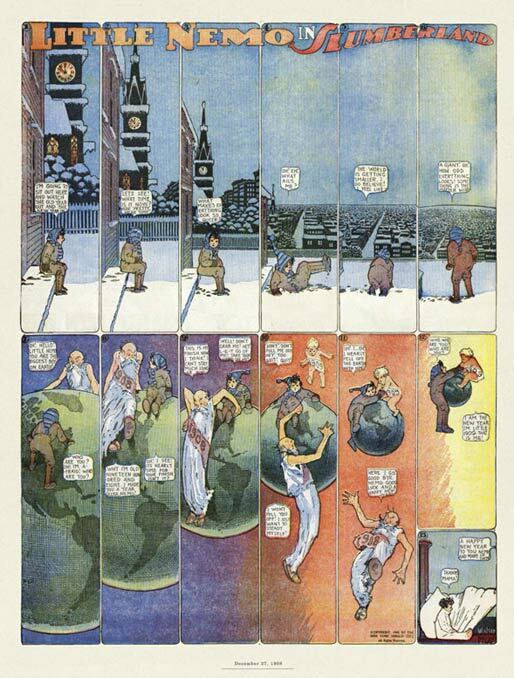 Pages were color-corrected to the estimated natural look of a newspaper comic section of the 1920s and '30s. 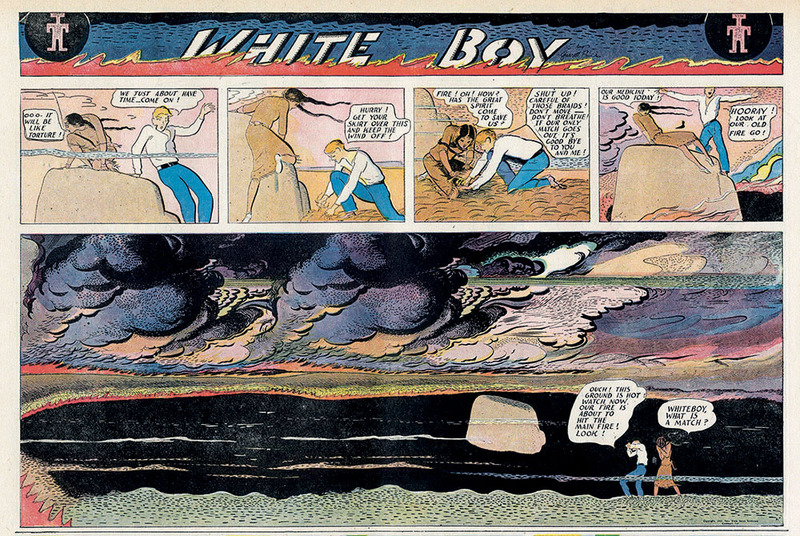 Many of the natural imperfections, such as a color bleed or flaws in the paper, were left alone. 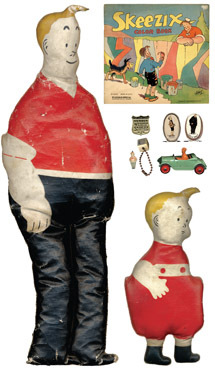 Those damages inflicted by time: stains, rips, and excessive yellowing, were repaired. 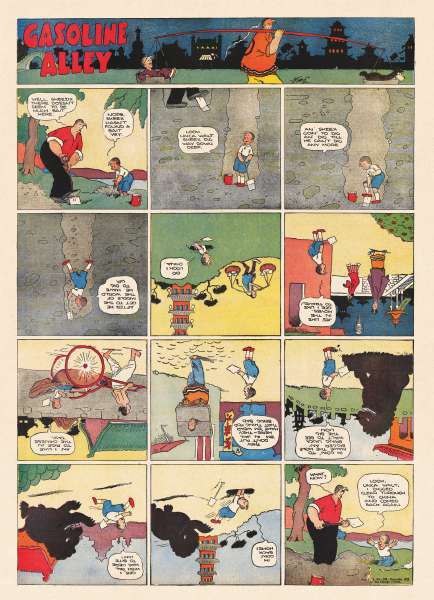 I've already gone on at length in the daily reprints of Gasoline Alley as to how having Frank King's work properly collected and printed has been a longtime dream of mine (both as a reader and an artist inspired by his work) so I won't recapitulate that here. 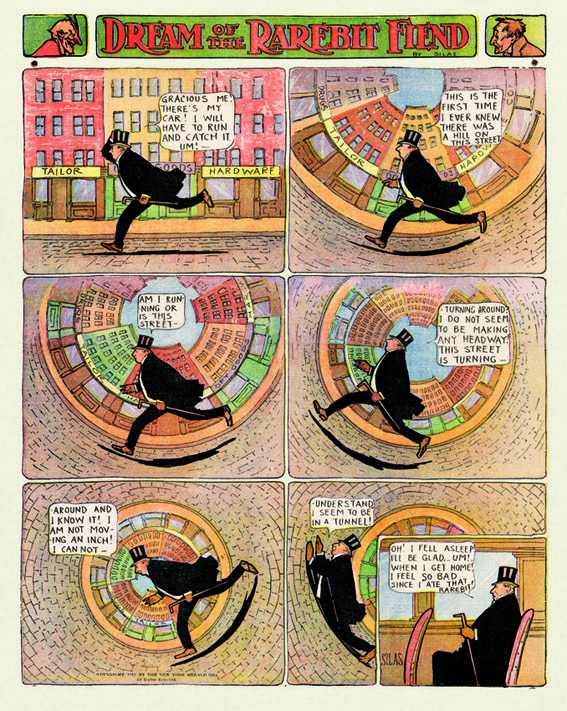 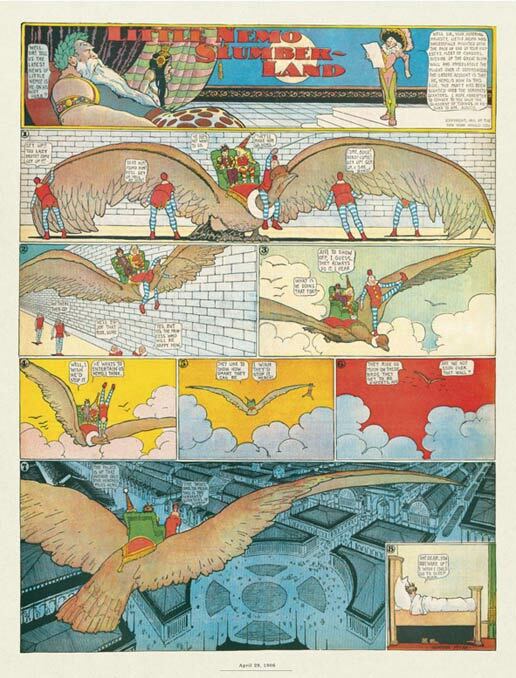 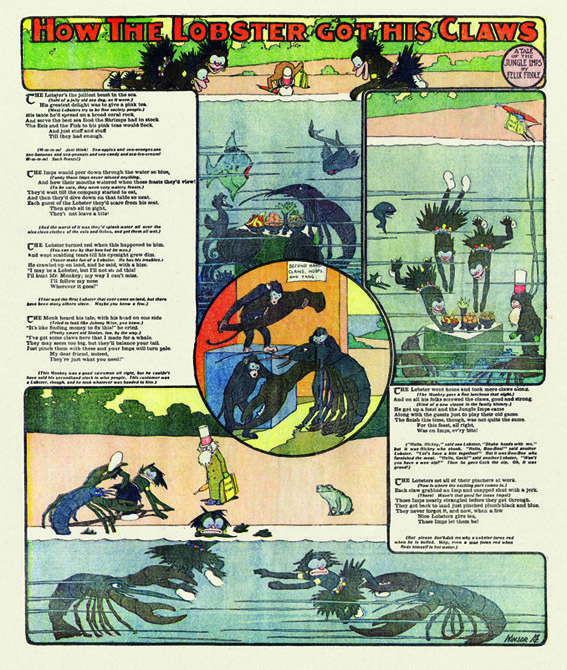 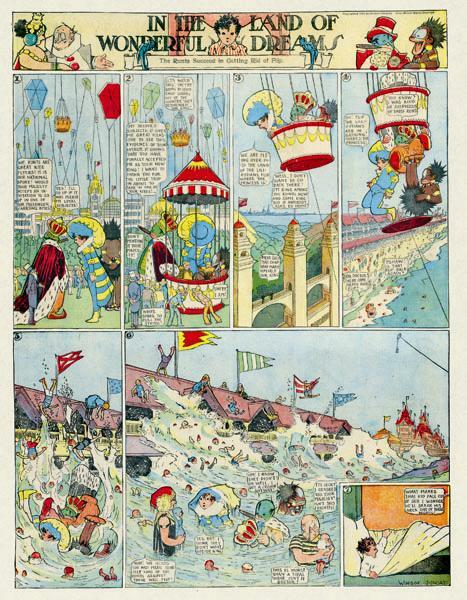 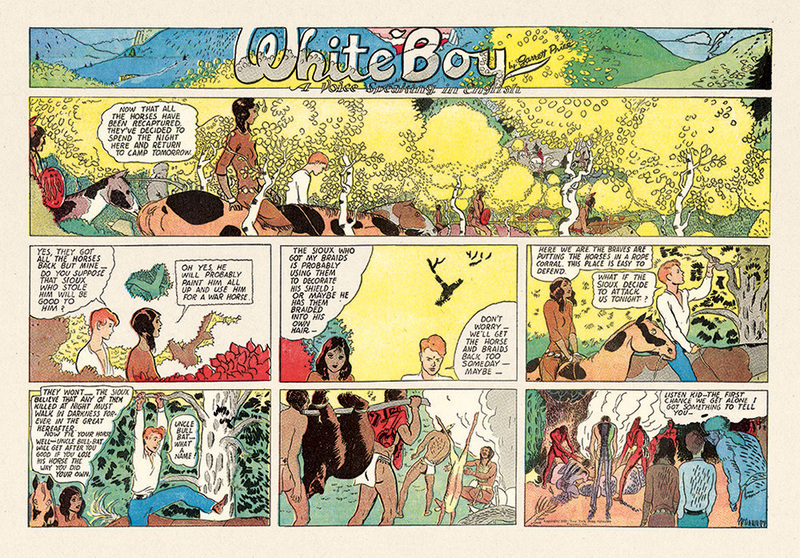 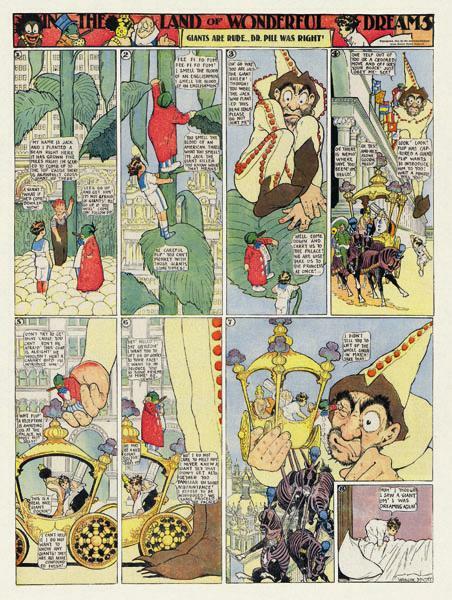 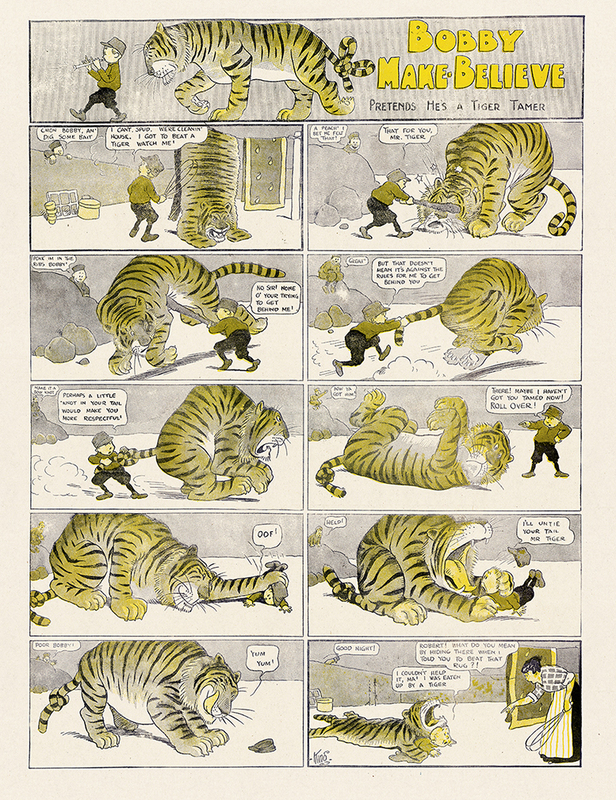 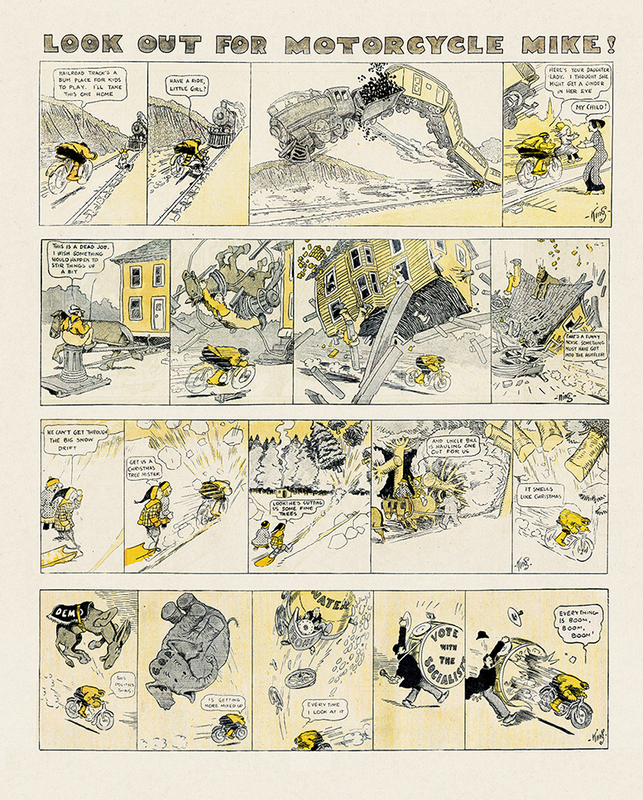 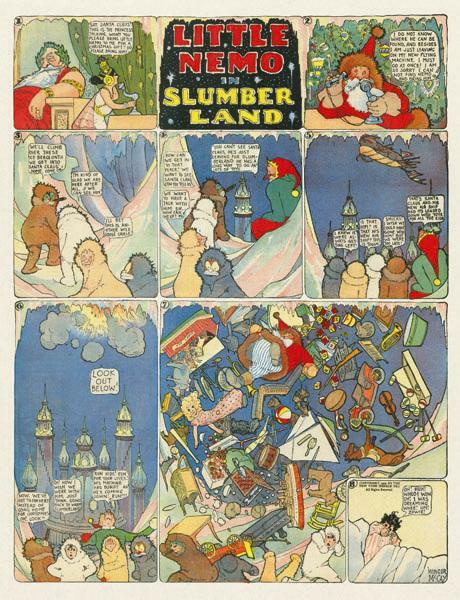 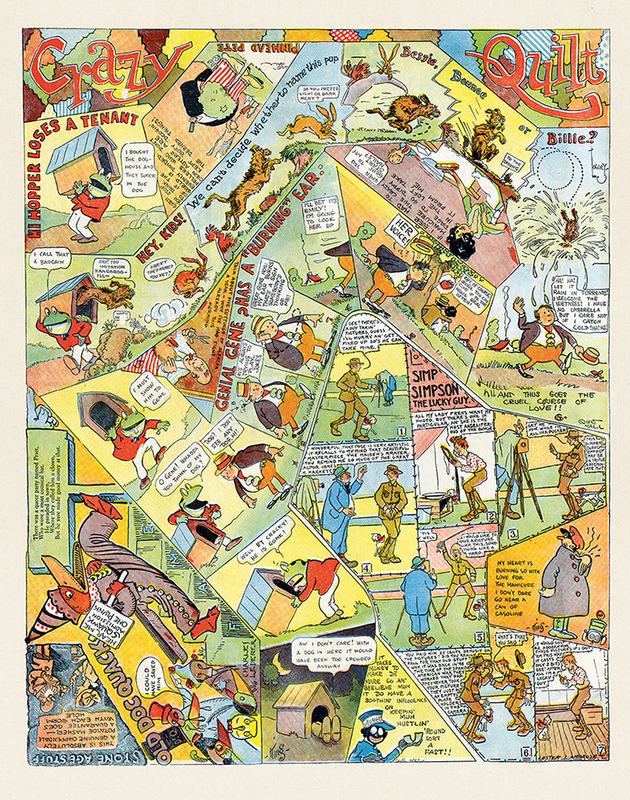 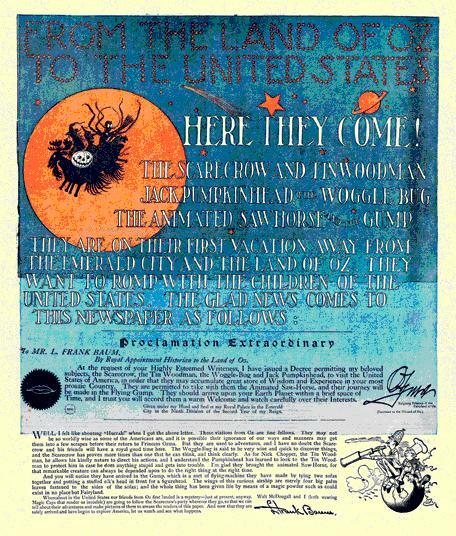 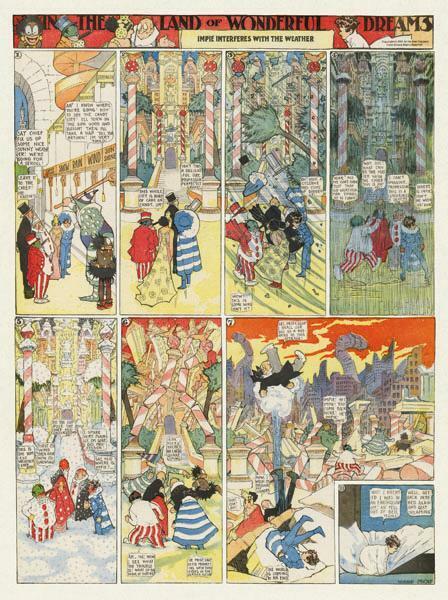 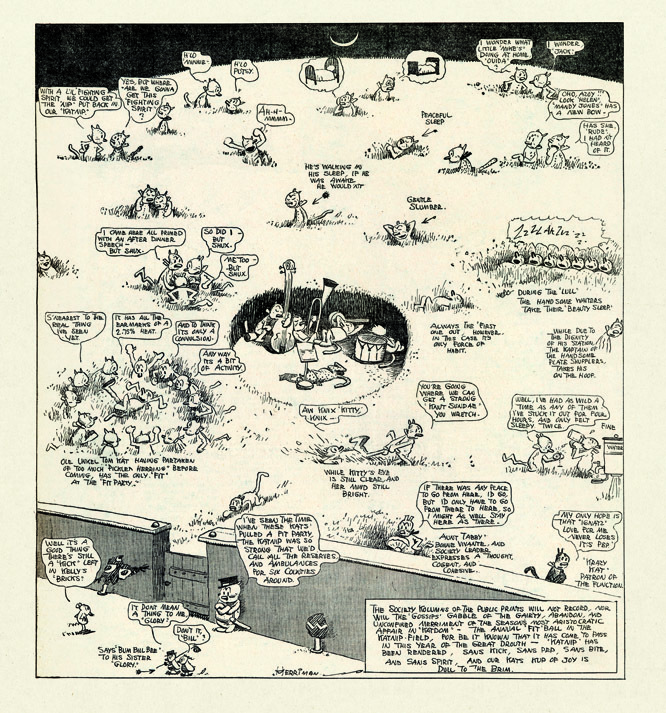 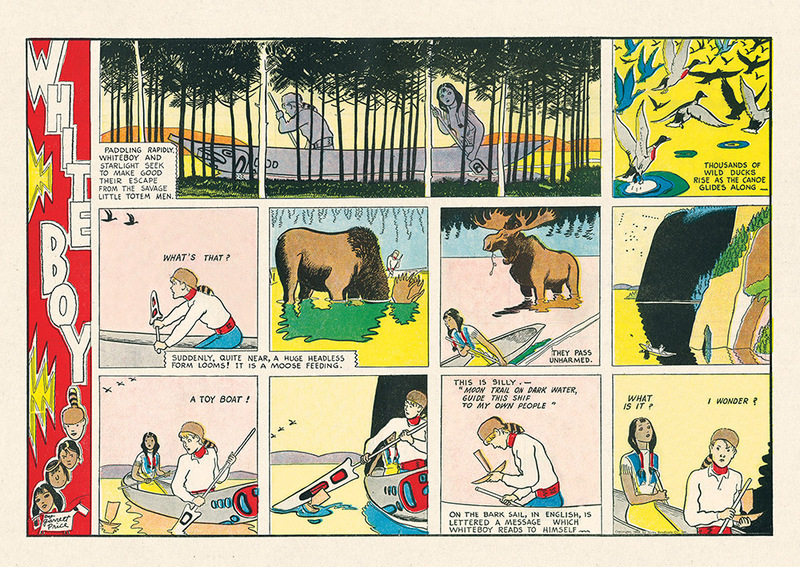 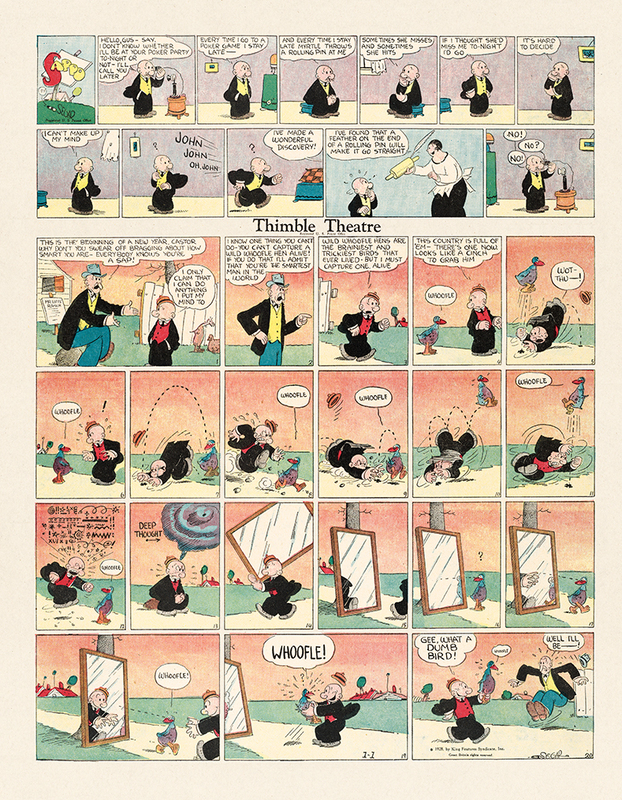 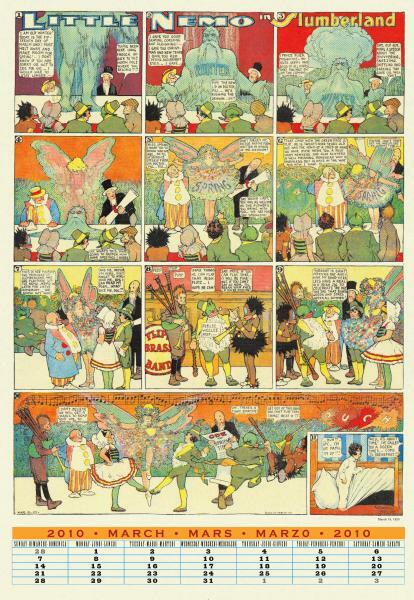 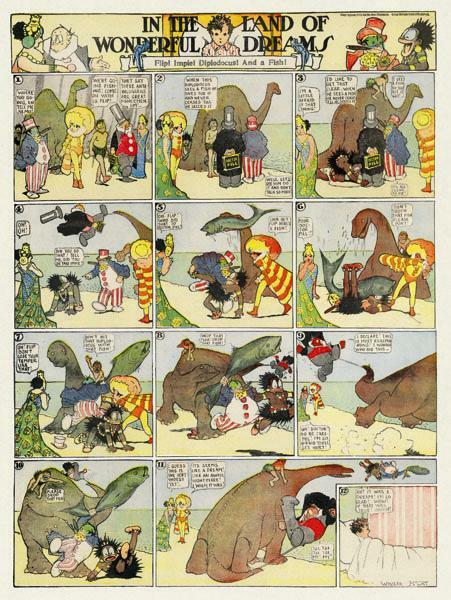 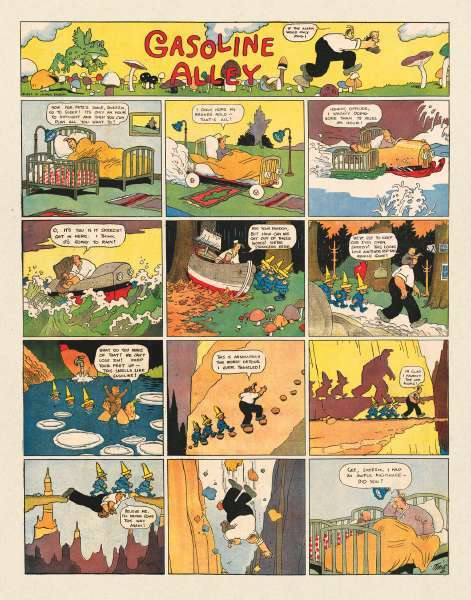 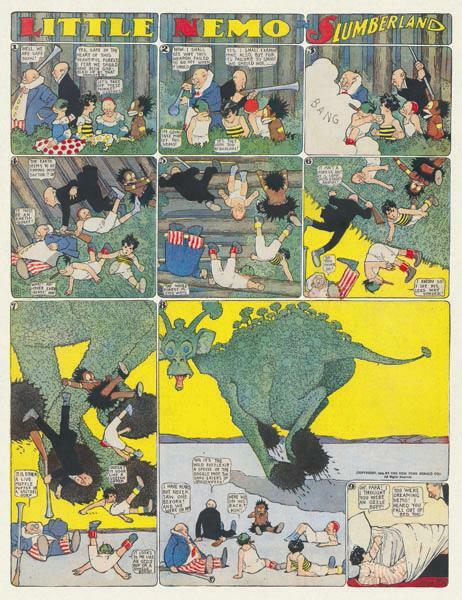 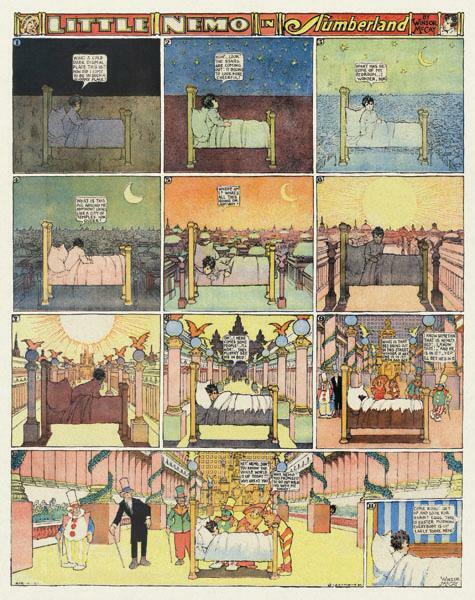 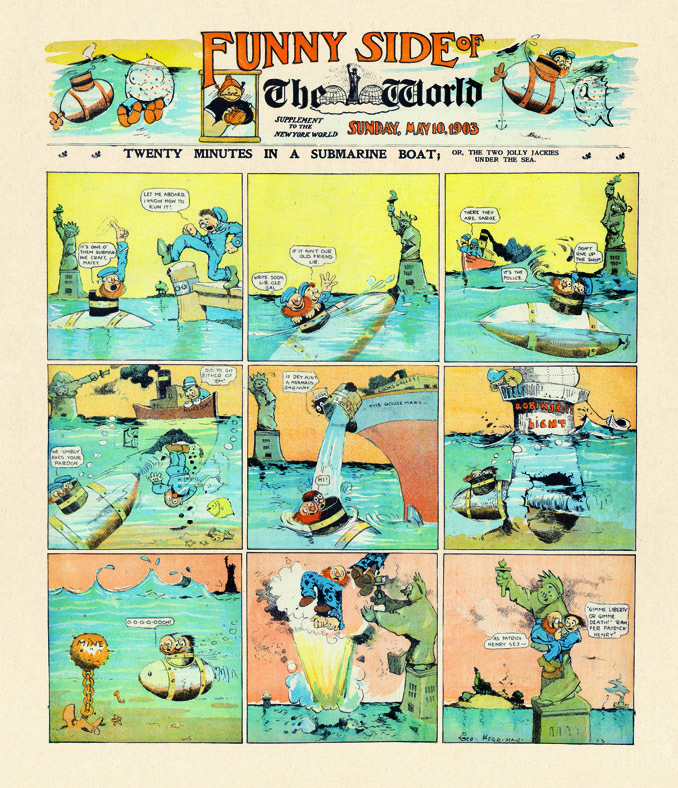 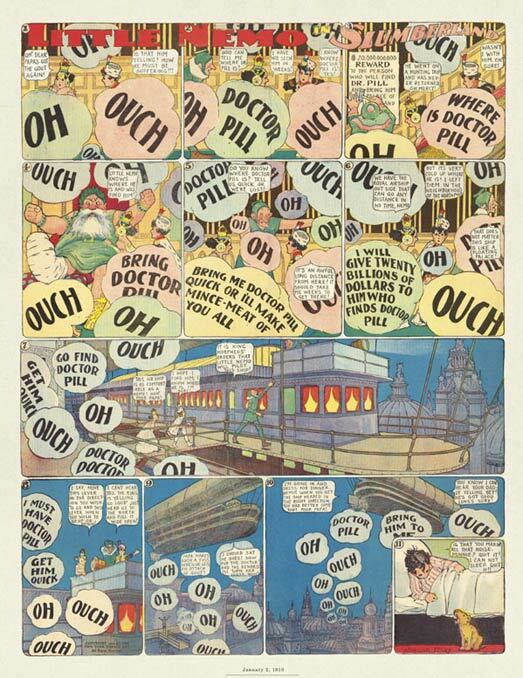 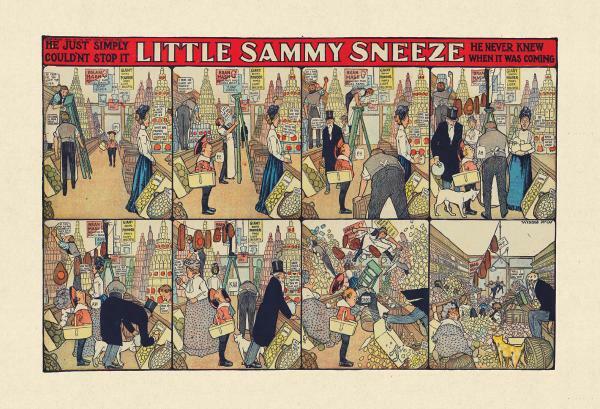 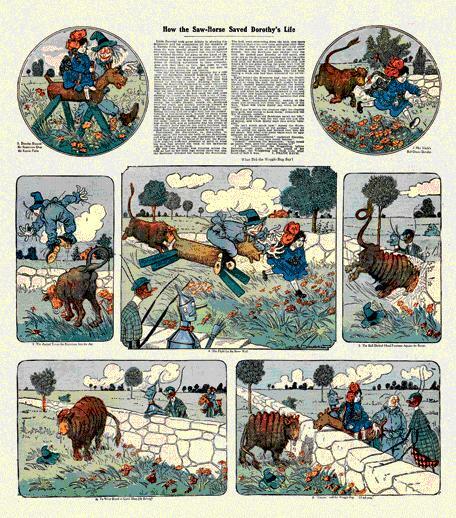 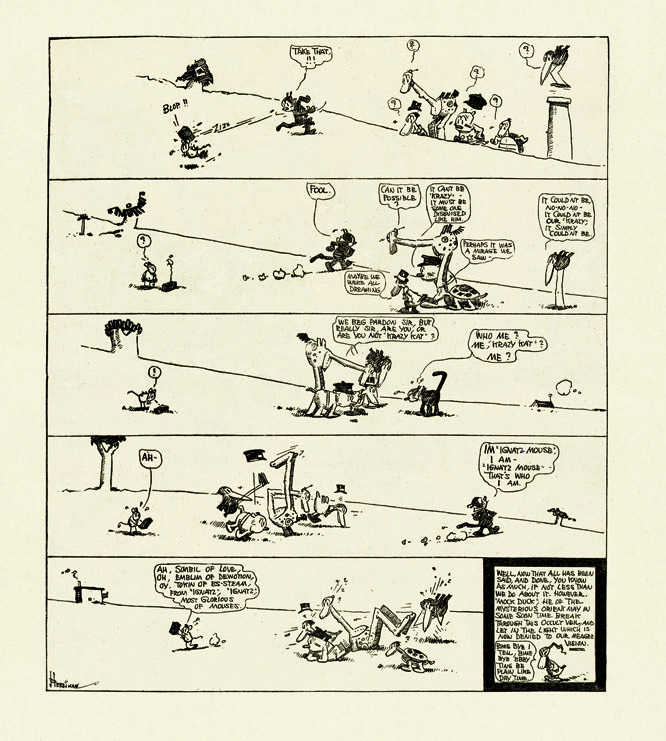 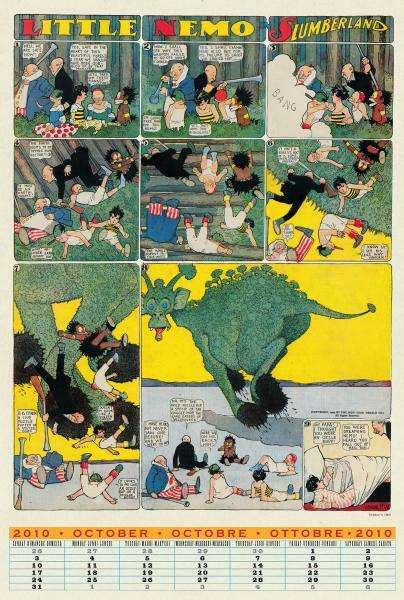 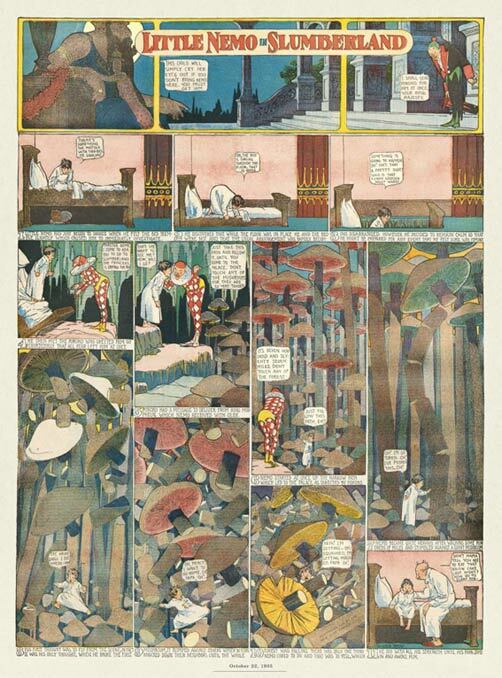 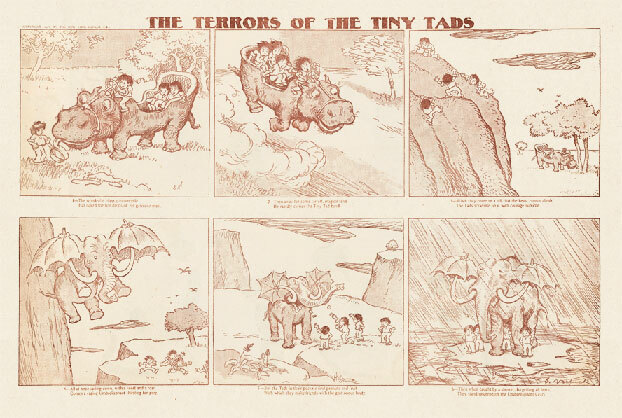 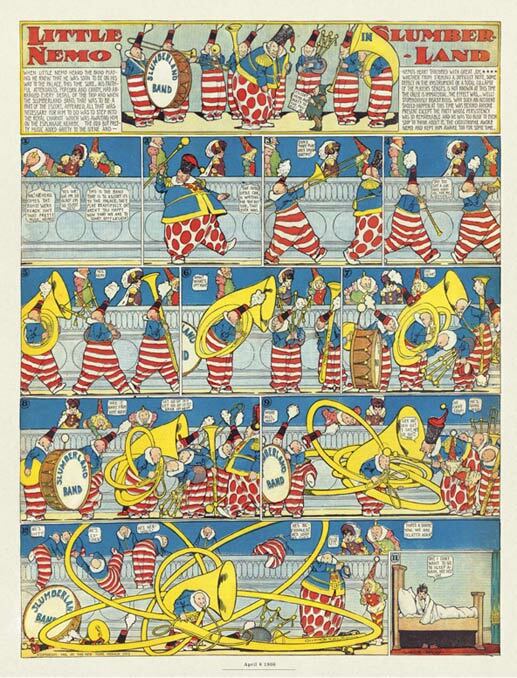 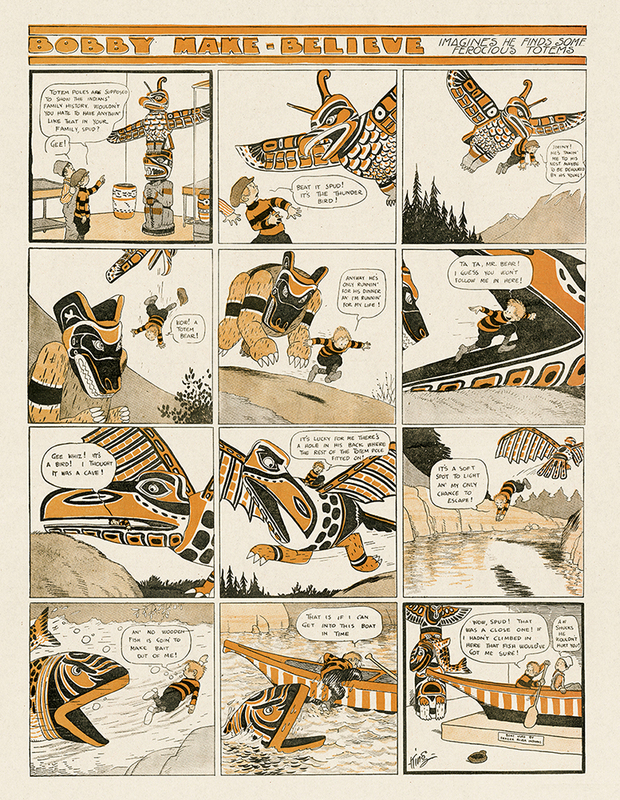 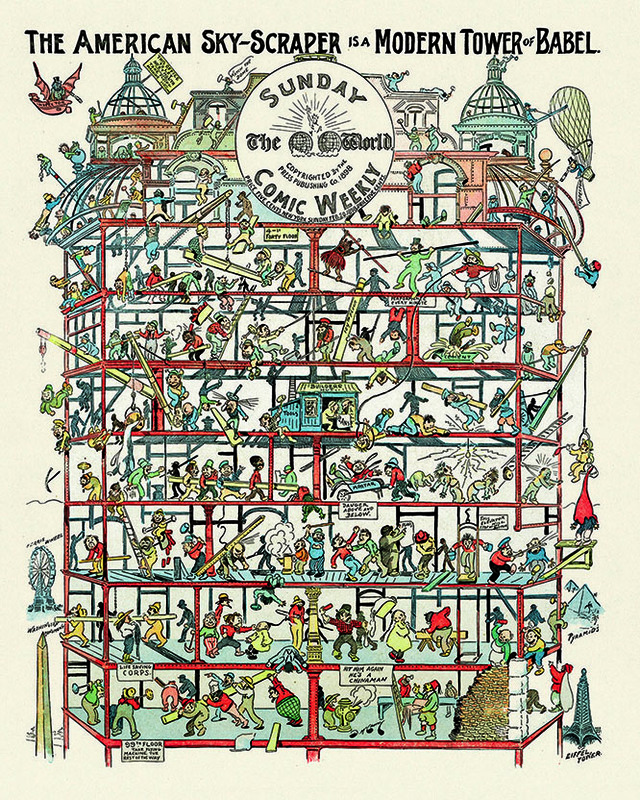 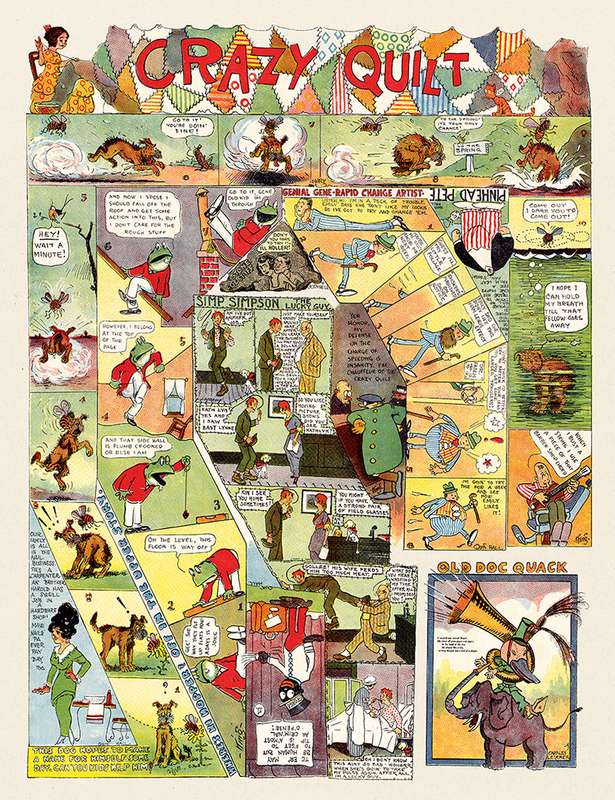 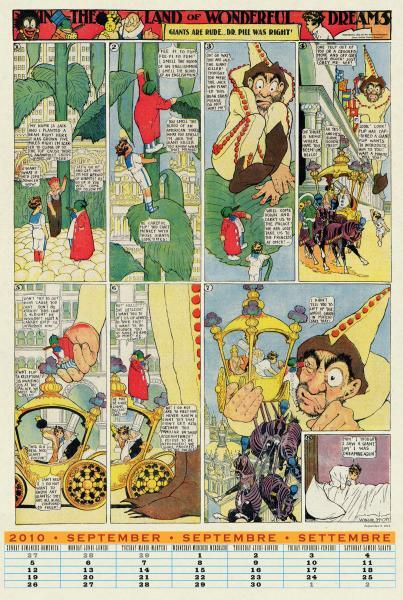 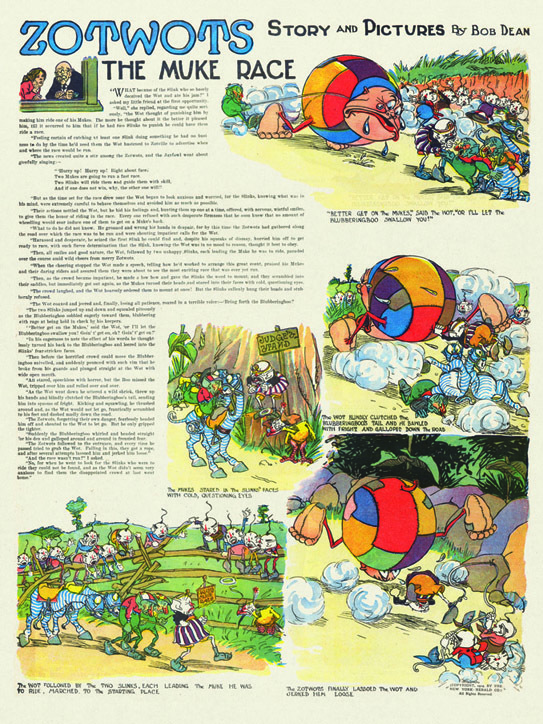 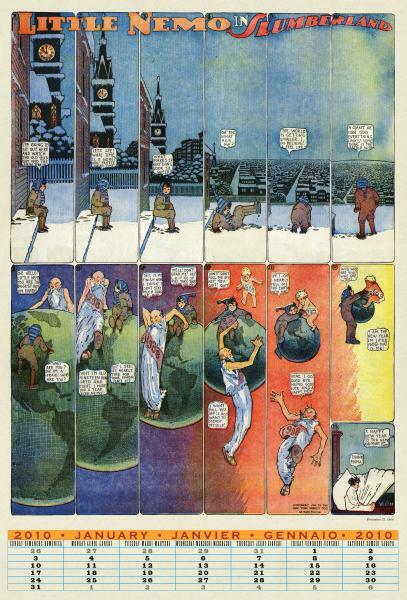 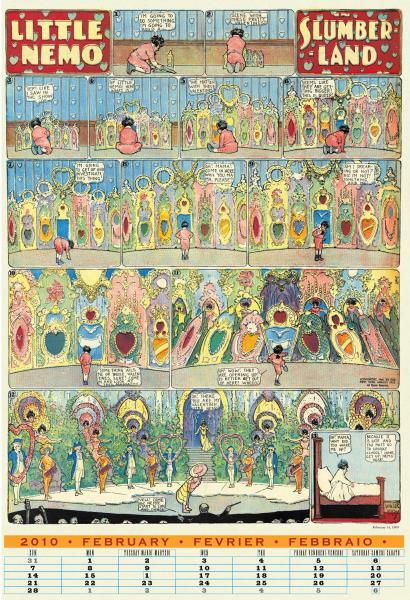 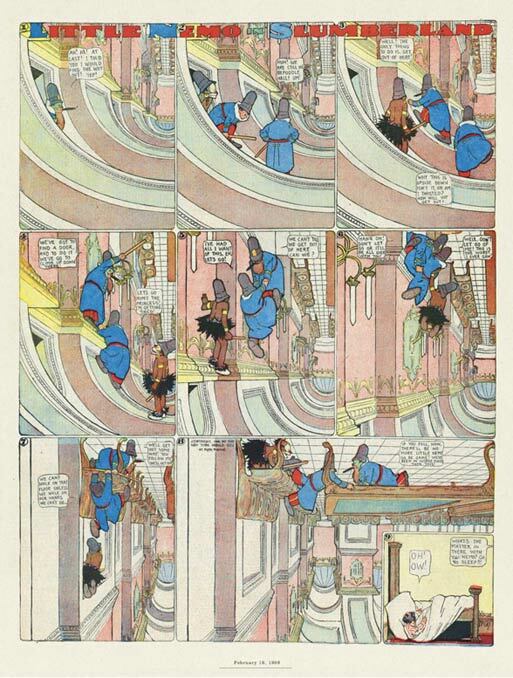 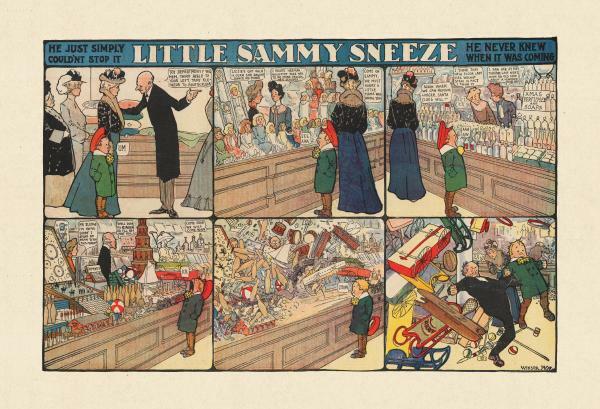 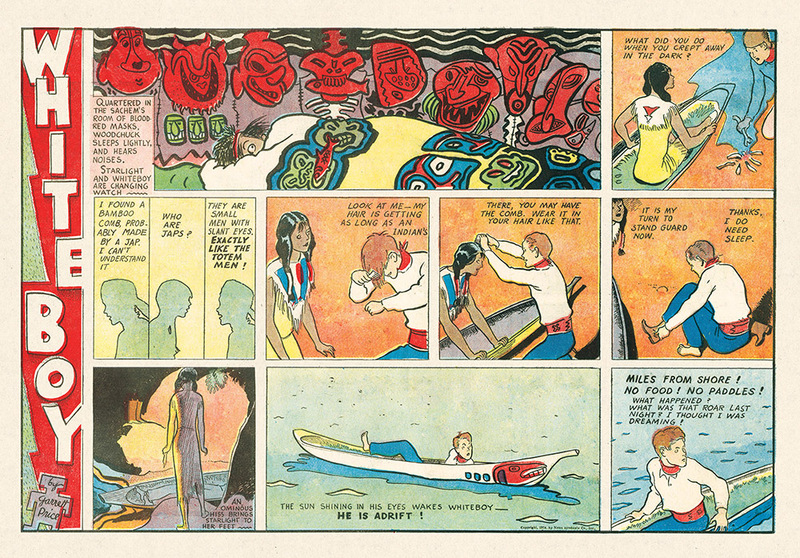 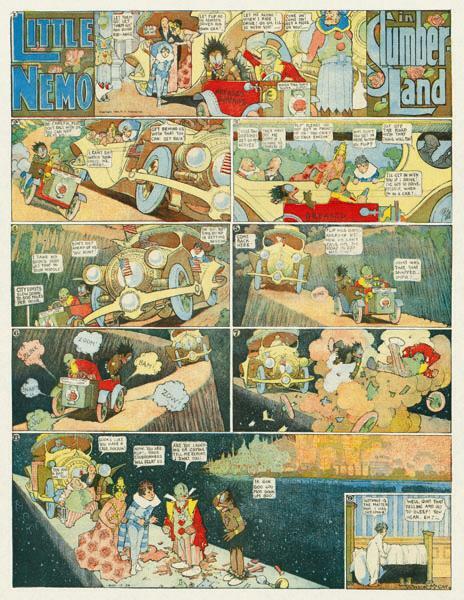 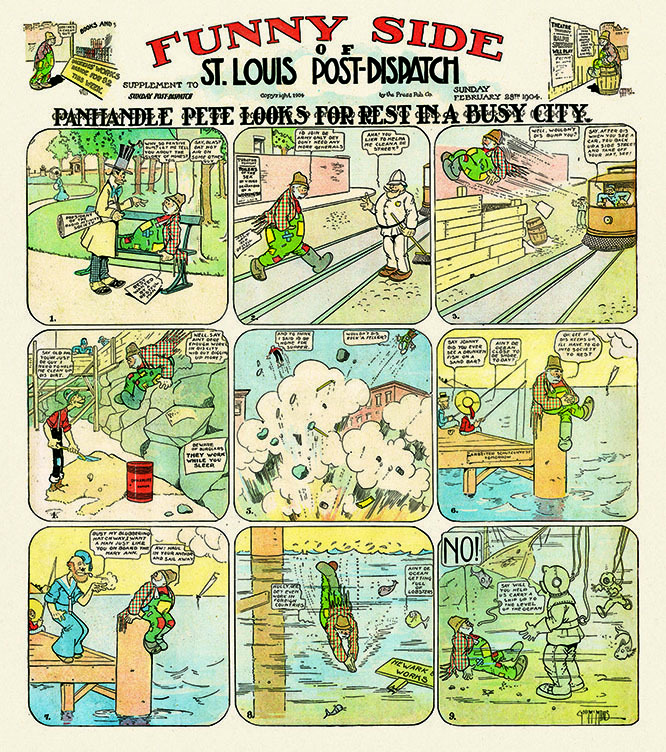 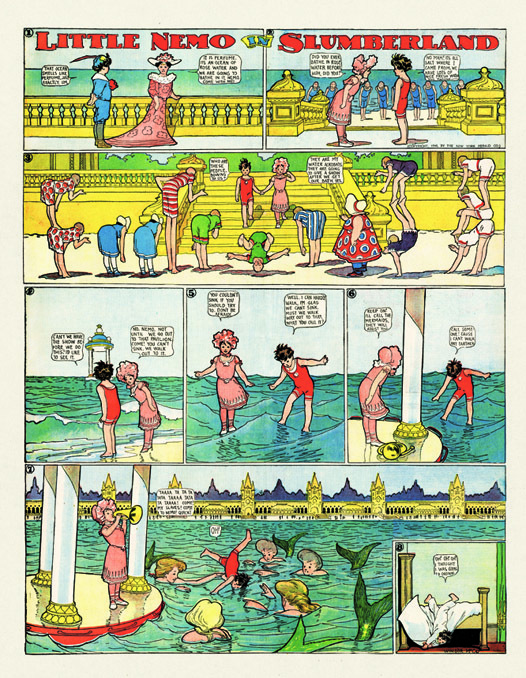 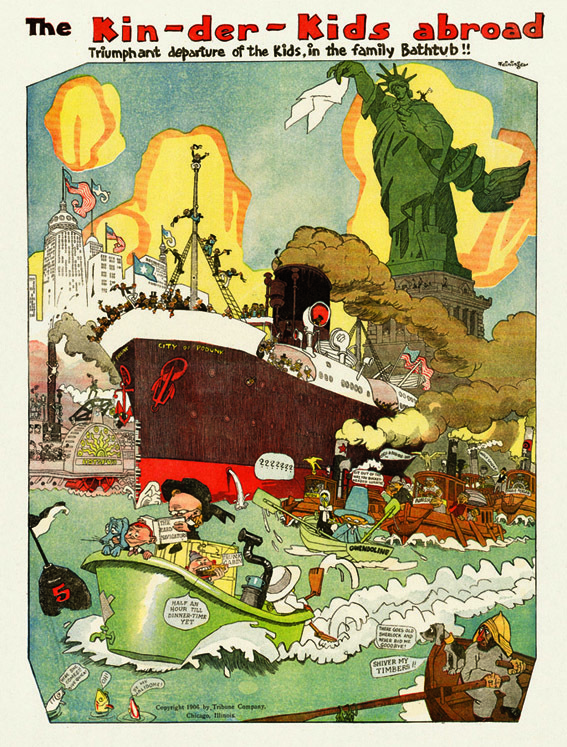 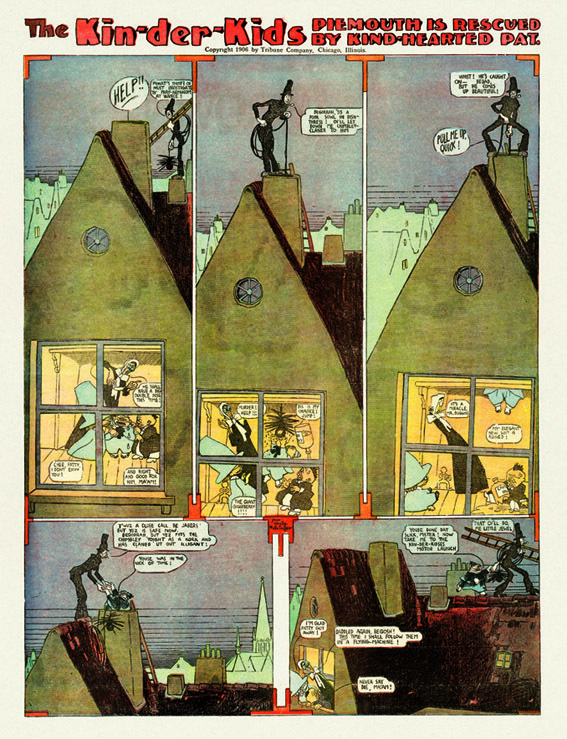 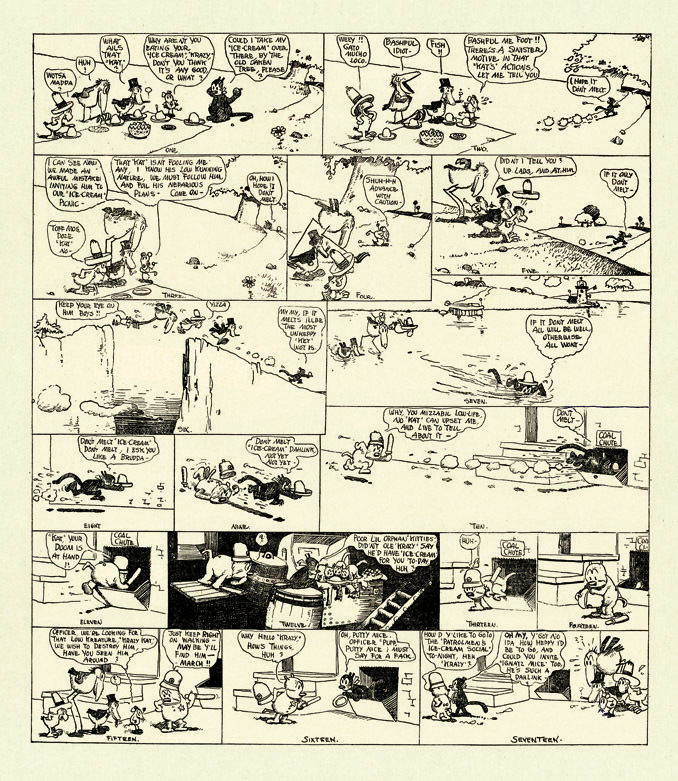 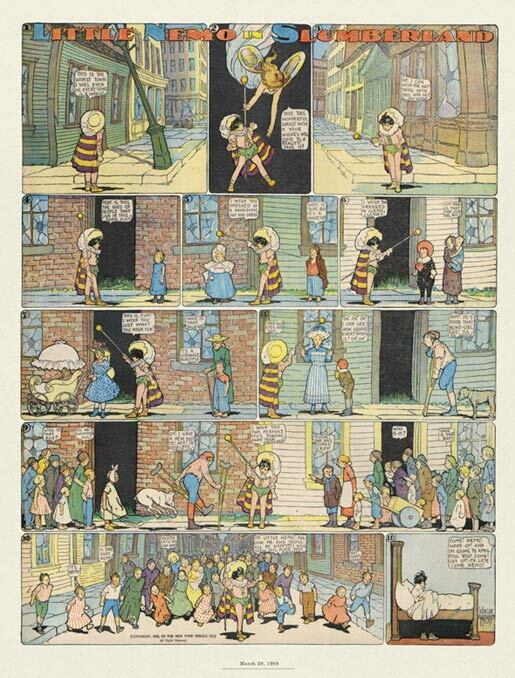 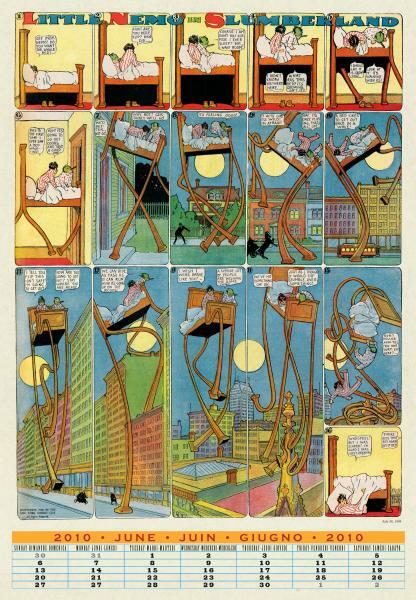 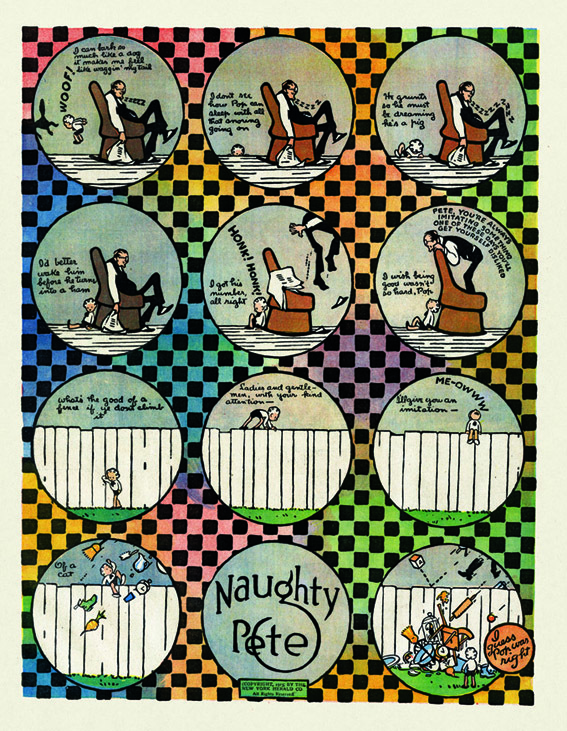 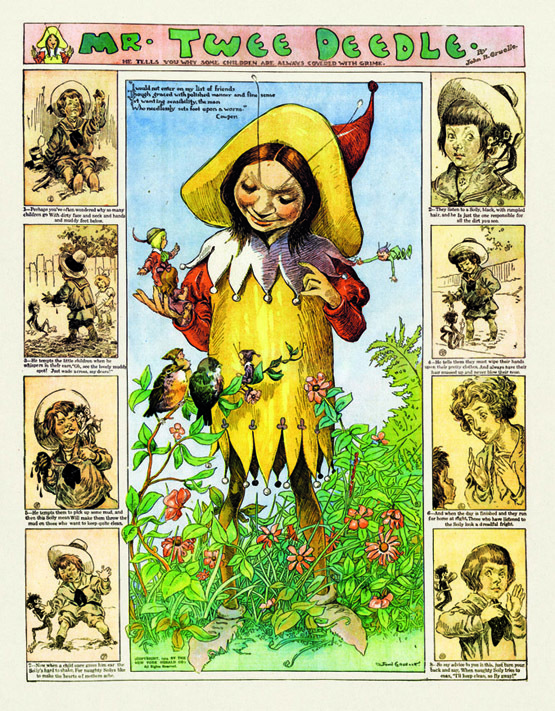 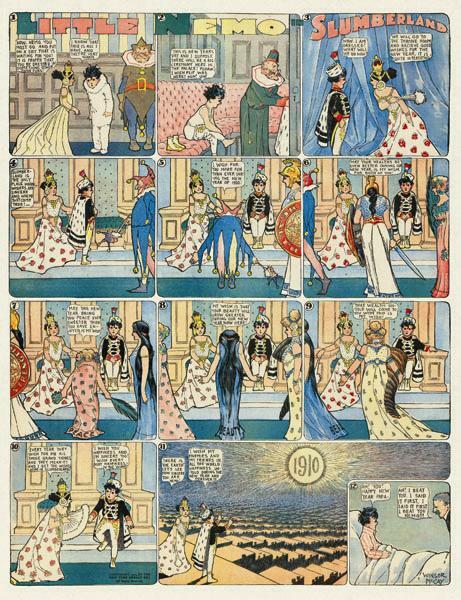 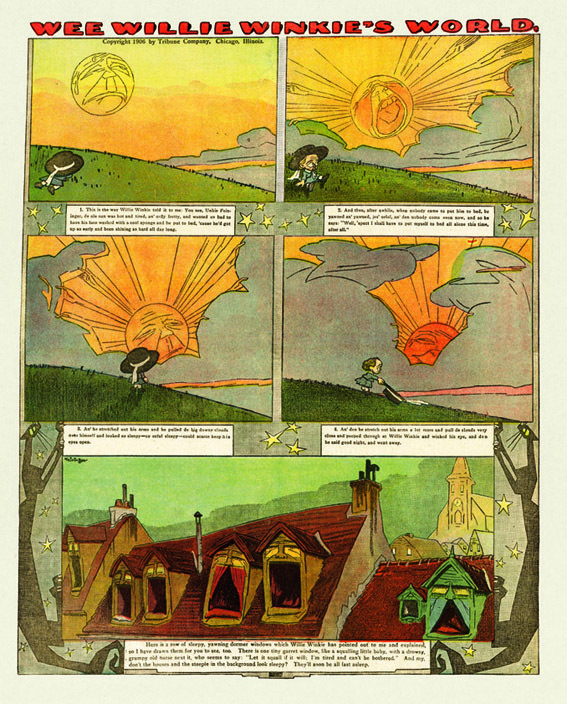 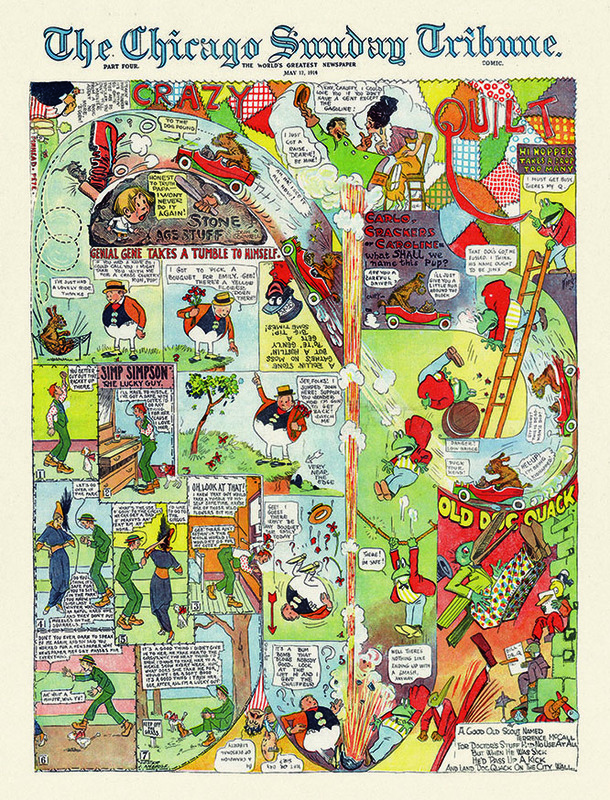 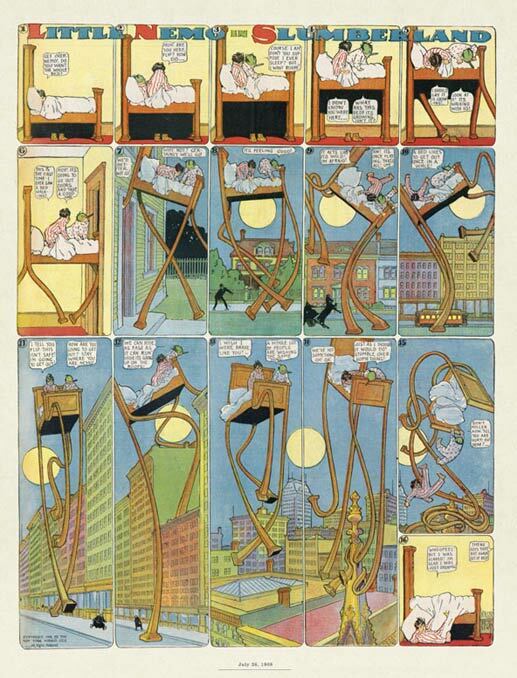 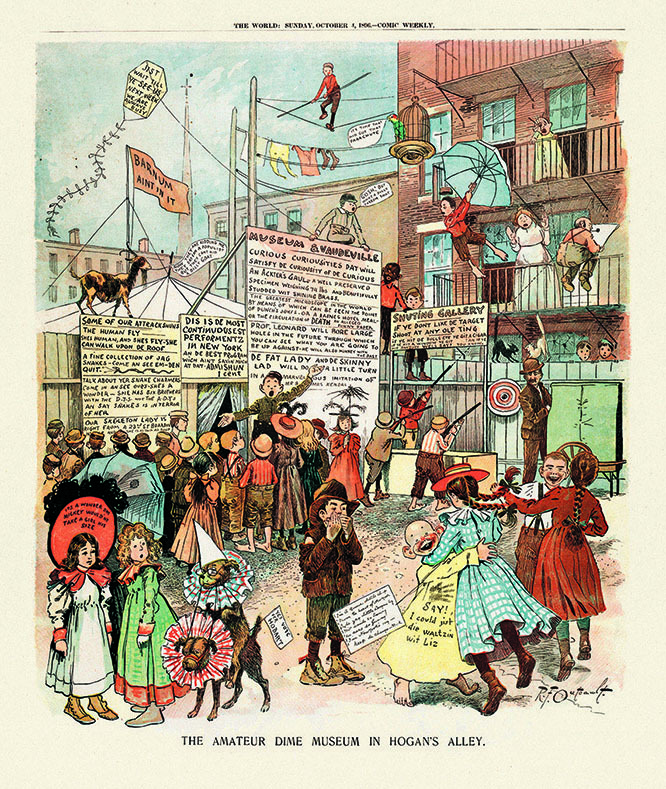 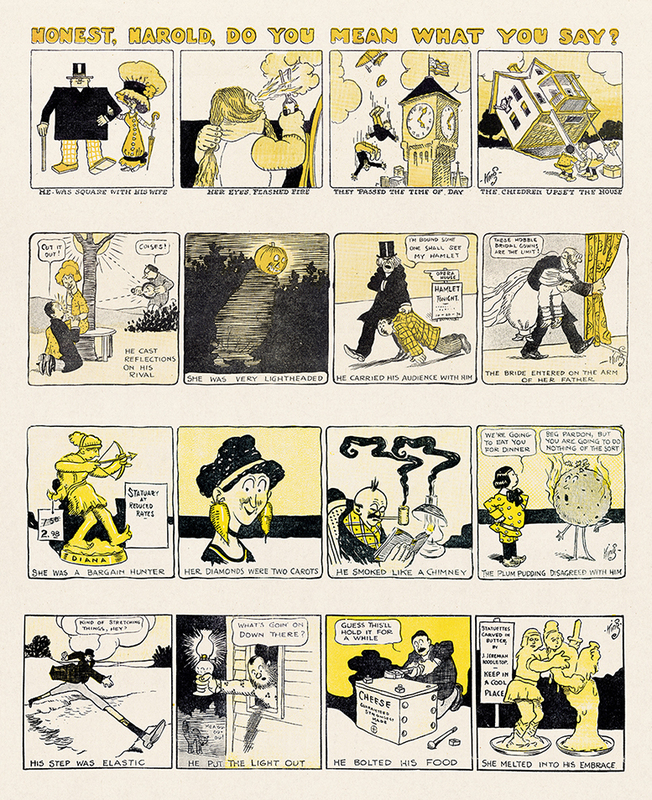 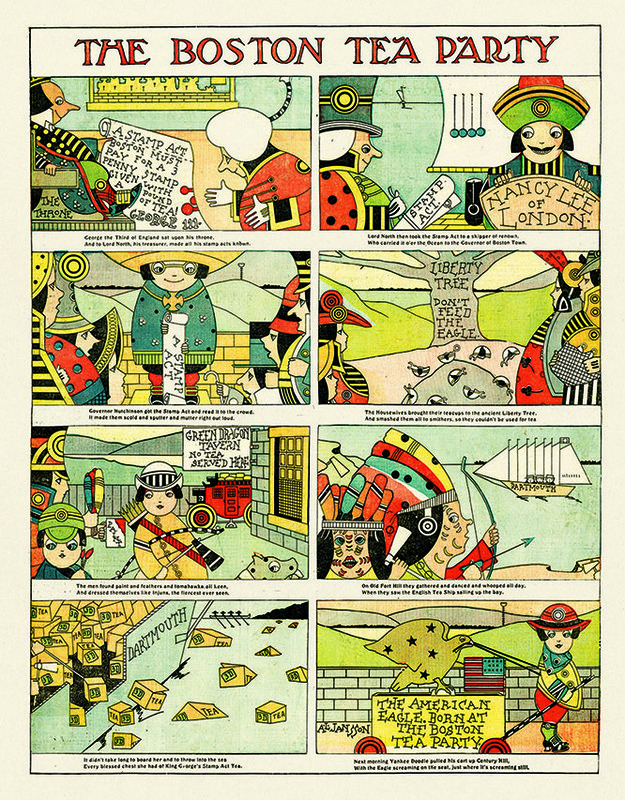 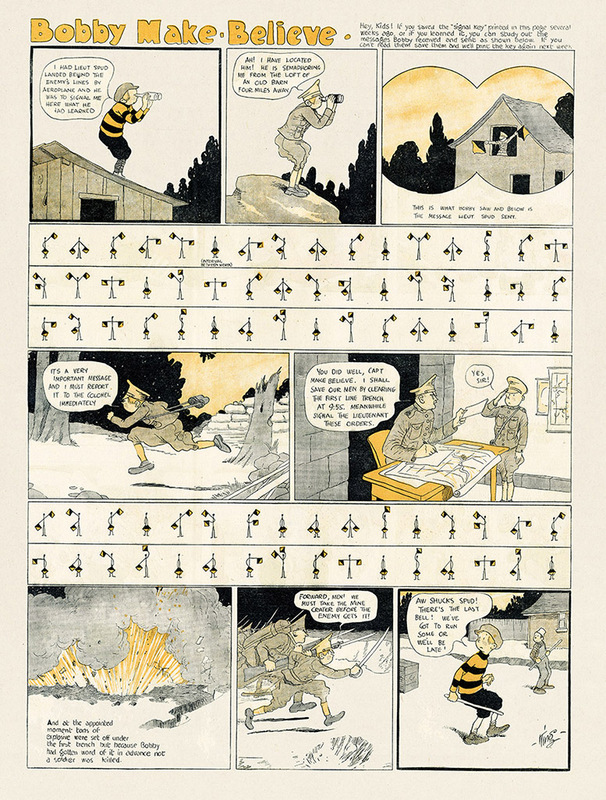 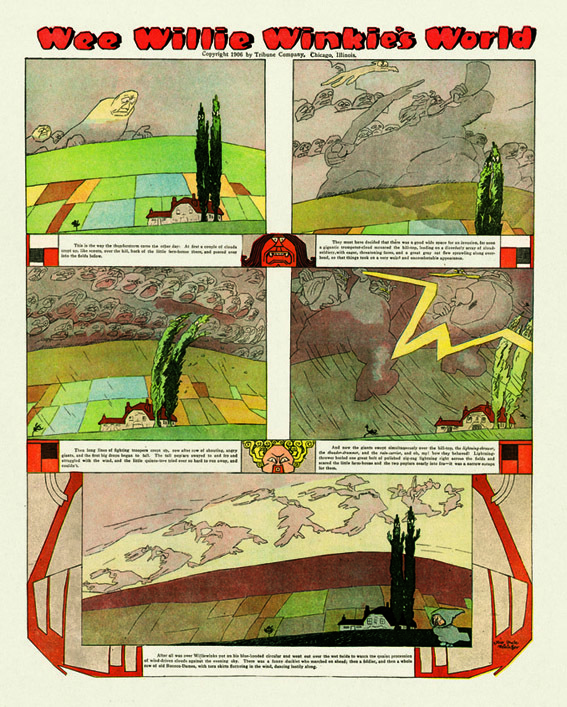 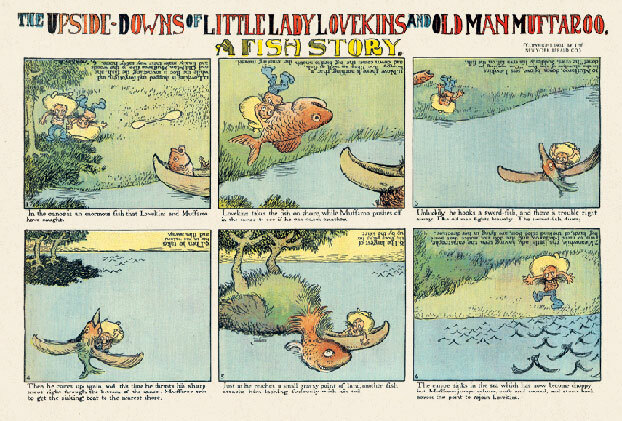 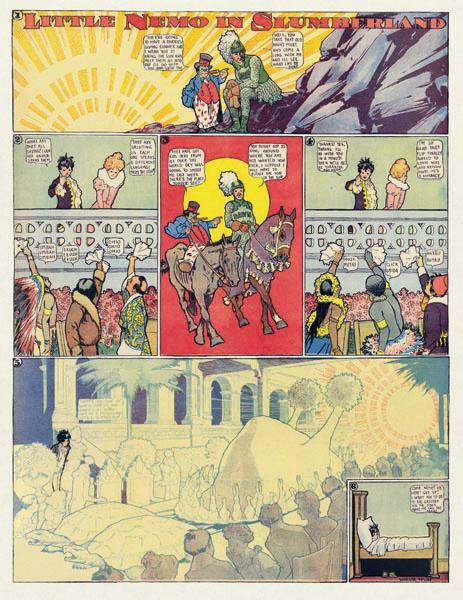 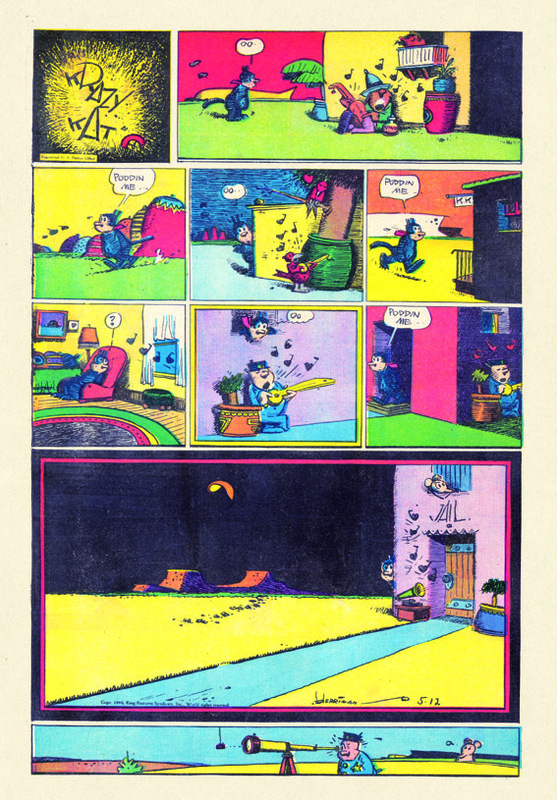 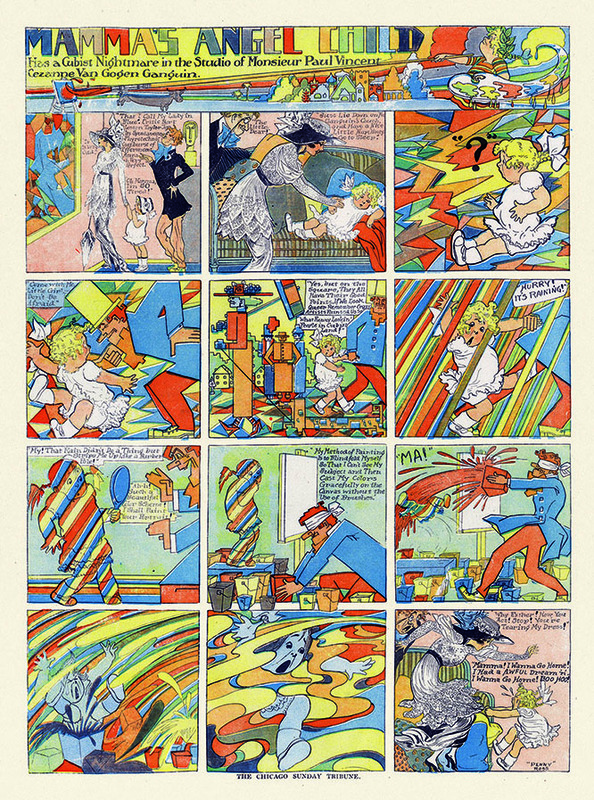 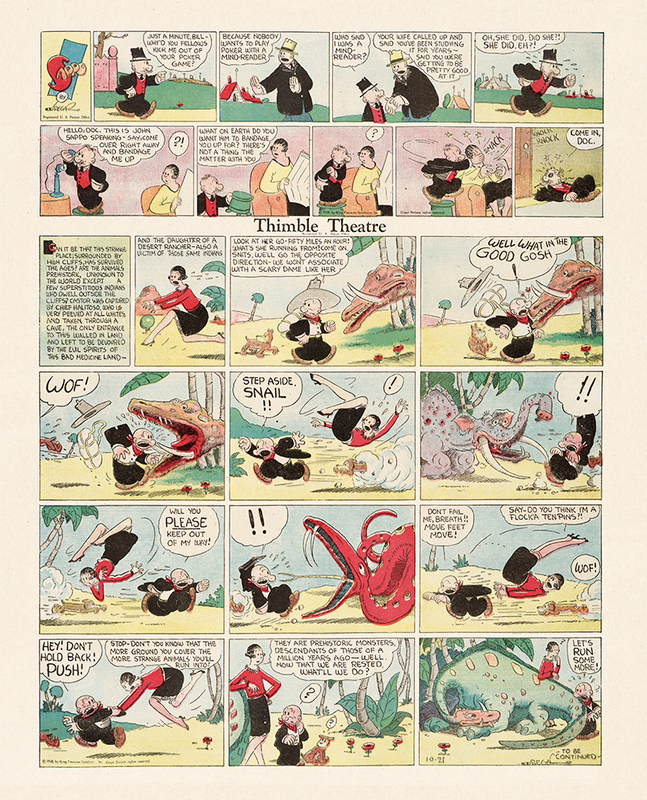 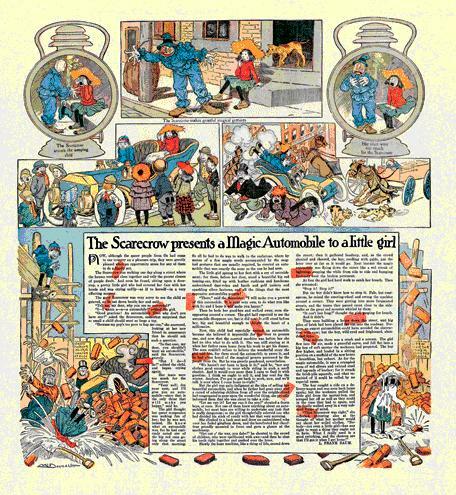 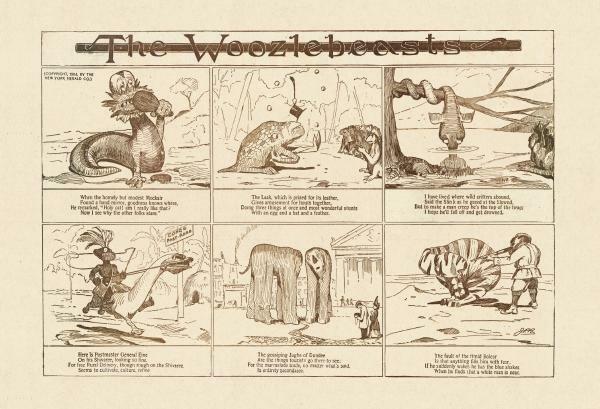 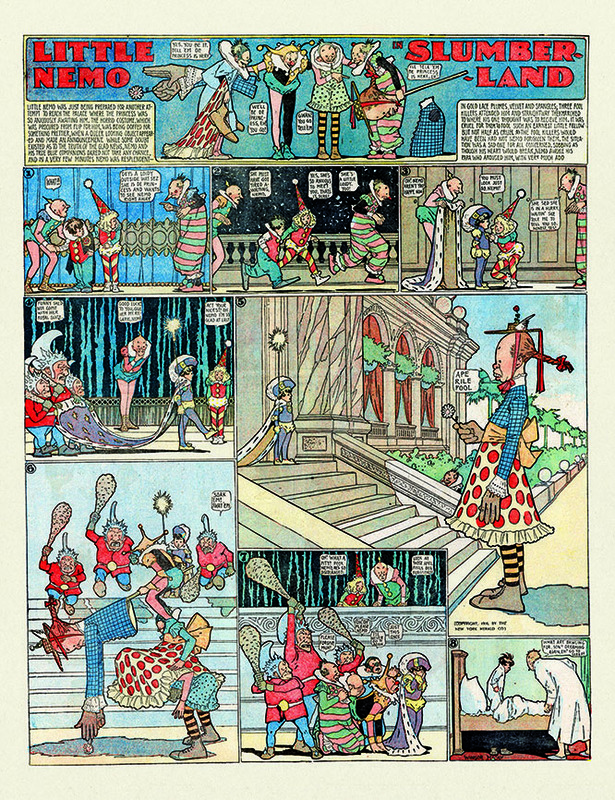 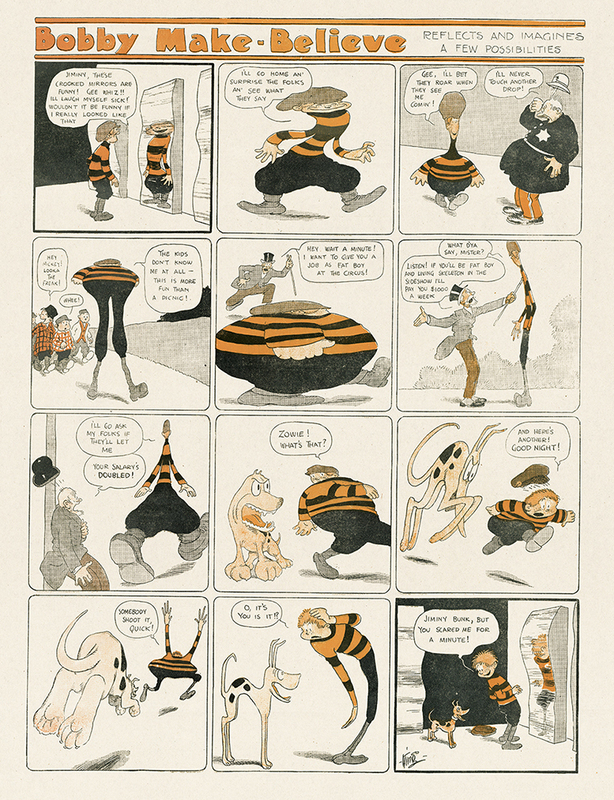 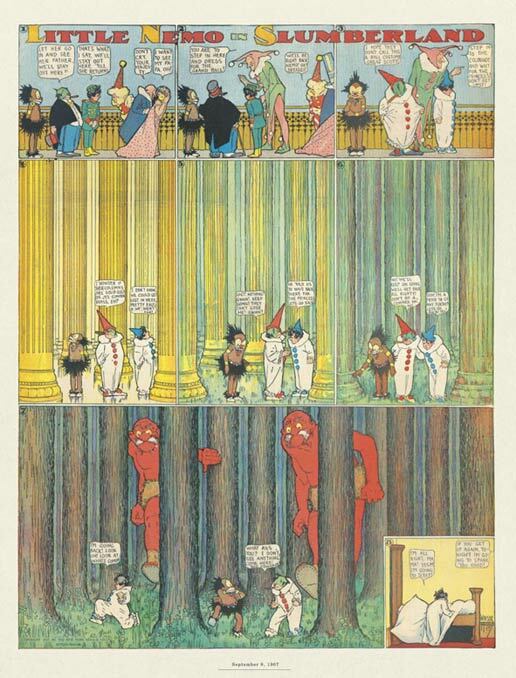 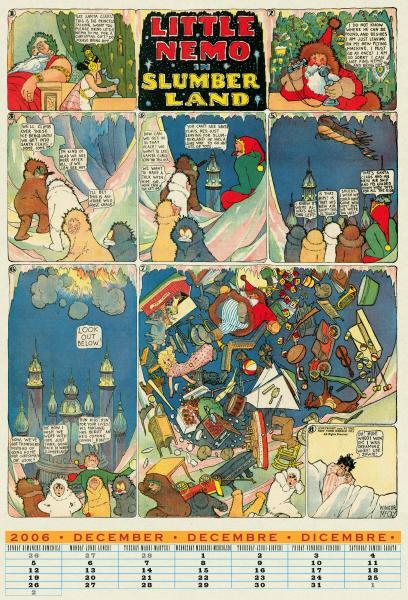 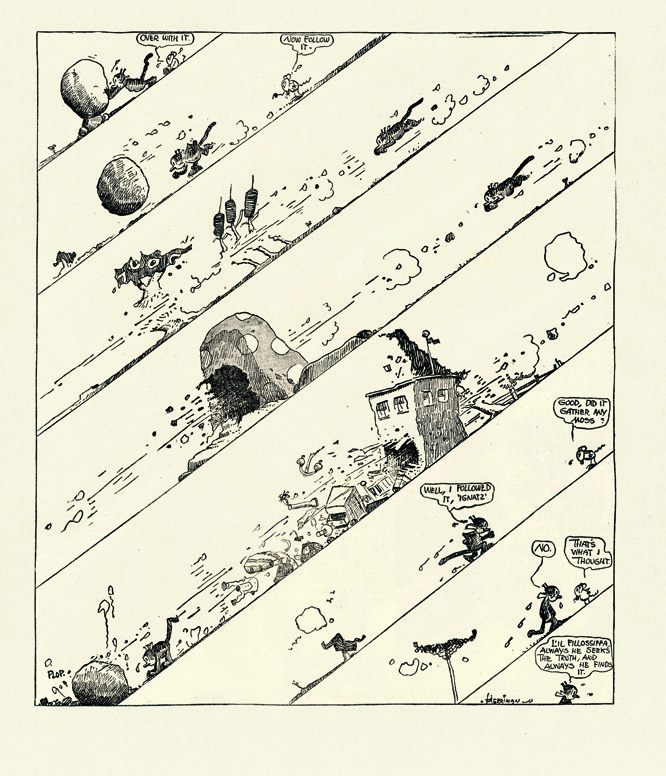 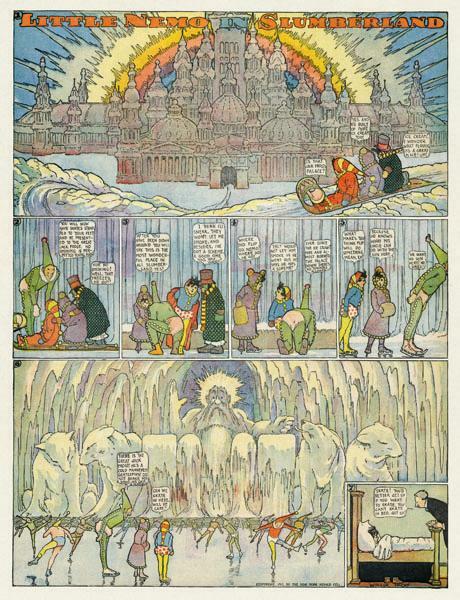 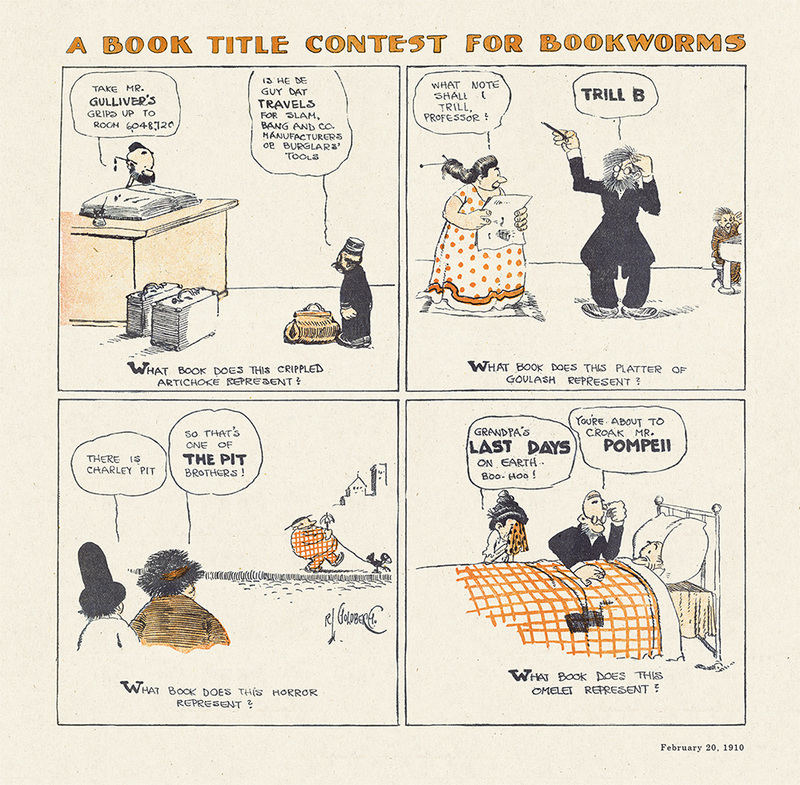 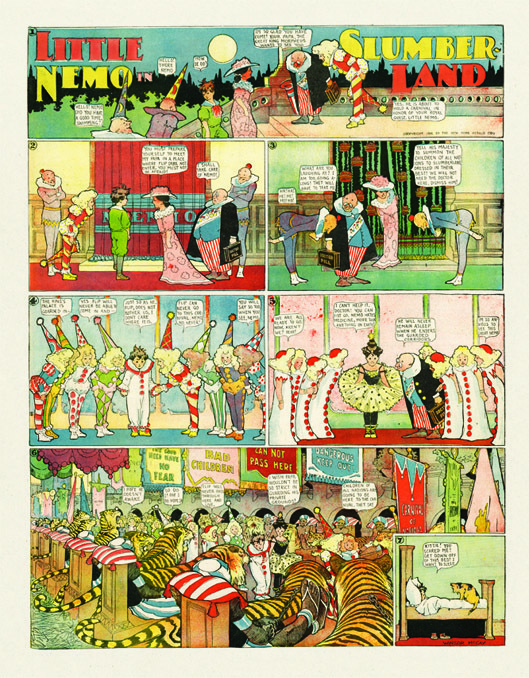 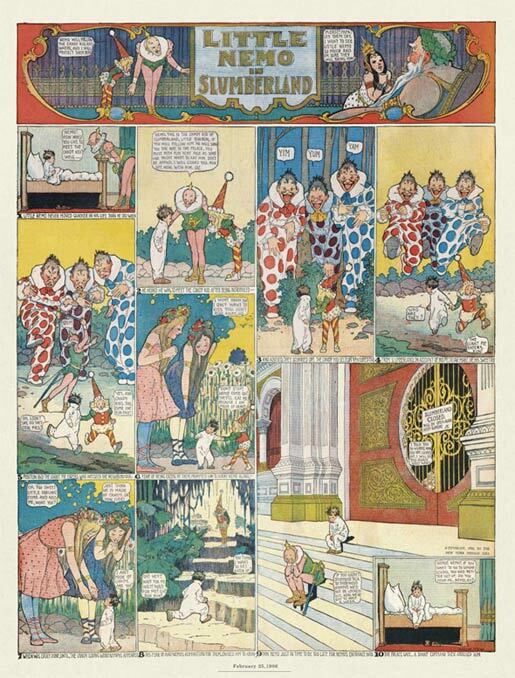 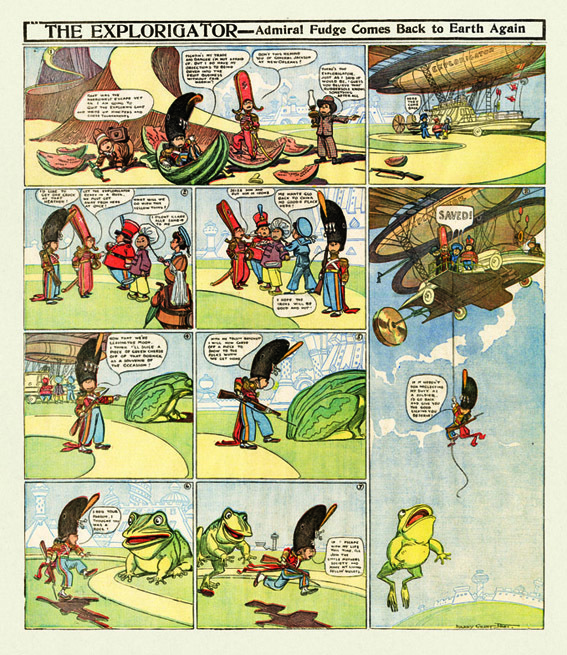 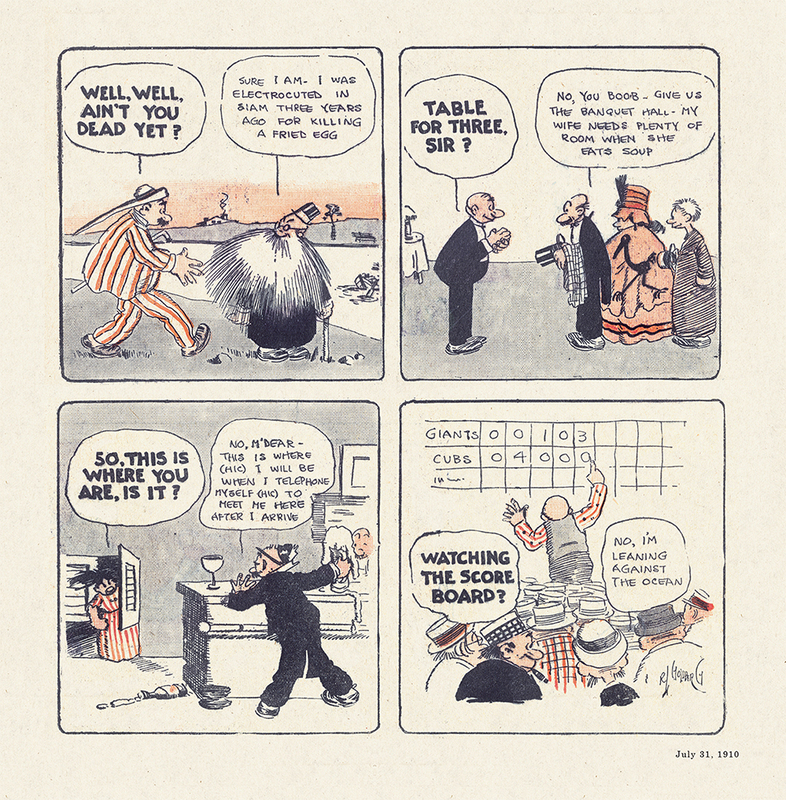 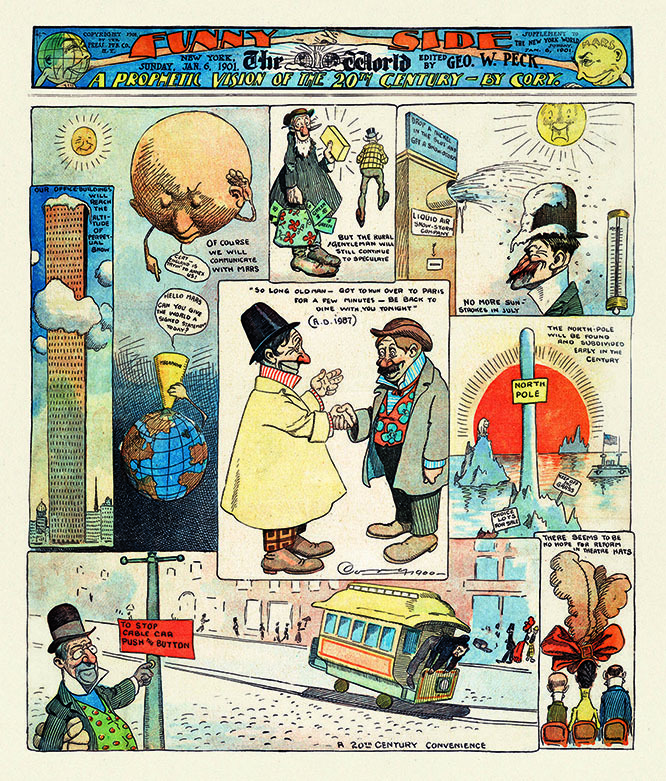 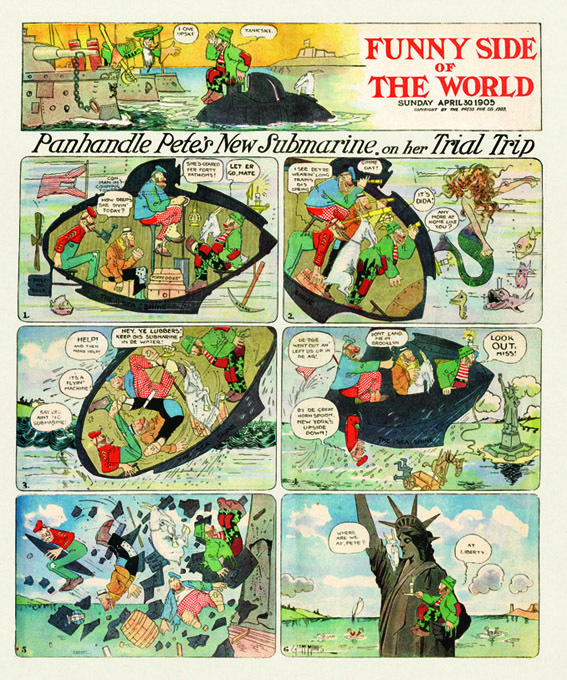 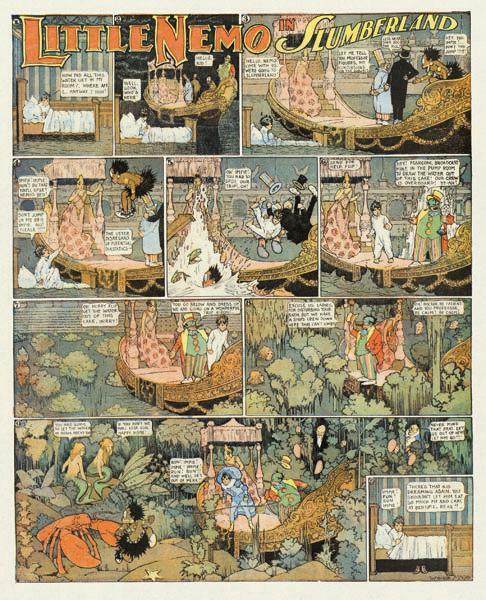 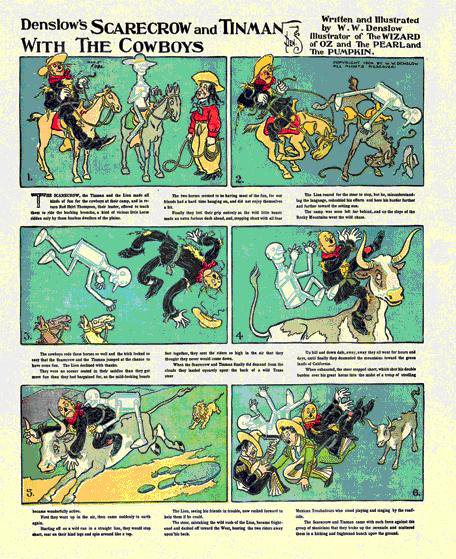 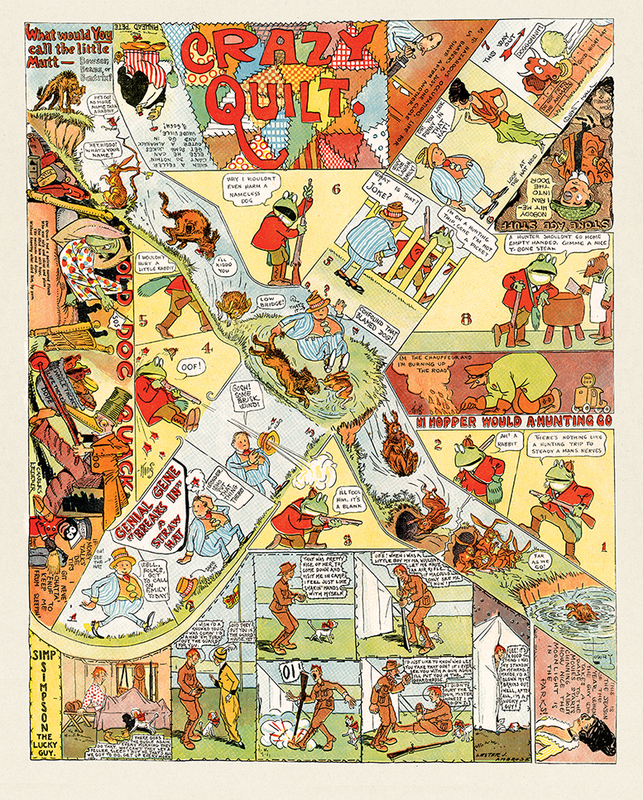 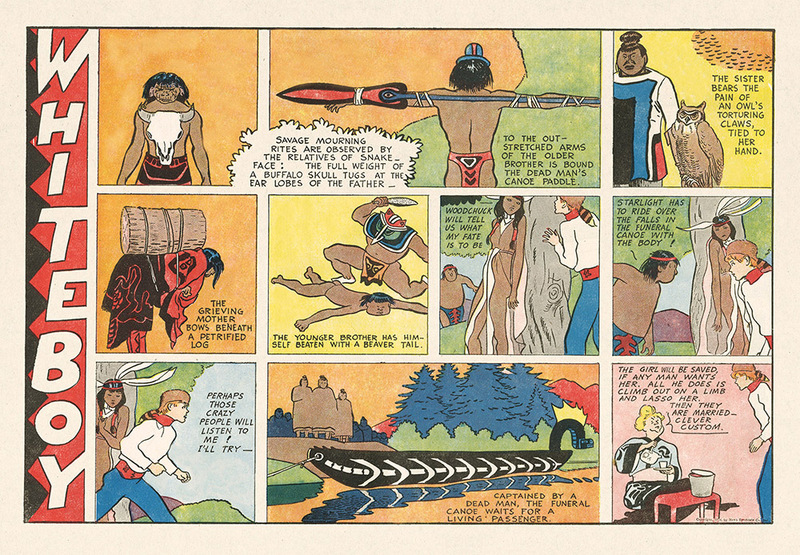 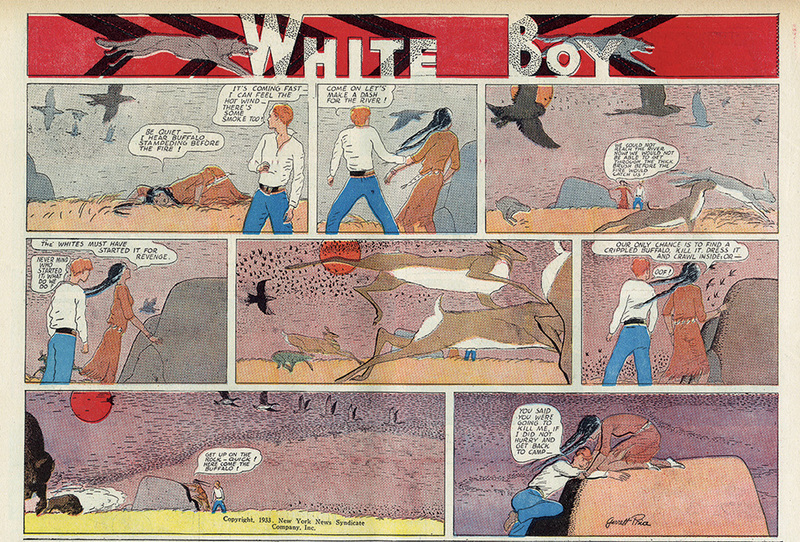 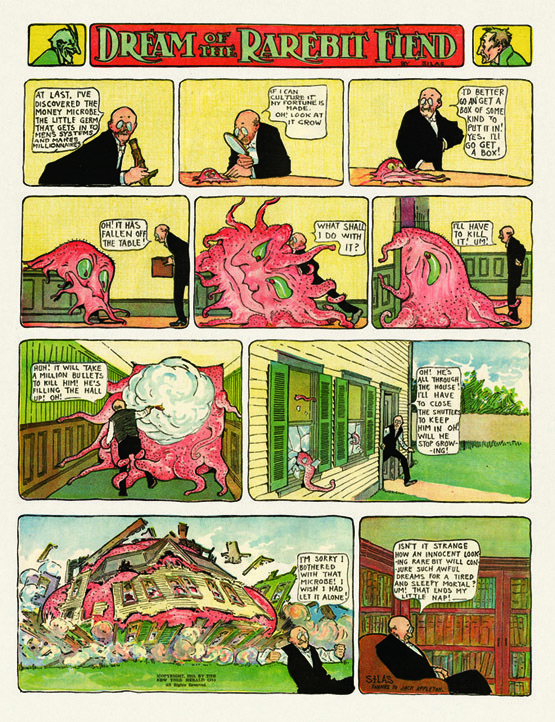 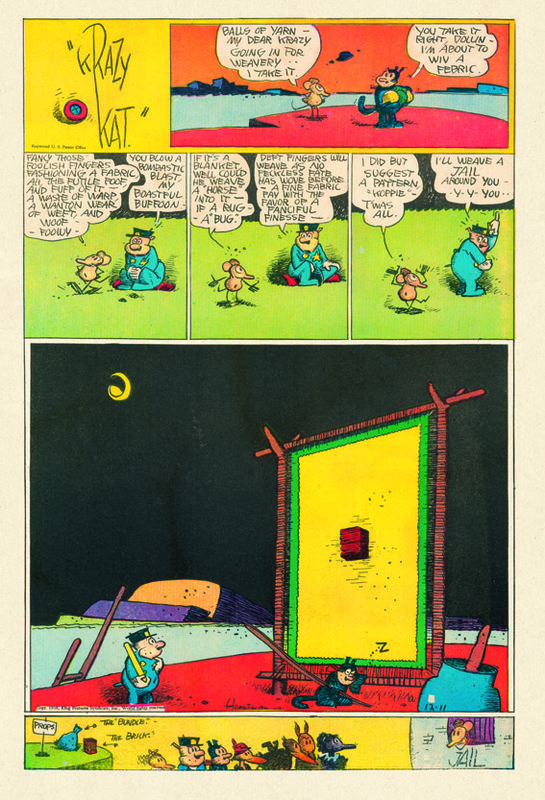 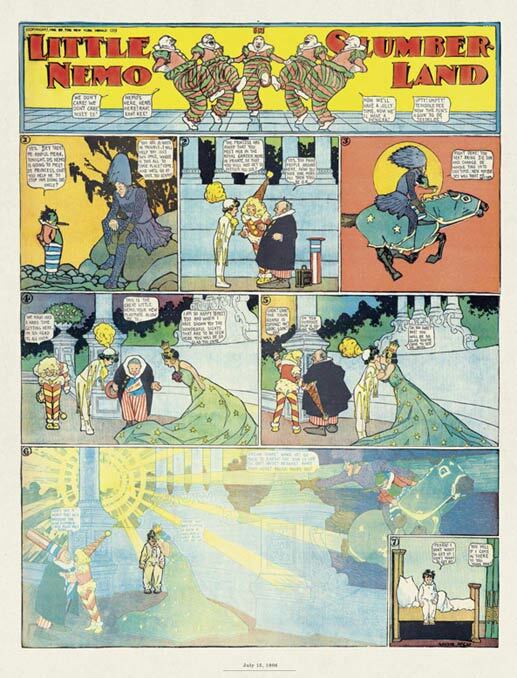 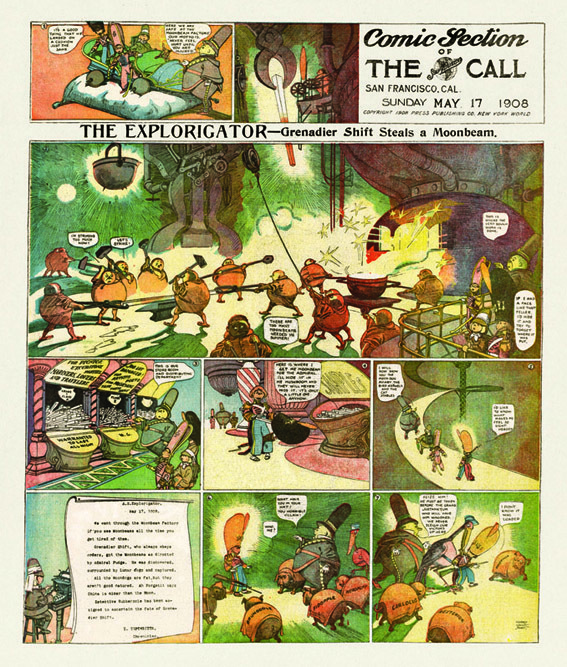 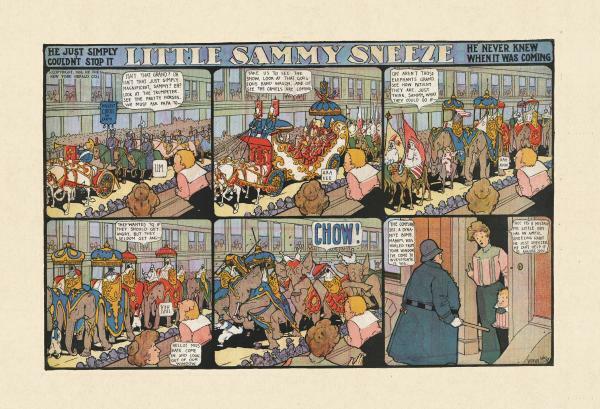 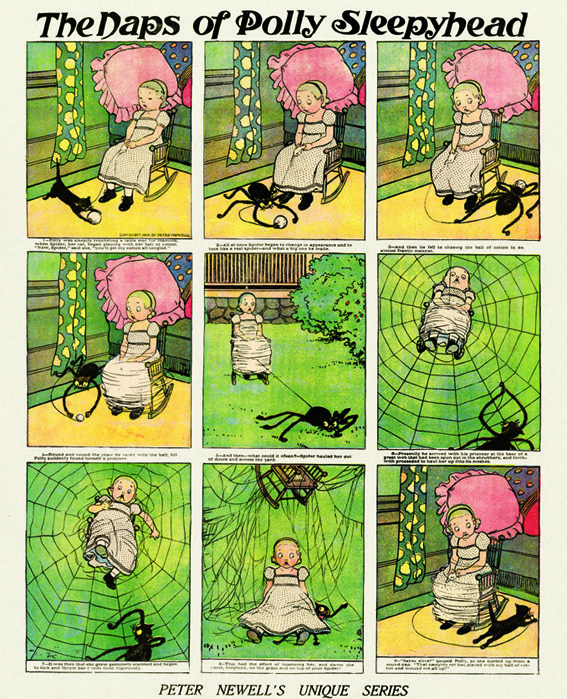 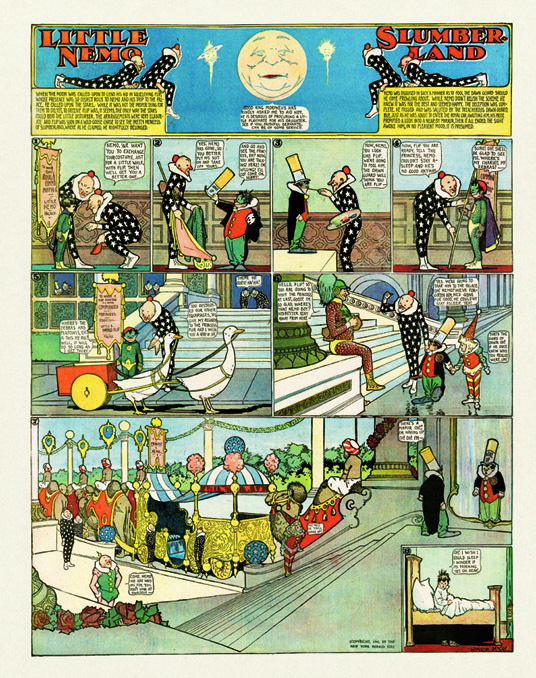 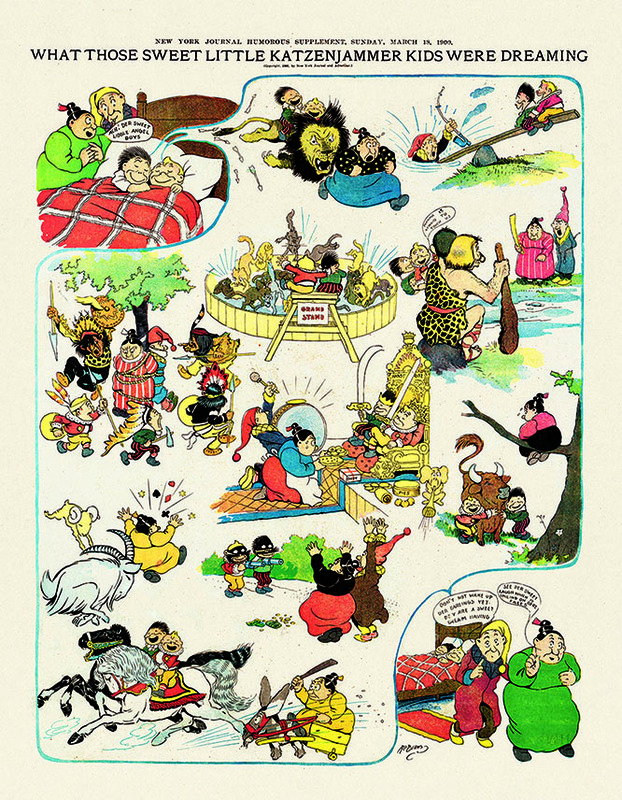 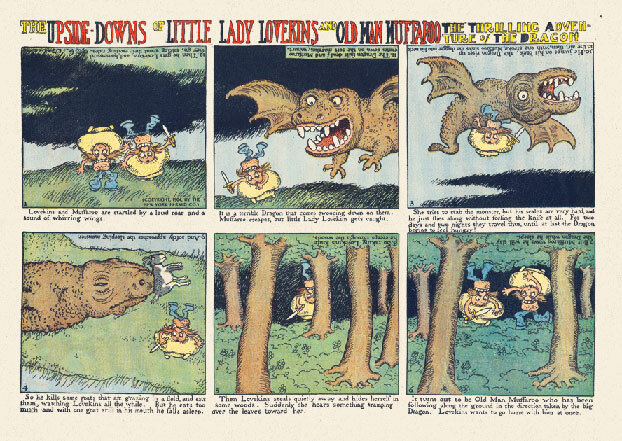 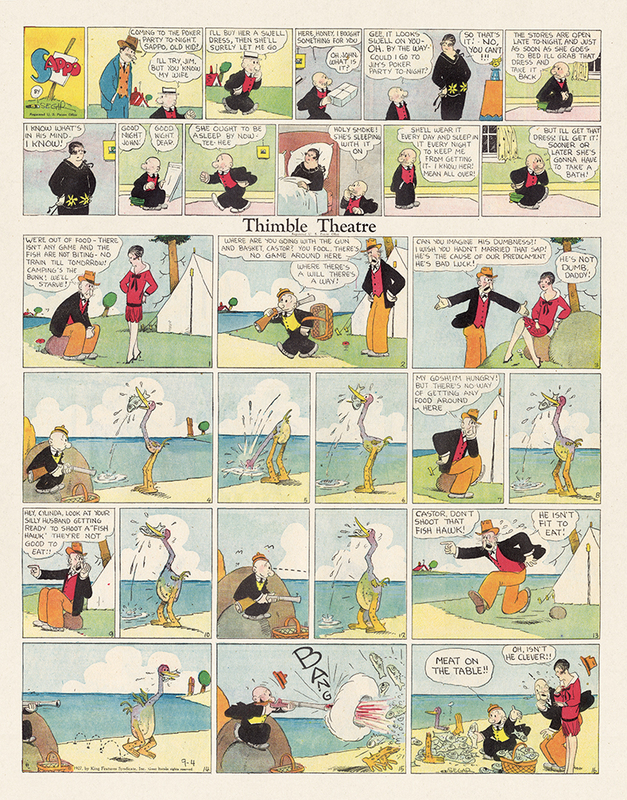 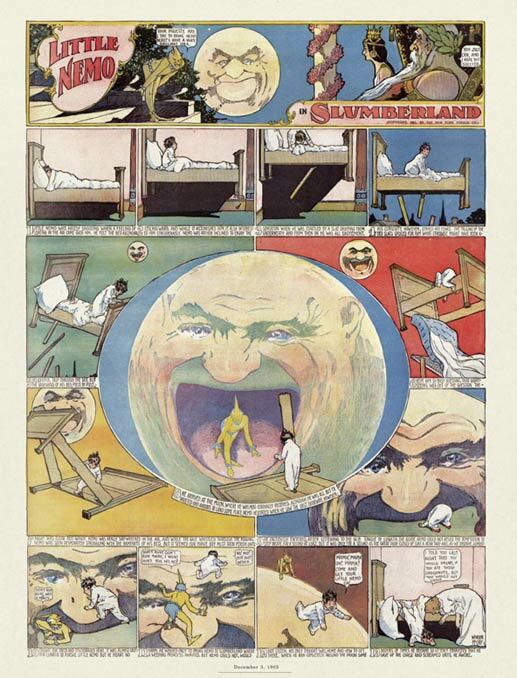 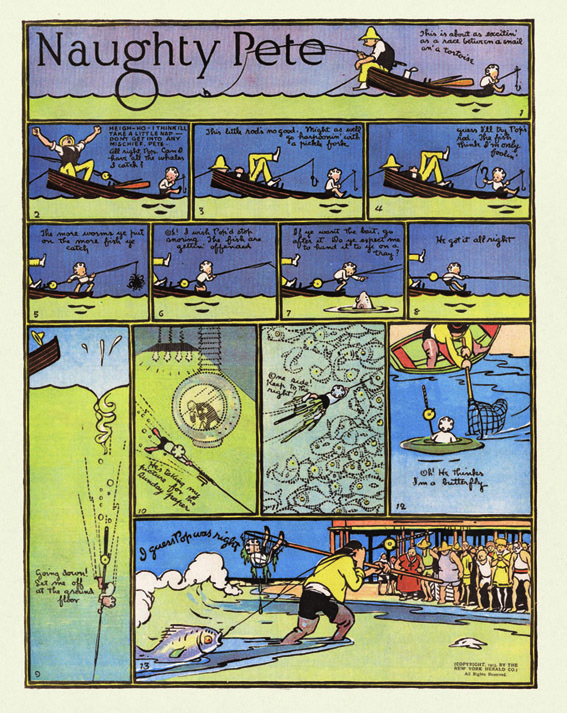 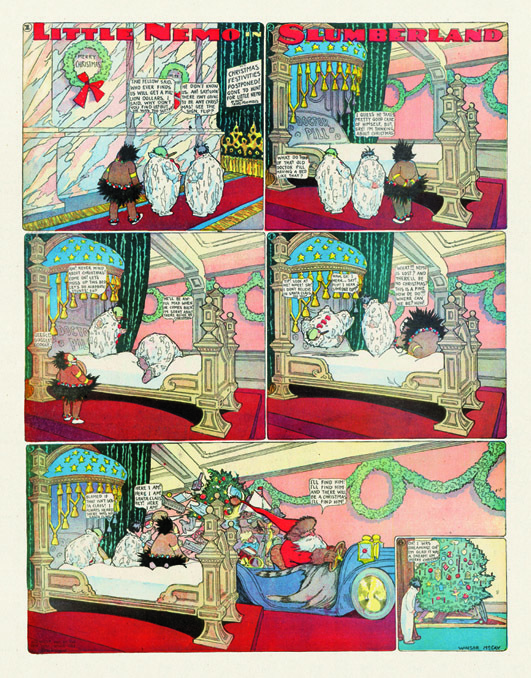 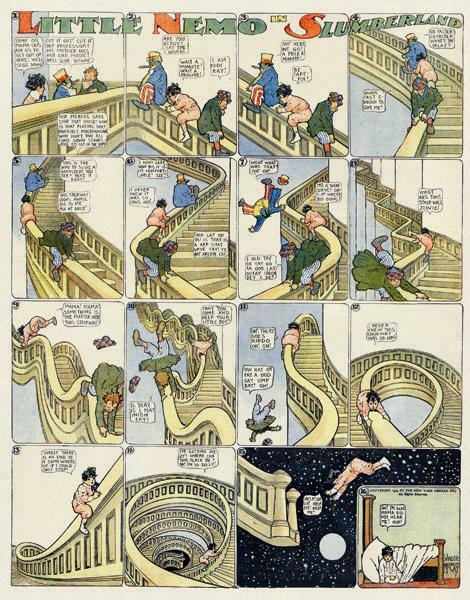 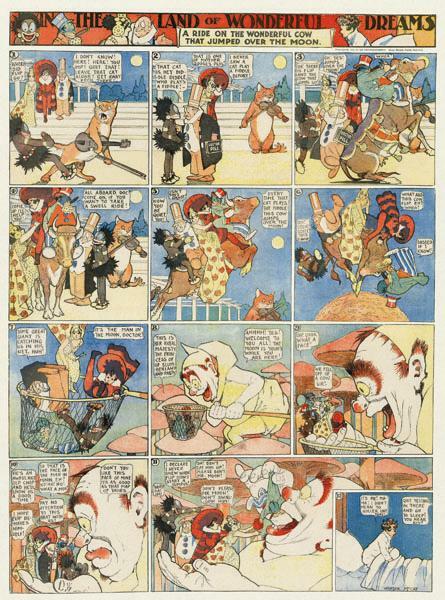 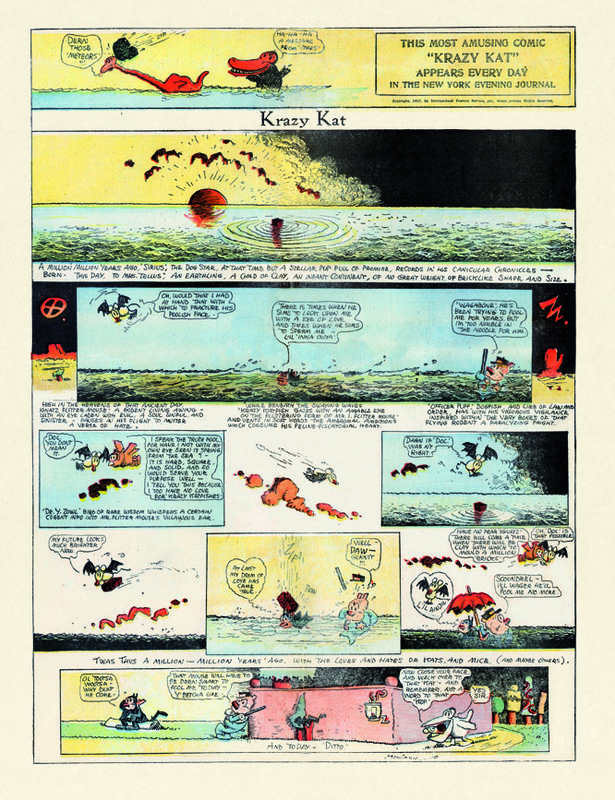 Though that his very best Sunday pages are being presented here in their original size and original color seems almost too good to be true, and it took Peter Maresca's first Little Nemo book to prove to me that this is, indeed, the ideal and proper format for these artists' work to be seen. 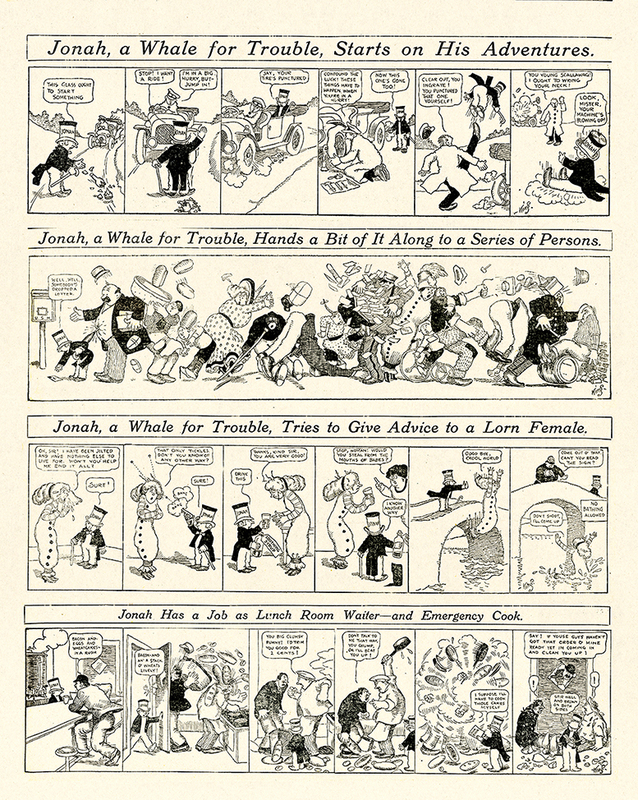 It was in Bill Blackbeard and Martin Williams' Smithsonian Book of Newspaper Comics that I first saw, studied and spilled ink upon samples of King's work in my clunky attempts to understand his quiet genius, though this Smithsonian book only reproduced a few of the Gasoline Alley pages, so I eventually went out in search of surviving original newsprint examples, which in the days before eBay was not an easy task. 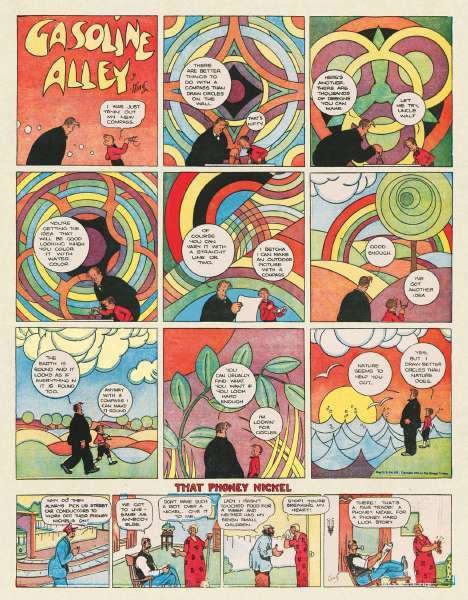 Eventually, however, I assembled a small collection of King's large, colorful works, and it was living with these that cemented for me his unquestionable, unpretentious greatness as an artist. 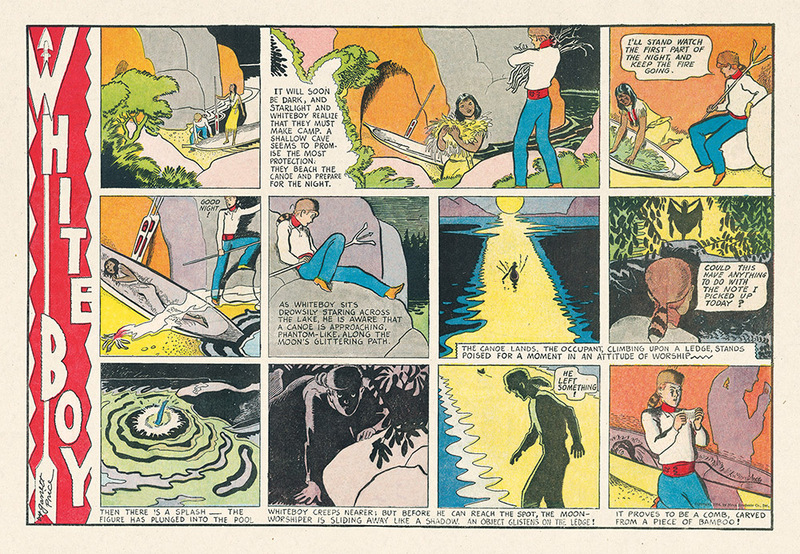 I purchased protective mylar sleeves that were more expensive than the original pages themselves, because just as the leaves that Walt and Skeezix walked through every autumn turned yellow and then brown, the woody paper they were printed on also rapidly darkened, as had all of the samples I'd hung up above my drawing table. 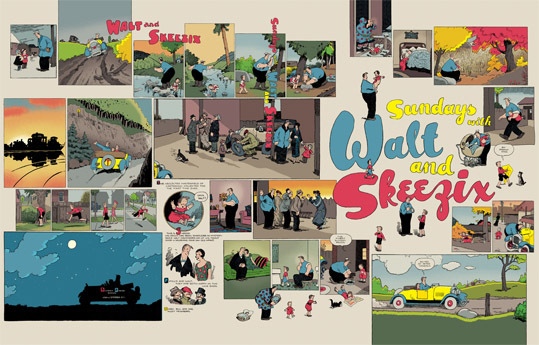 Unlike the series of daily reprints which unfold in the "real time" of one day per strip, in this book Walt leaps from bachelorhood to adoptive fatherhood and to marriage in only a few pages; Skeezix grows alarmingly taller and gains a brother in the flip of a thumb. 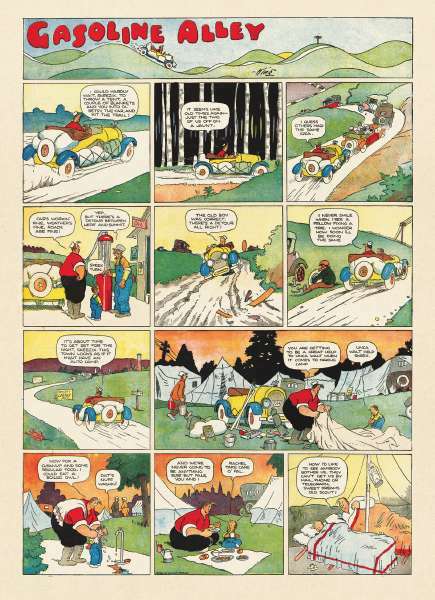 But "story" is not really important here; the engine that kept Gasoline Alley running smoothly for almost fifty years under King's kind guidance was not an attempt to trace or impose a thread of meaning on his characters' lives any more than one can impose a course or meaning on one's own. 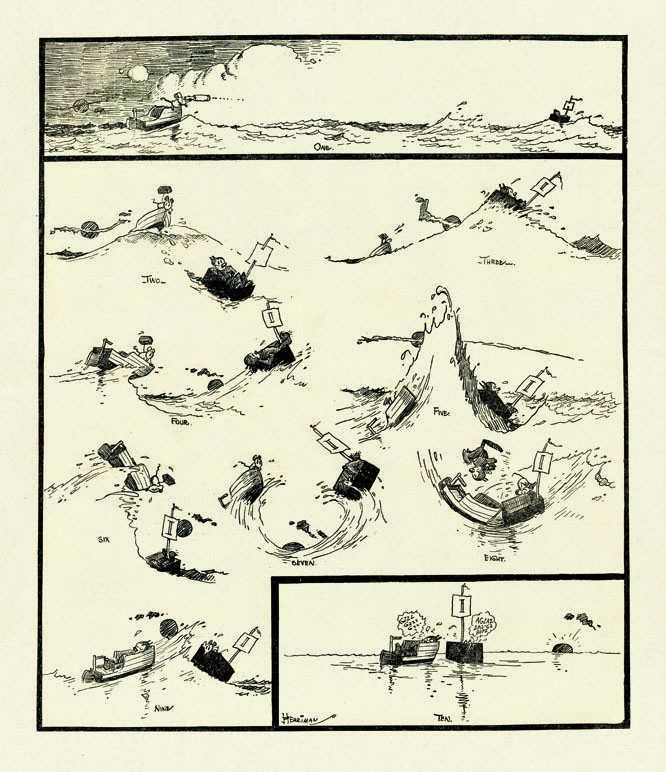 For lack of a better analogy, some writers tell stories and other writers write -- that is, they try to capture the texture and feeling of life within the limited means of their literary tools, and the story lives somewhere within. 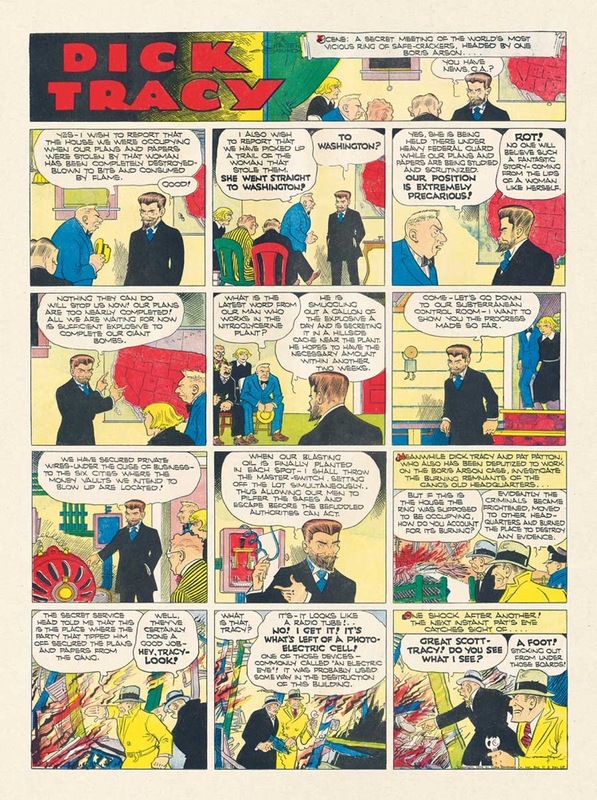 To my mind, King was really the first real "writer" in the comics, and its in these vista-filling sunday pages that he allows himself to write most eloquently. 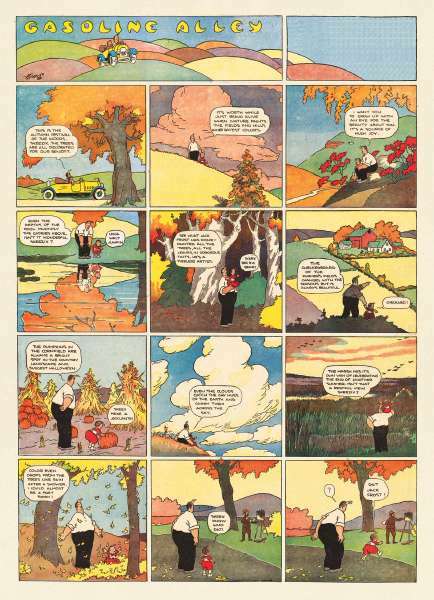 How many other cartoonists would dare make the colors of autumn the subject of their work? 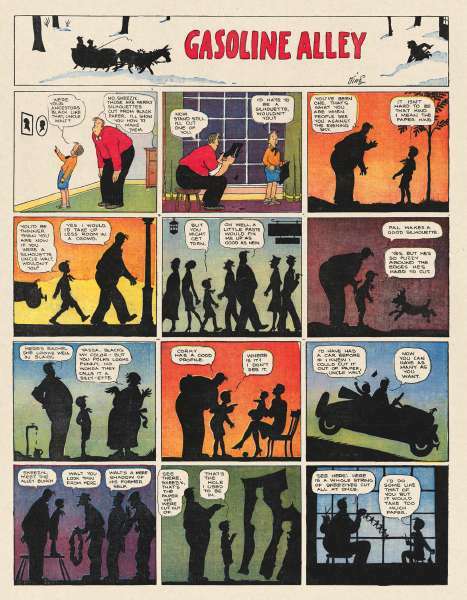 How lucky were the readers who received these temporary observations of life on their doorsteps every week; it seems almost inconceivable now that strips trading on such tenderness appeared in common newspapers.Which is not to say that Gasoline Alley is not funny.